Leo Beakeland (1863 -1944), a Belgian who had moved to America, was the inventor of Bakelite. 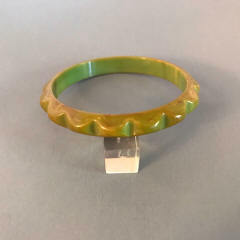 Made by the condensation of phenol and formaldehyde in the presence of a catalyst, it was used for everything from tools and telephones to jewelry. 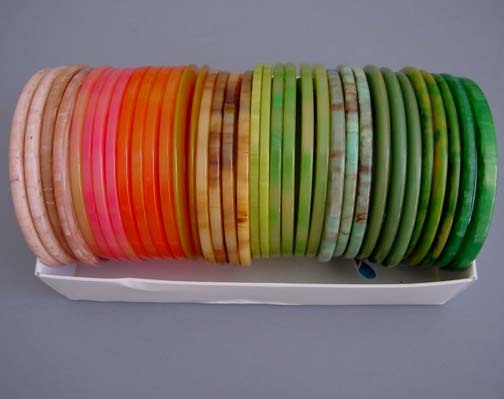 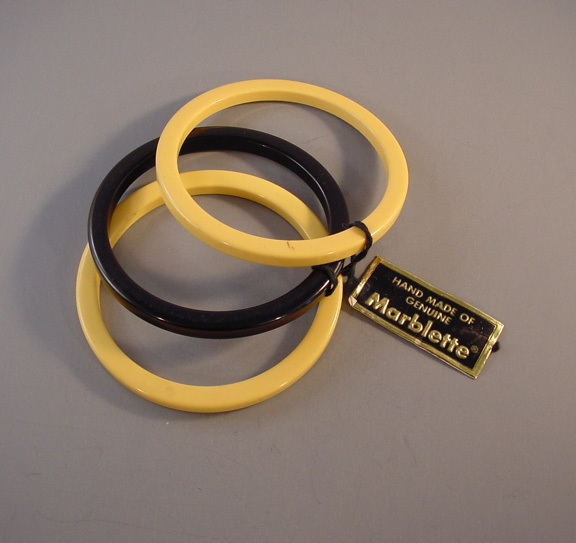 "Bakelite" is frequently used as a generic name for all phenol formaldehyde, including Catalin and Marblette, which came later and in a wider range of colors. 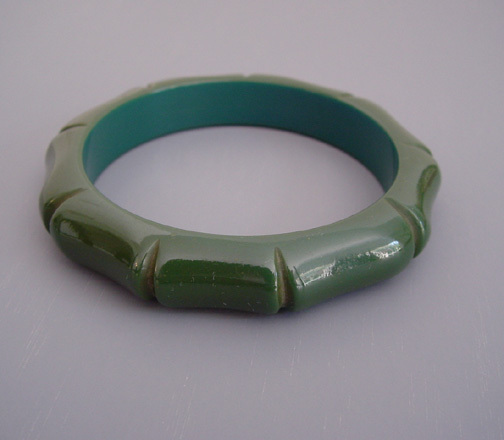 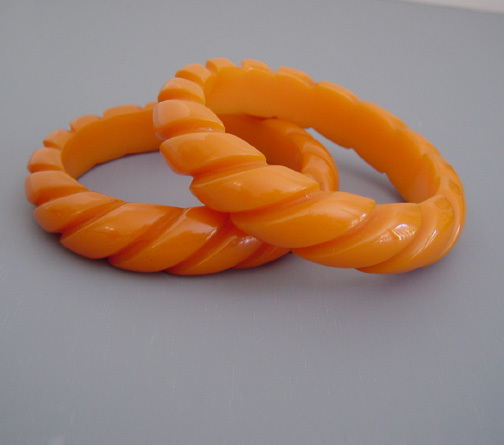 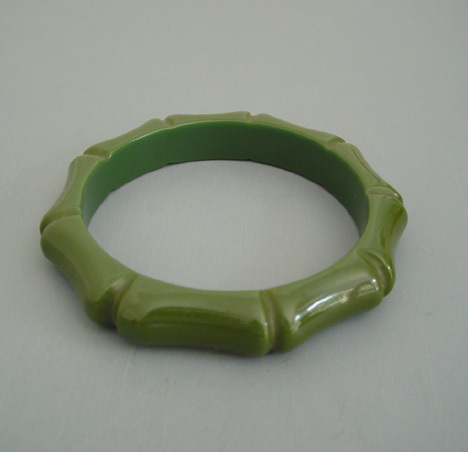 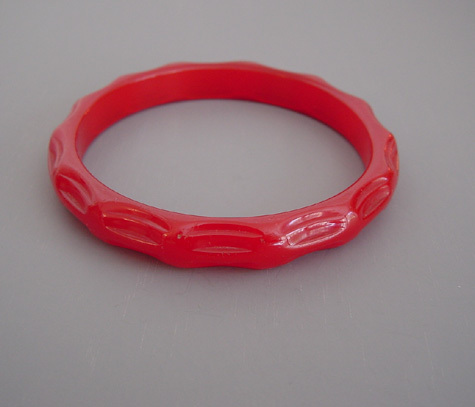 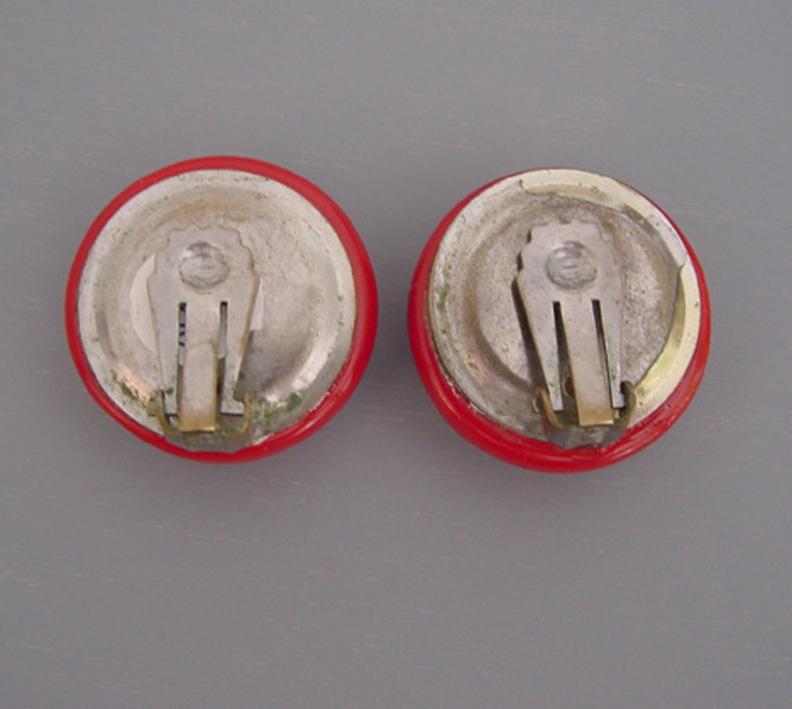 Bakelite is a thermoset plastic, meaning that once cast or molded and hardened, it will not melt, burn or dissolve. 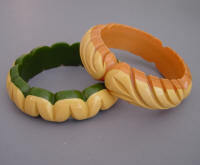 It can only be worked by carving, sawing, tumbling, painting and gluing. 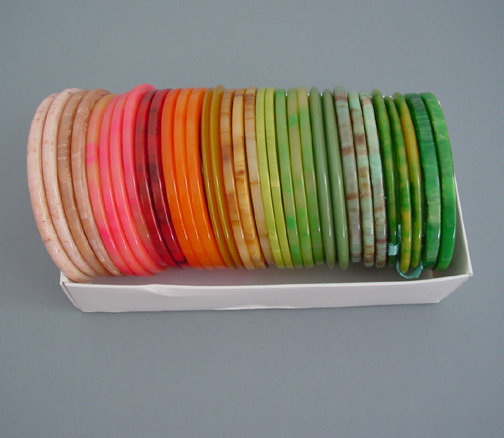 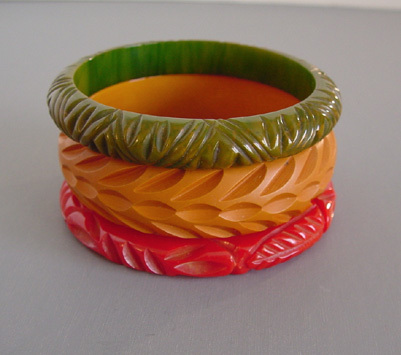 One type of bakelite is called "Prystal", often described as a dichroic (color changing) bakelite, and also as a fully transparent bakelite. 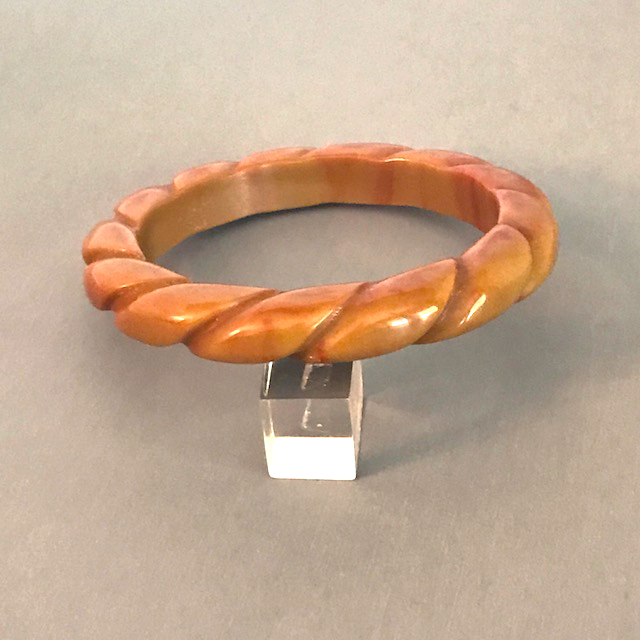 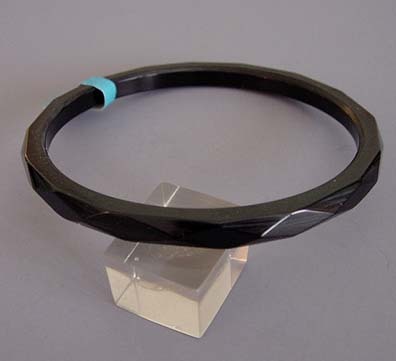 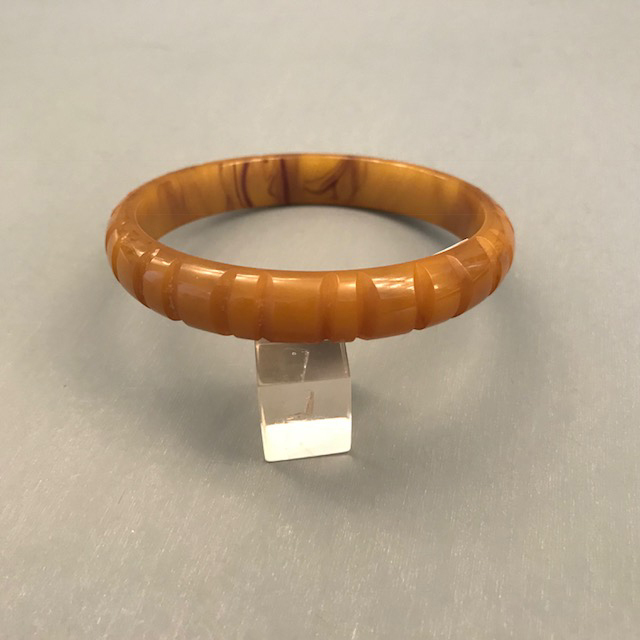 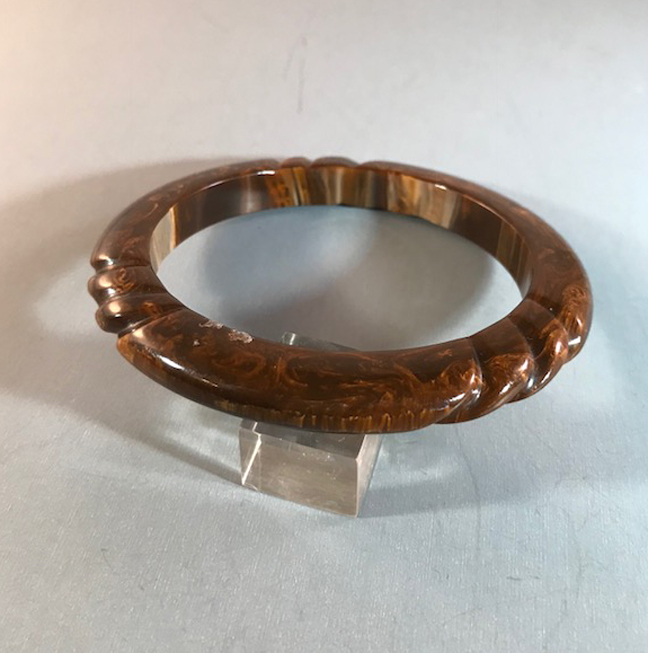 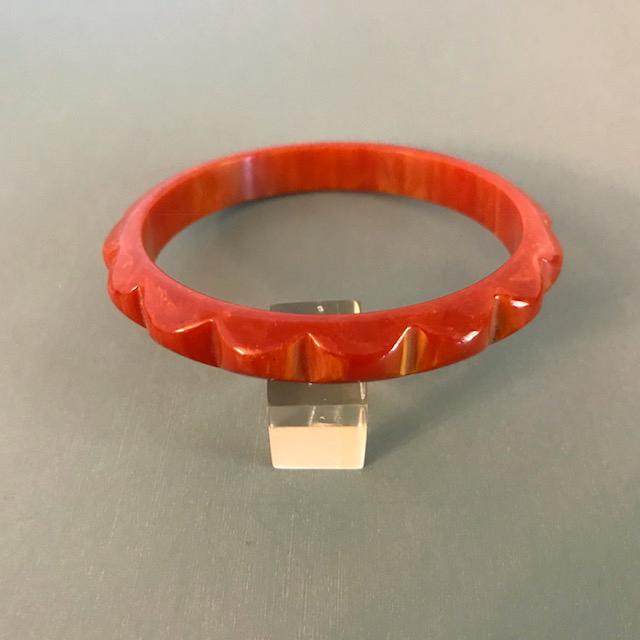 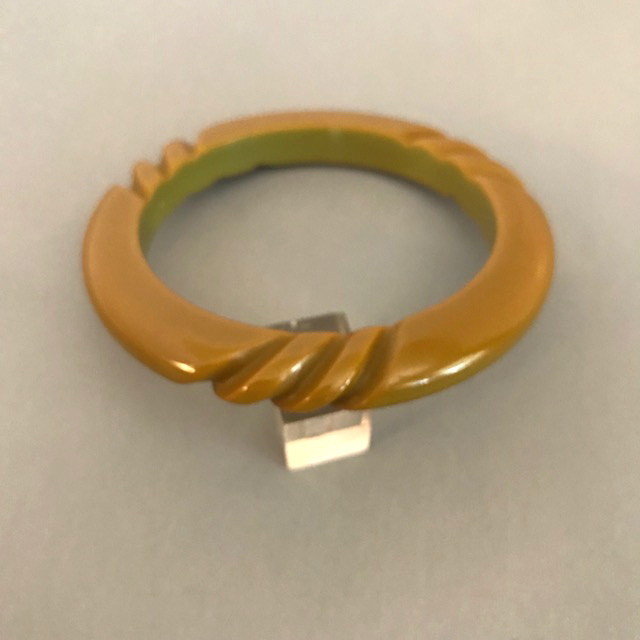 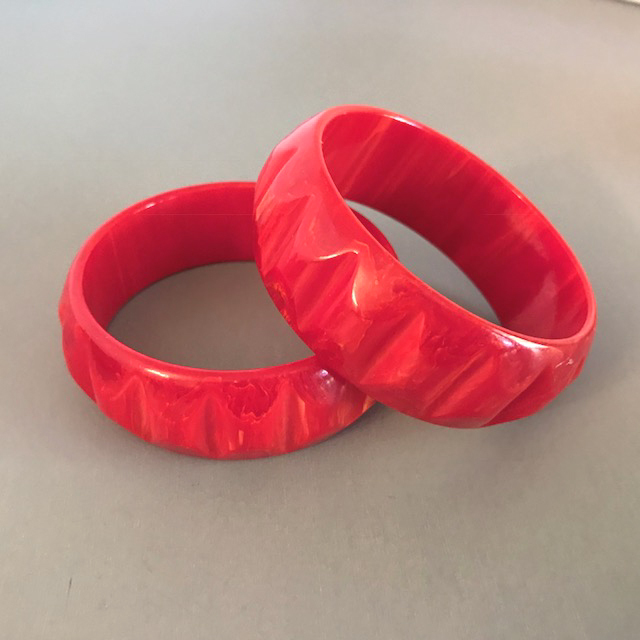 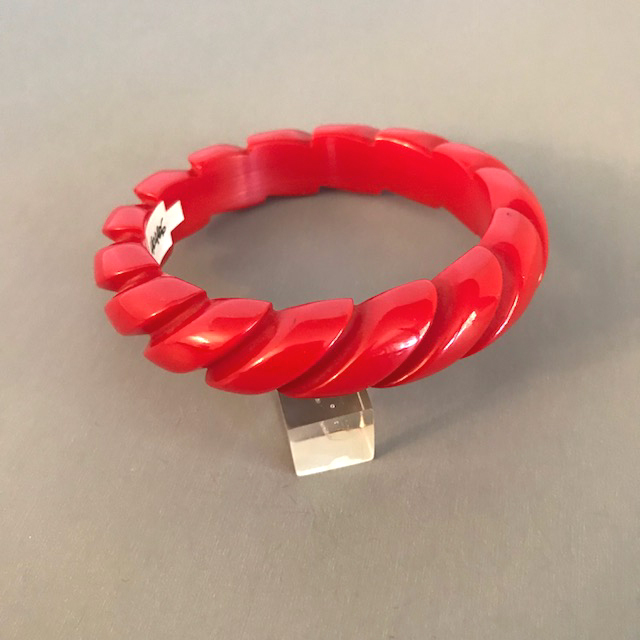 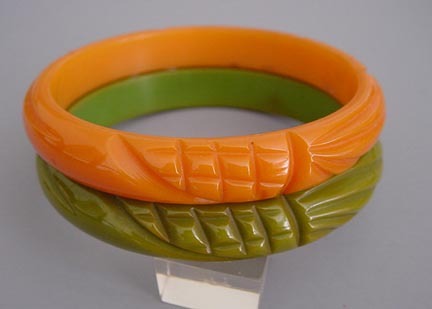 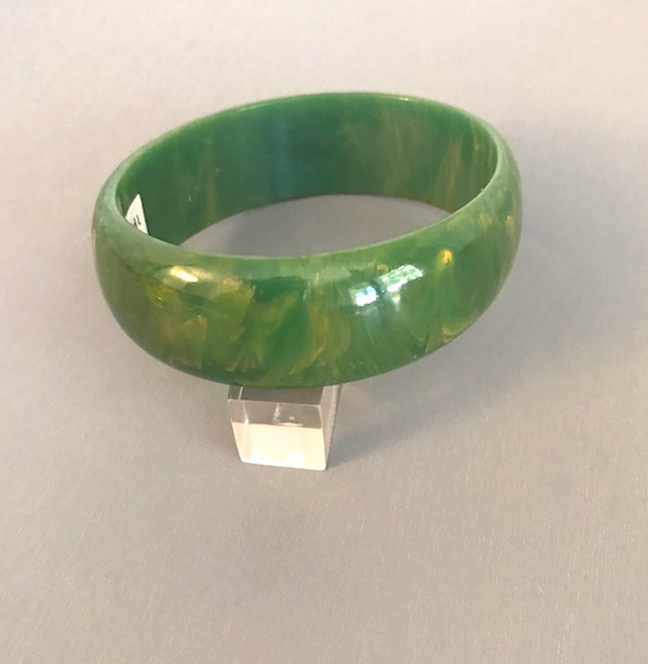 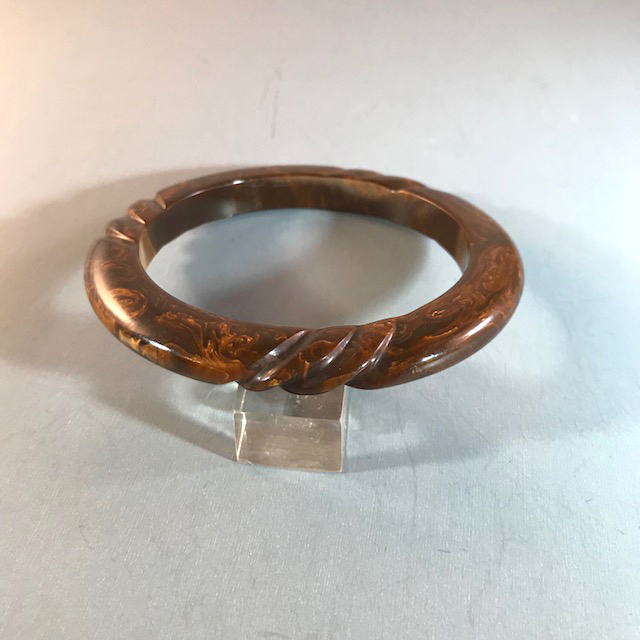 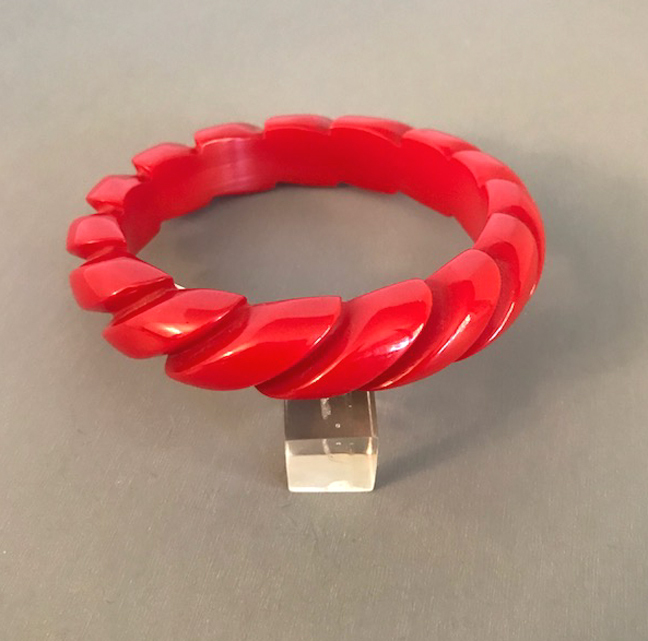 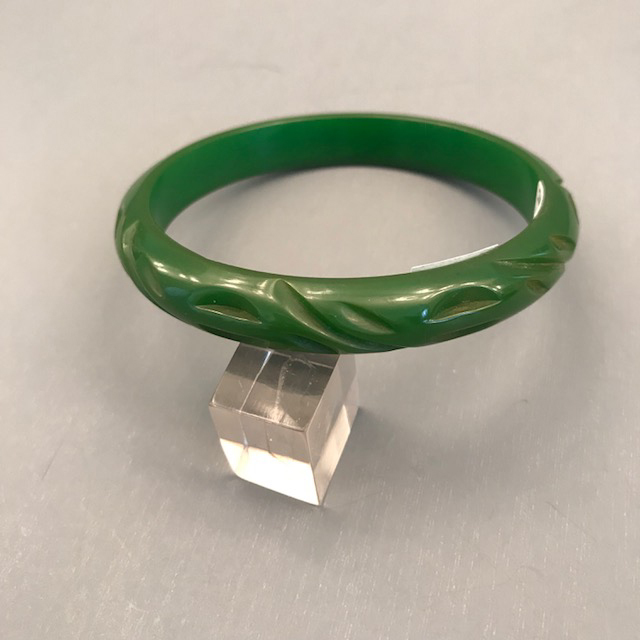 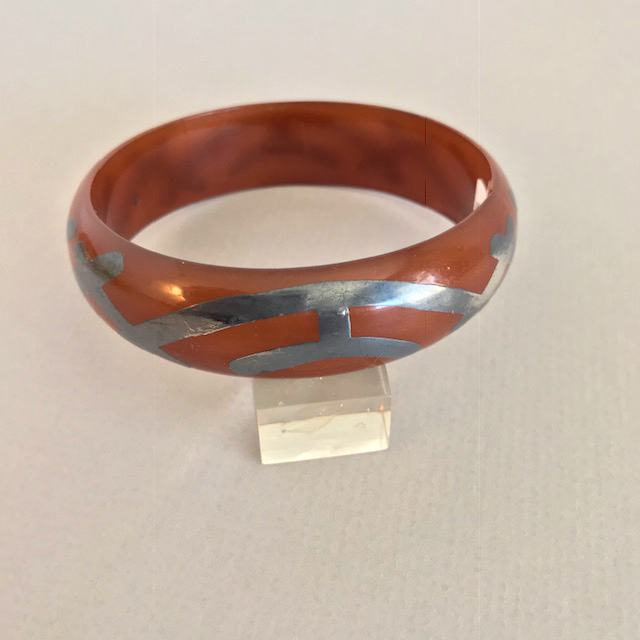 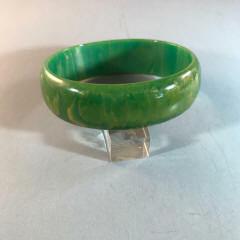 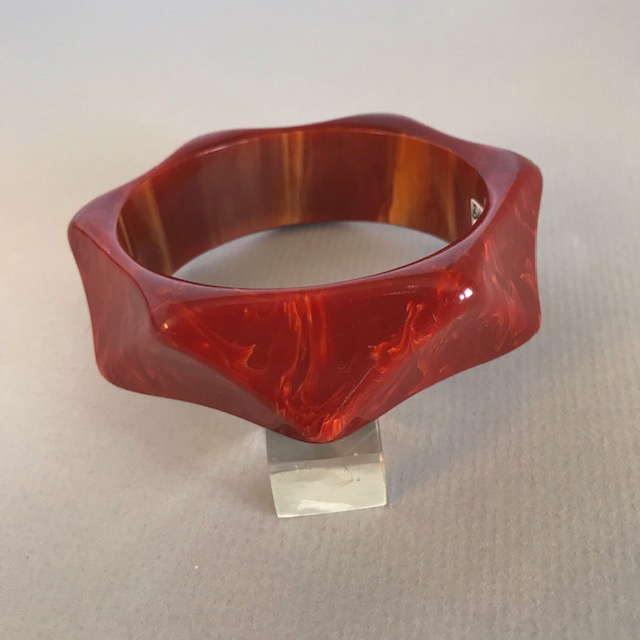 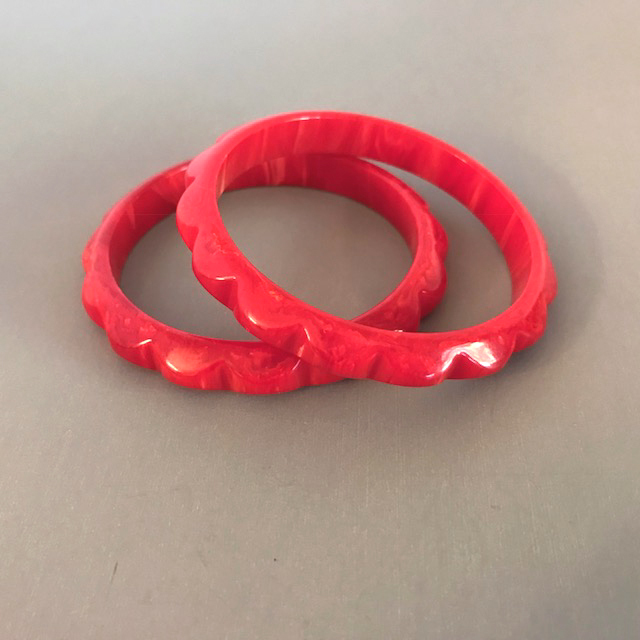 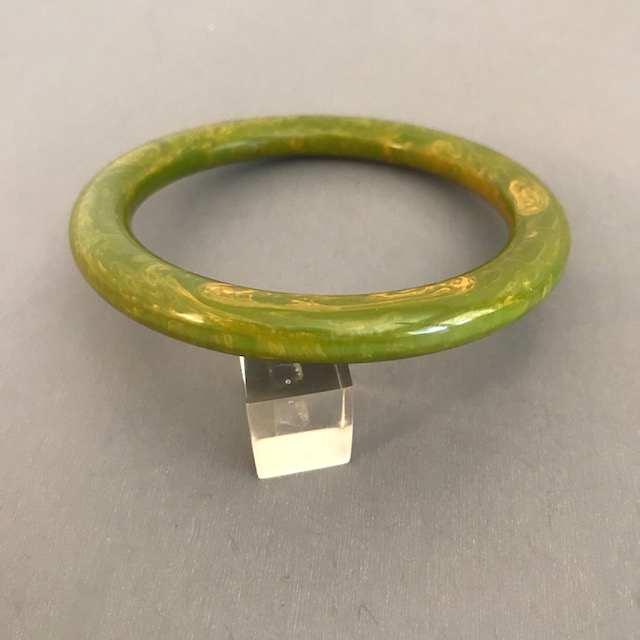 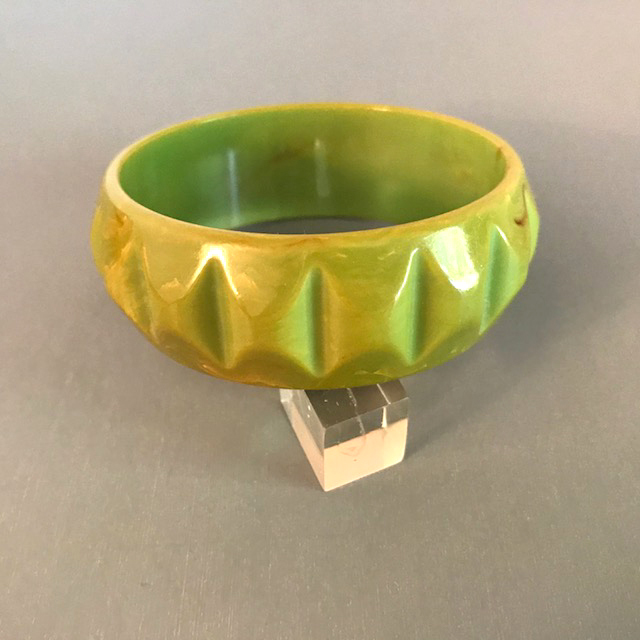 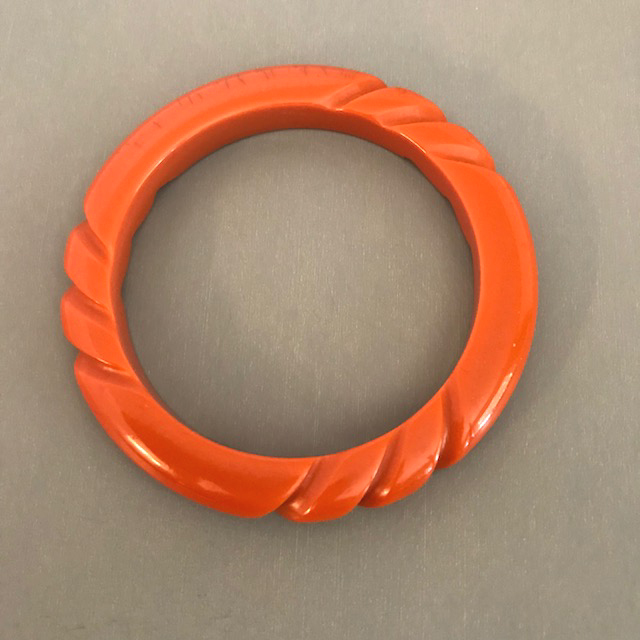 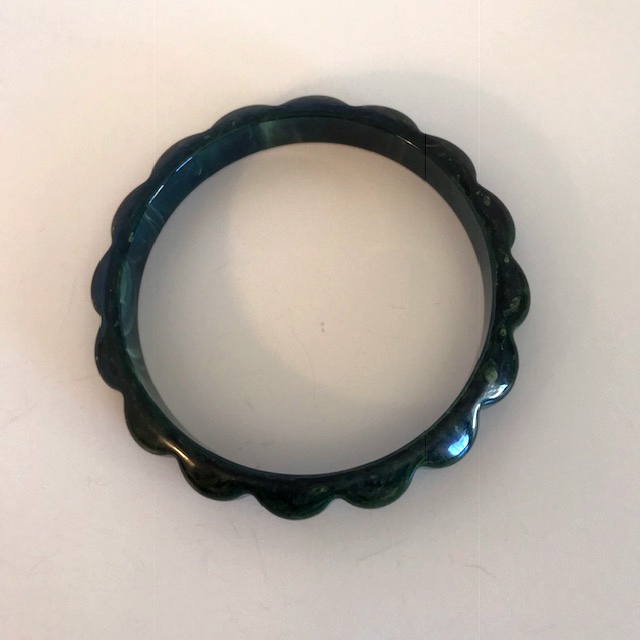 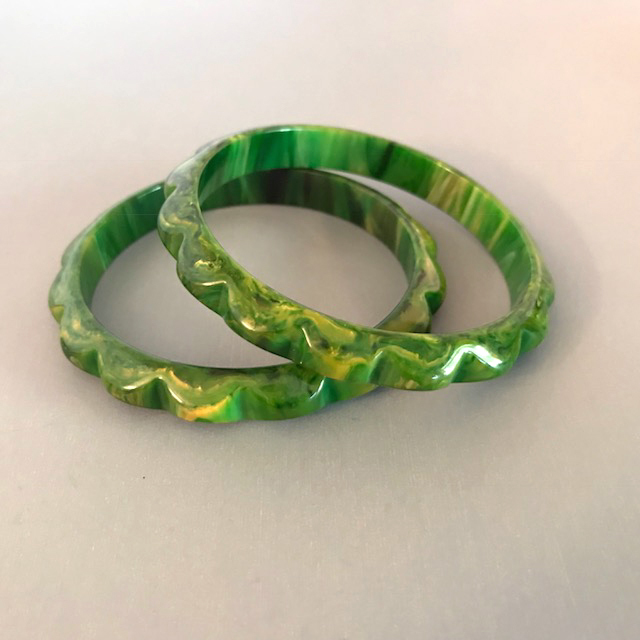 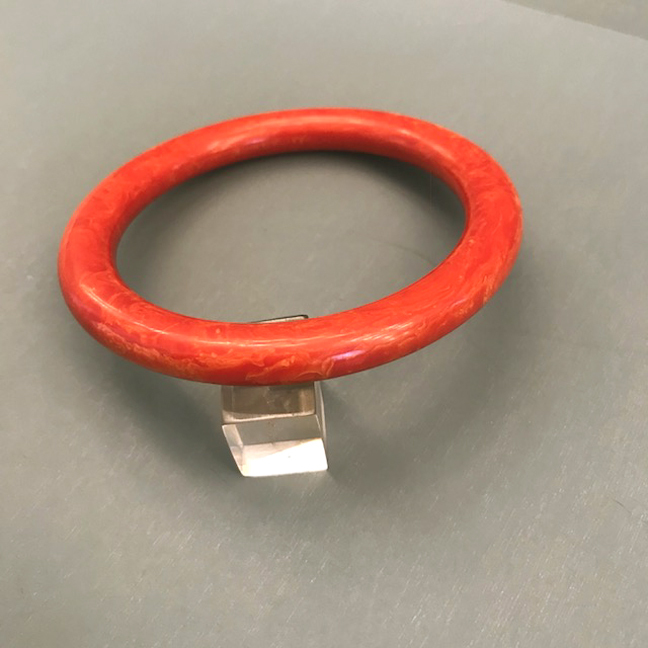 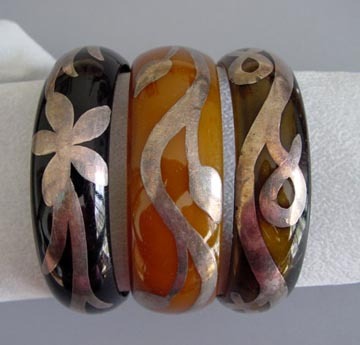 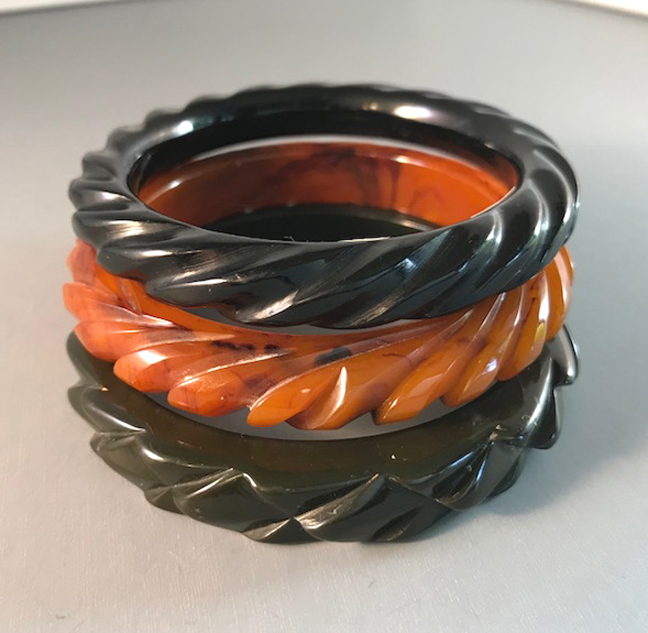 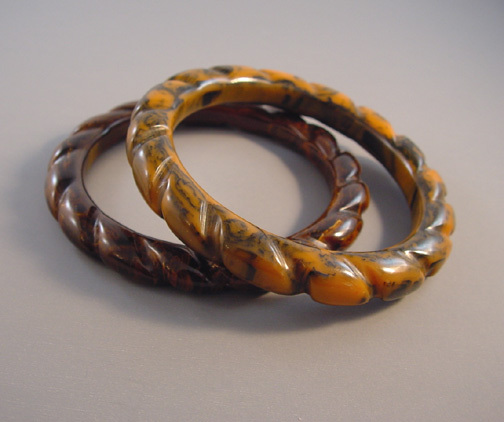 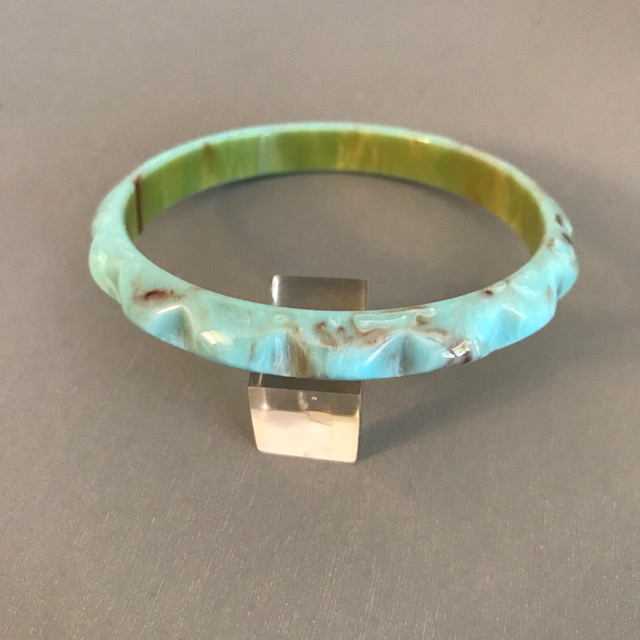 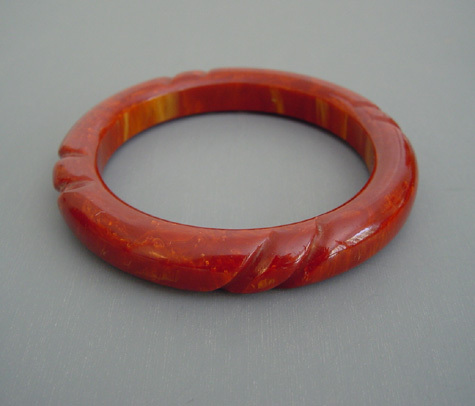 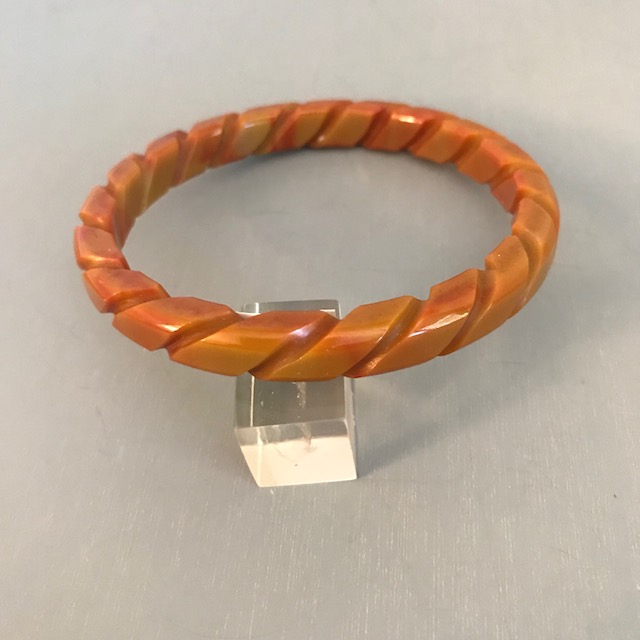 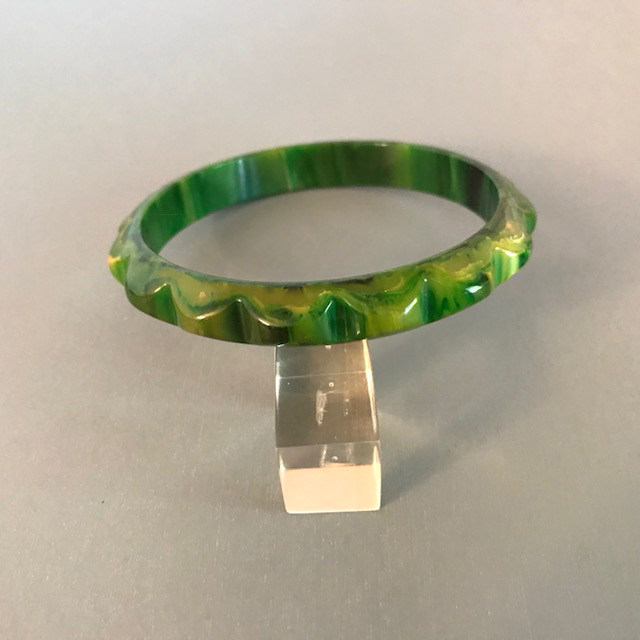 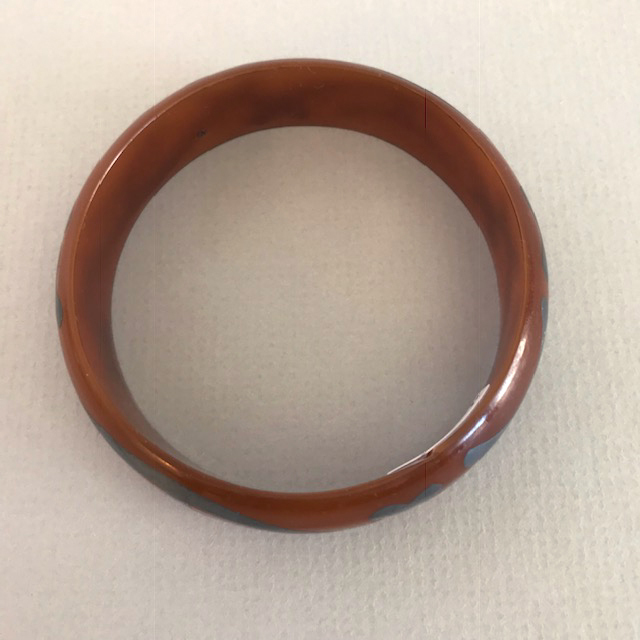 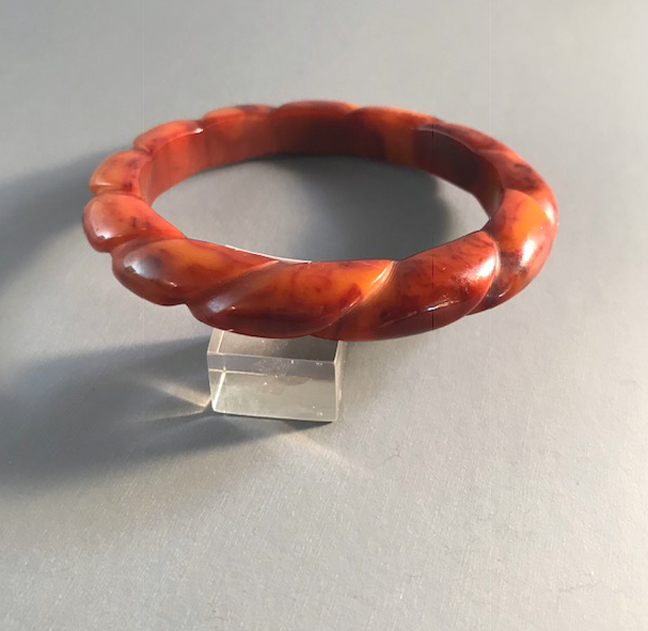 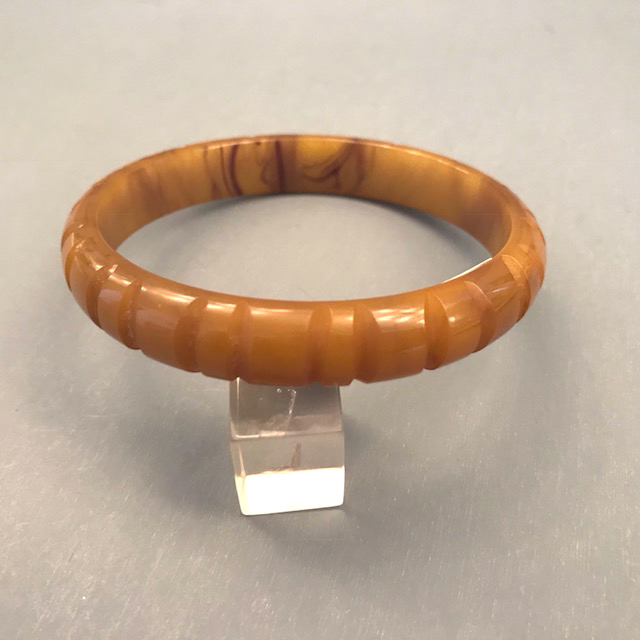 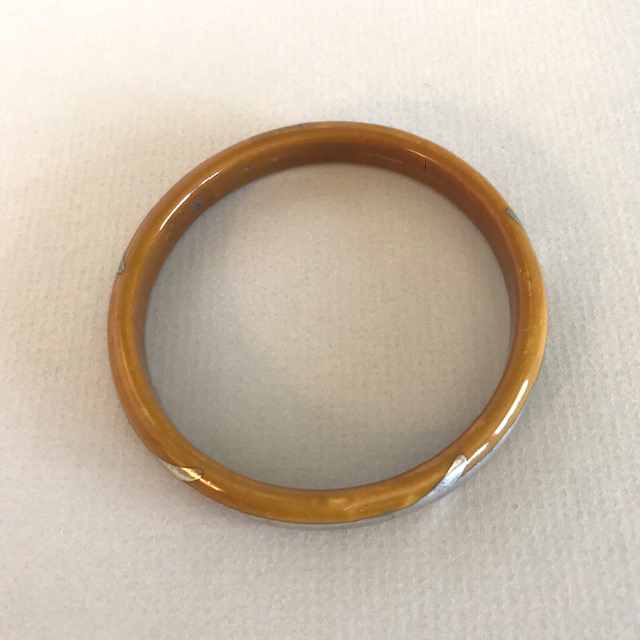 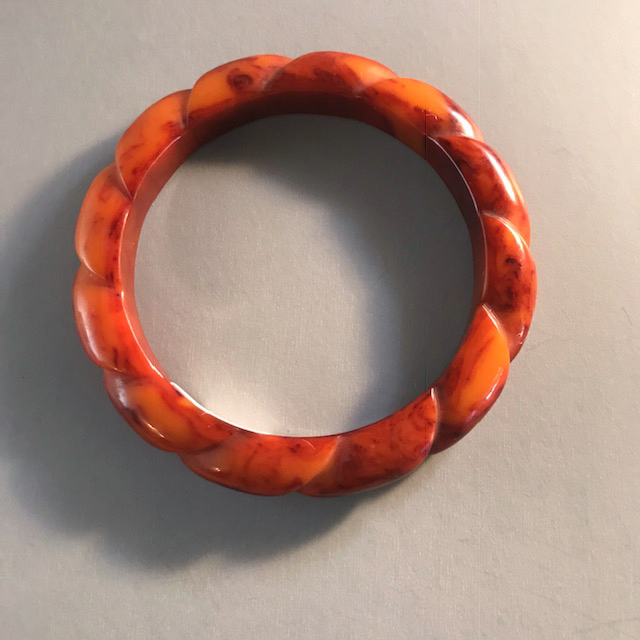 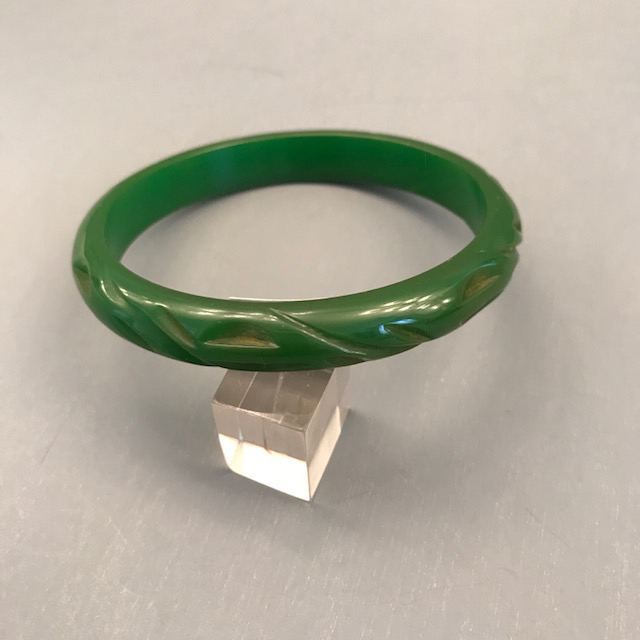 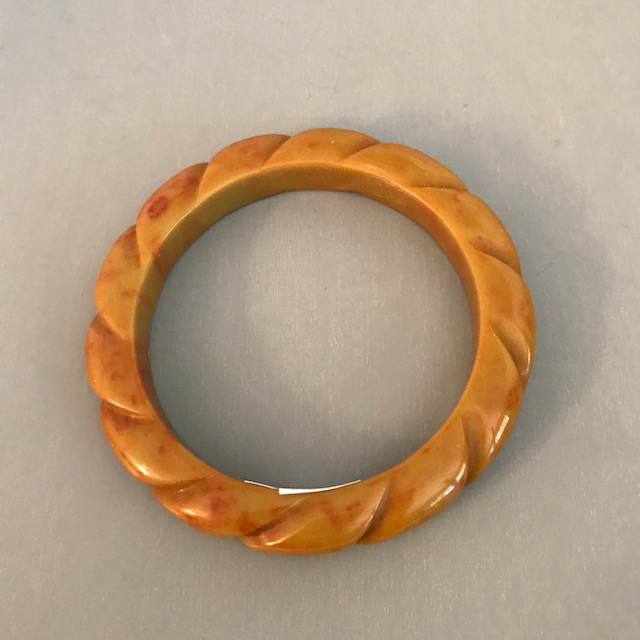 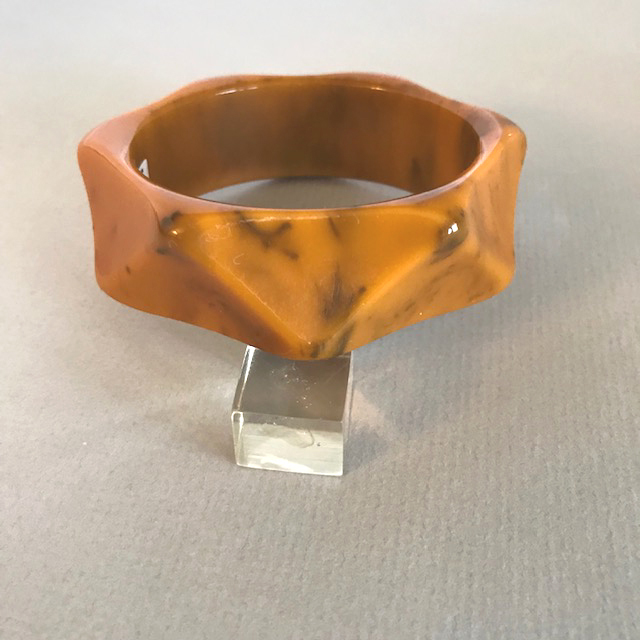 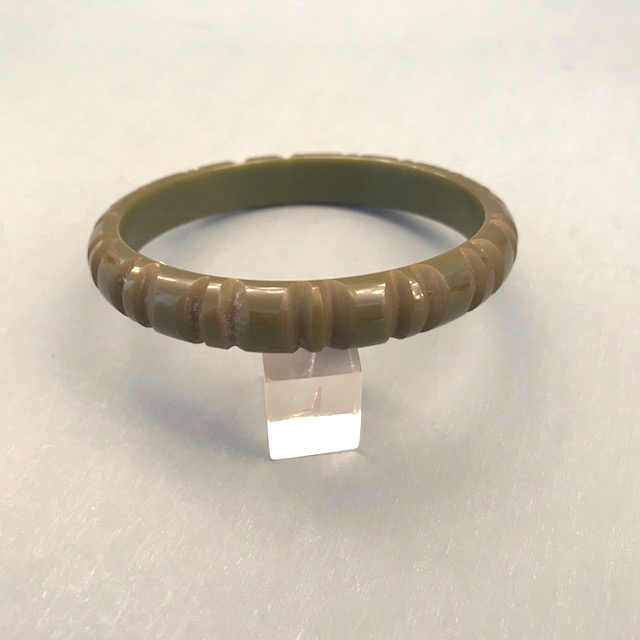 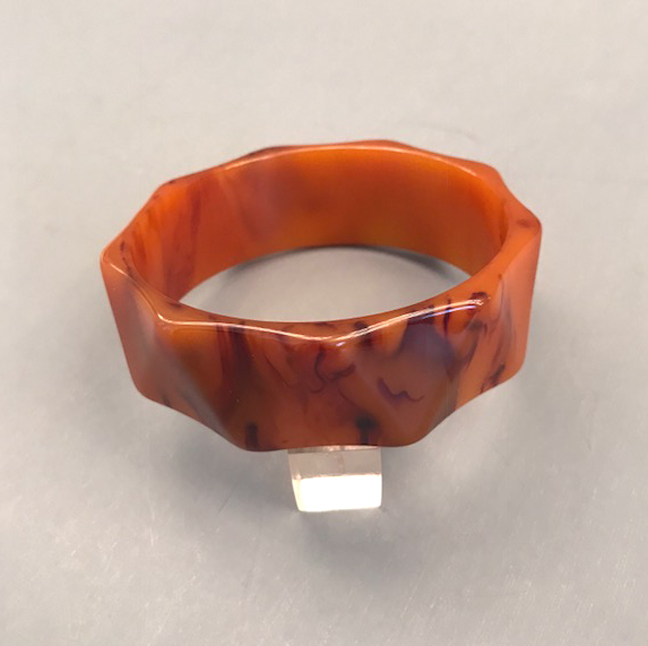 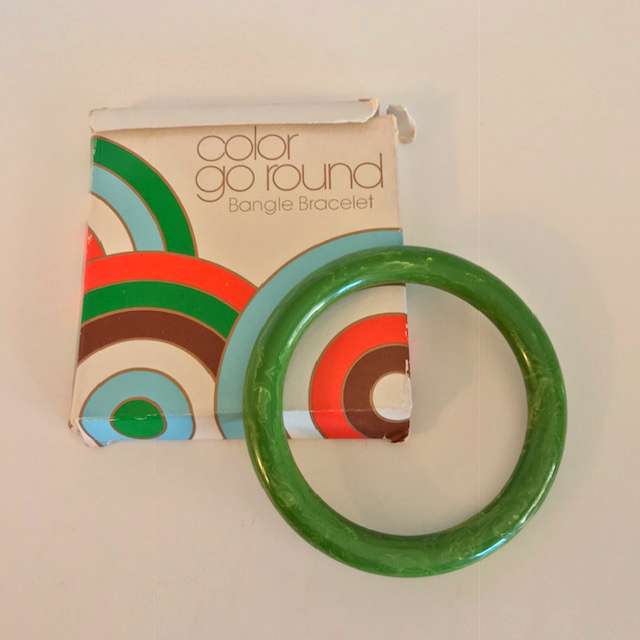 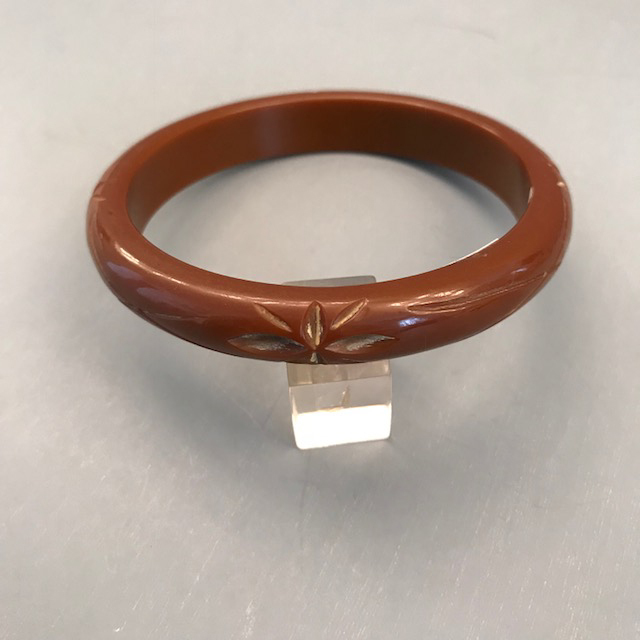 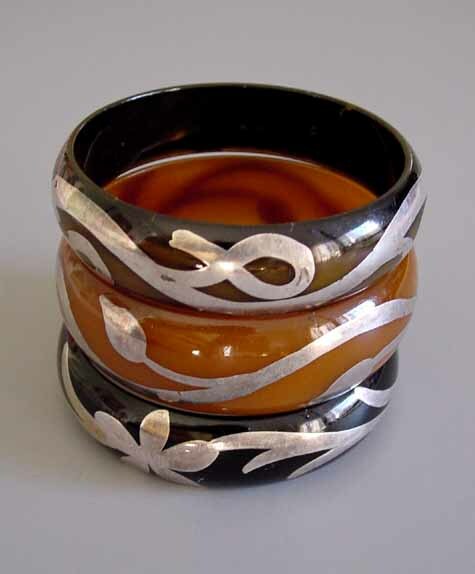 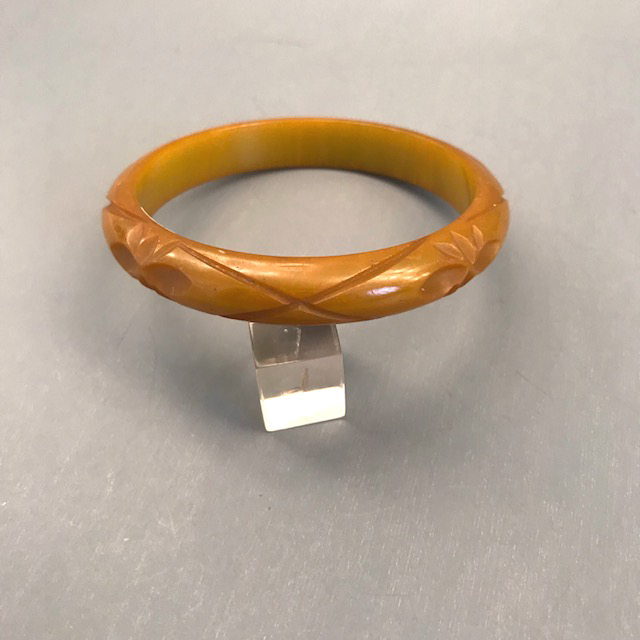 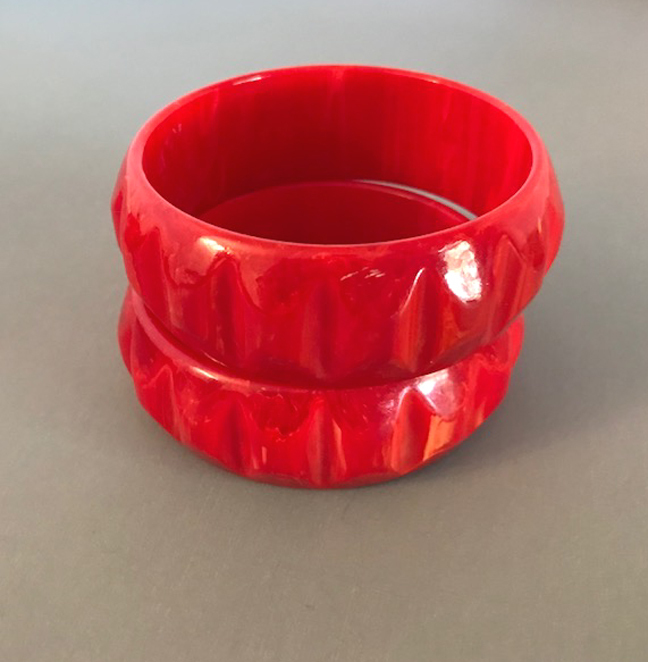 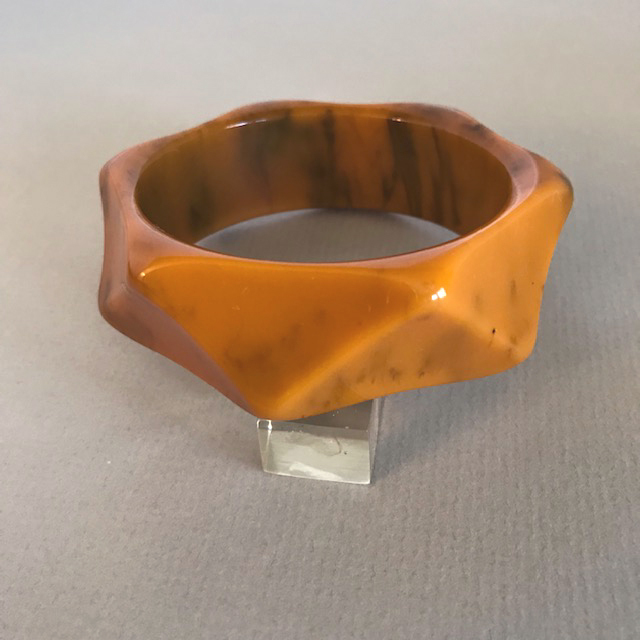 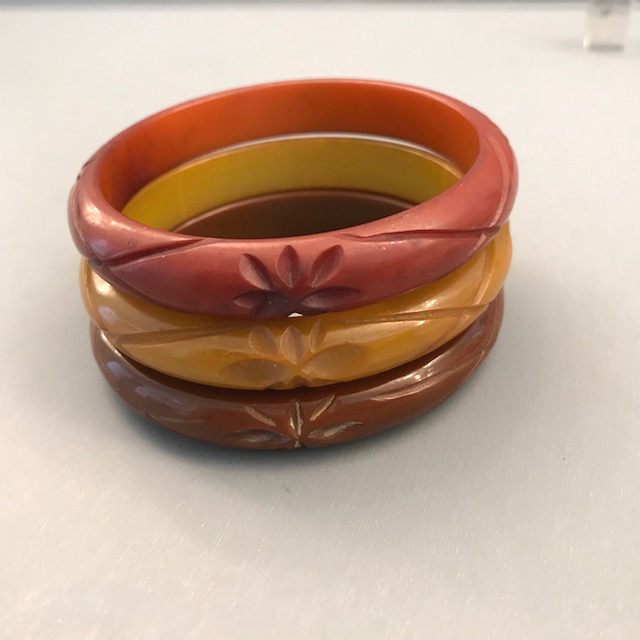 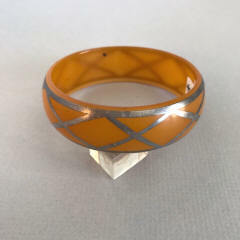 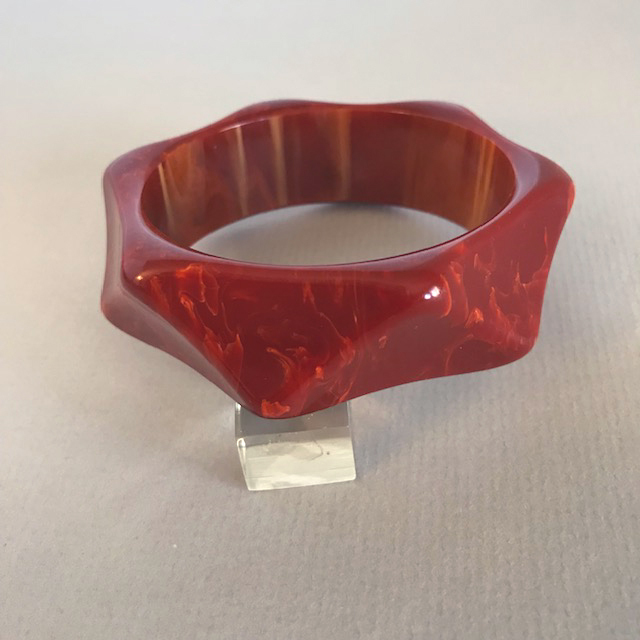 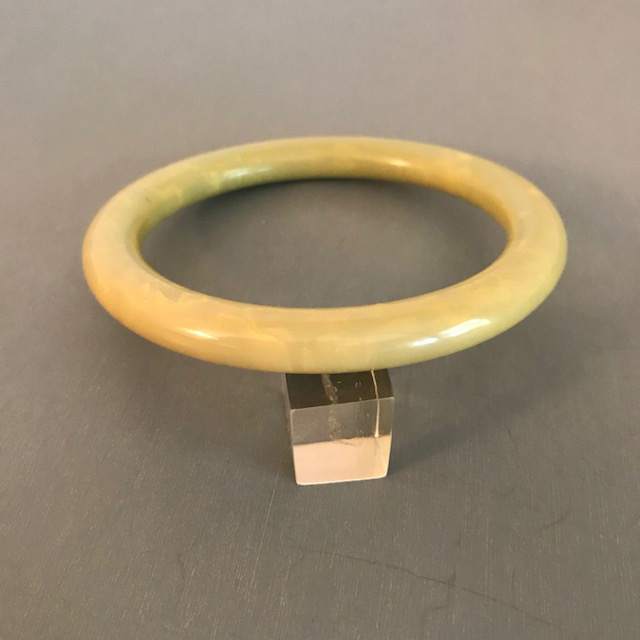 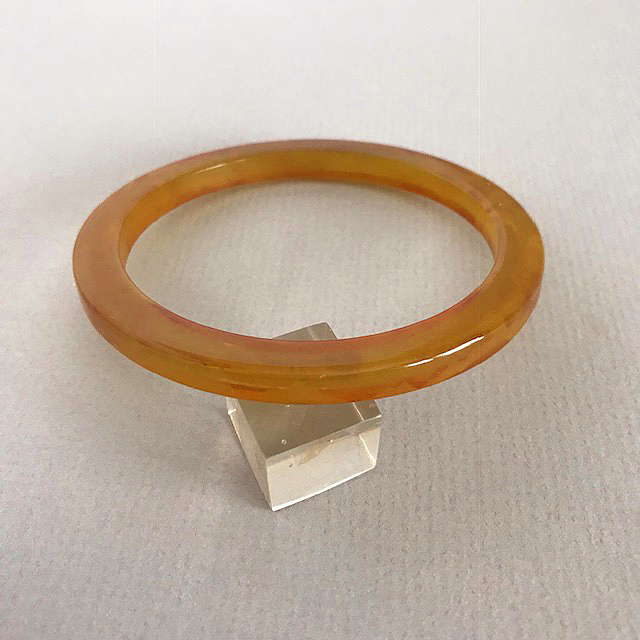 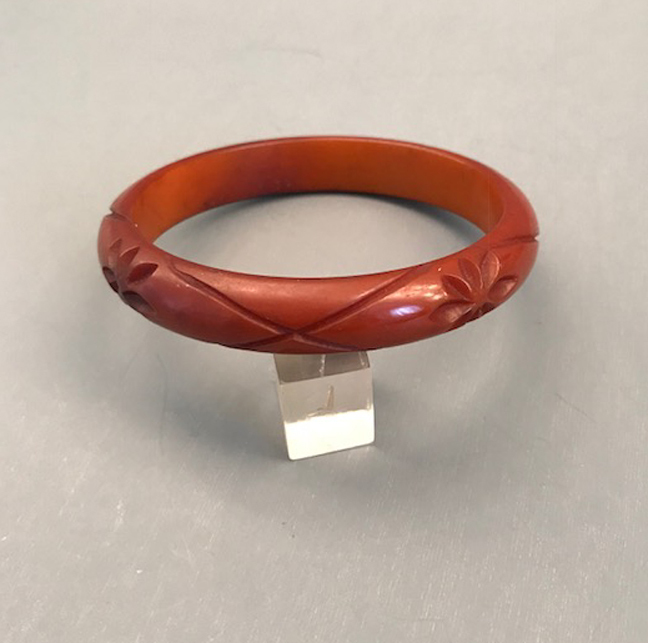 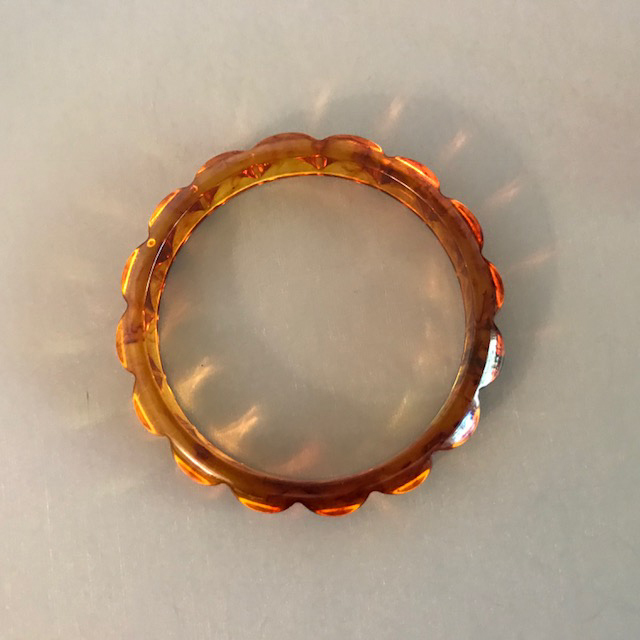 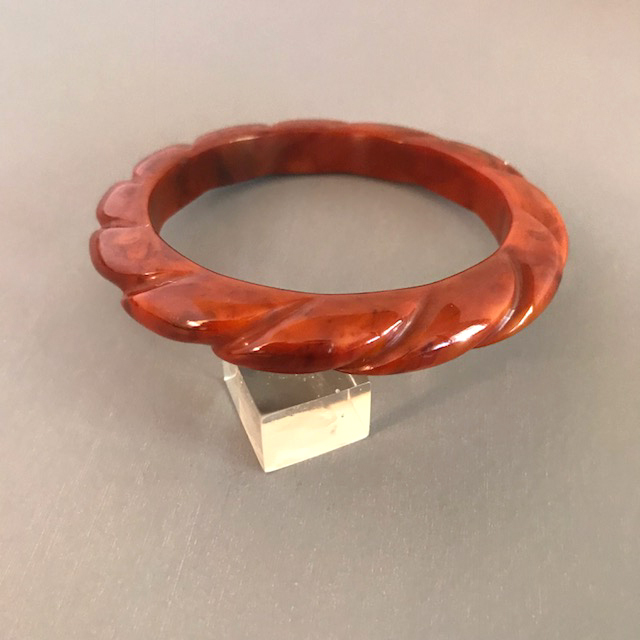 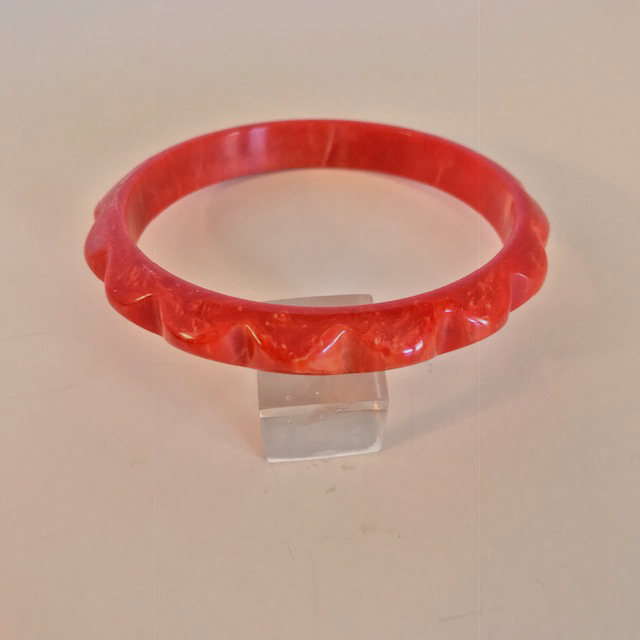 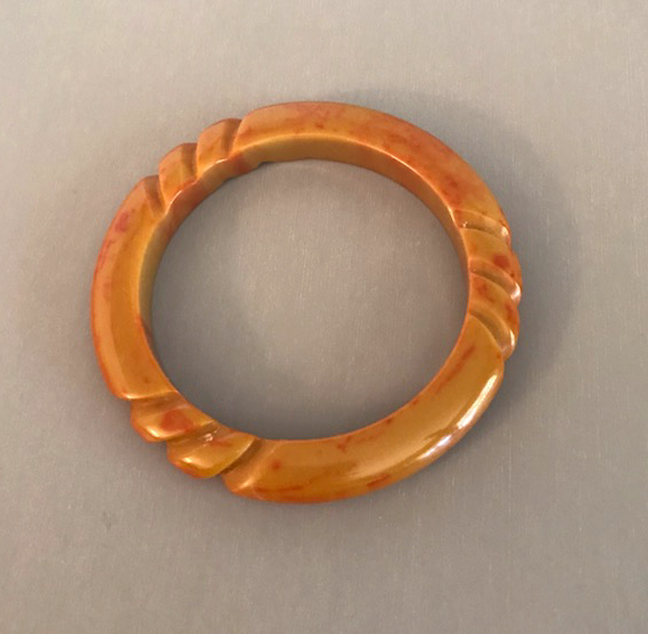 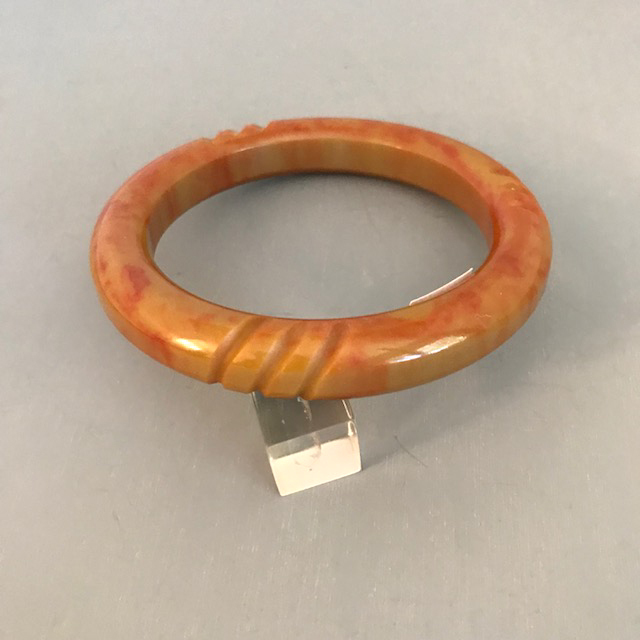 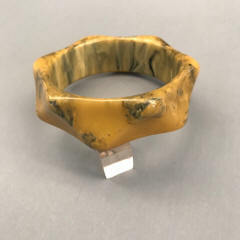 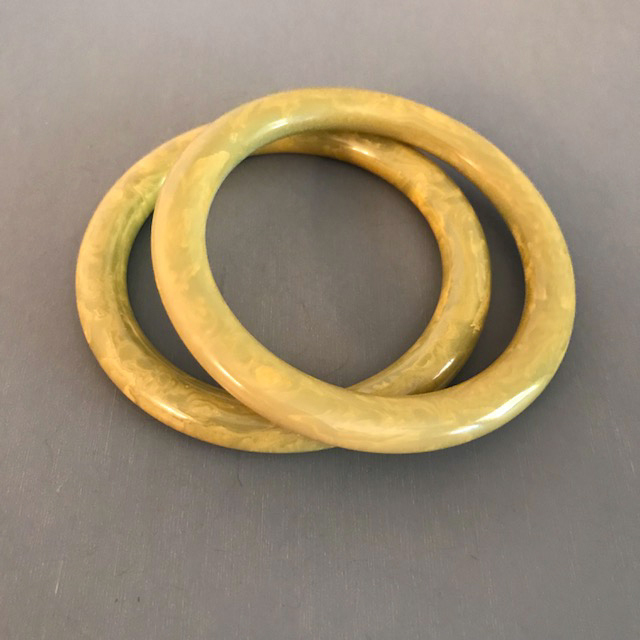 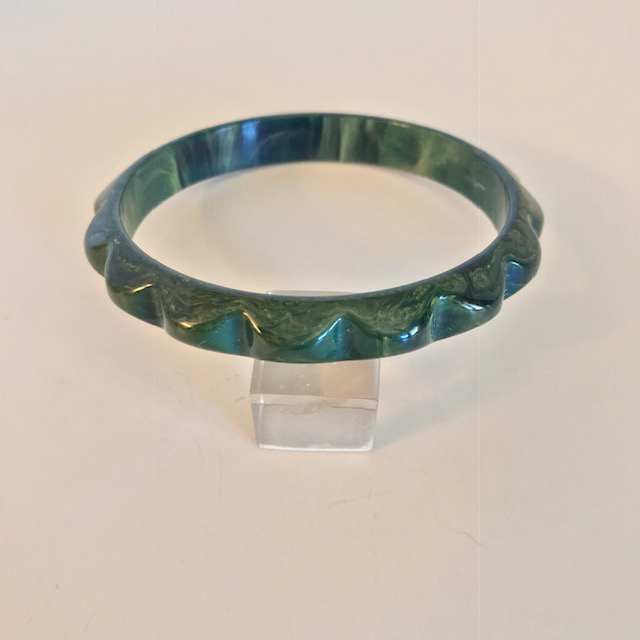 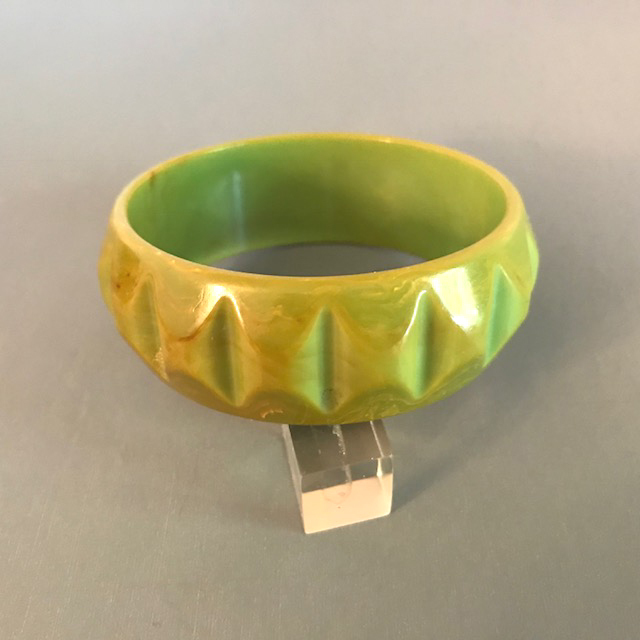 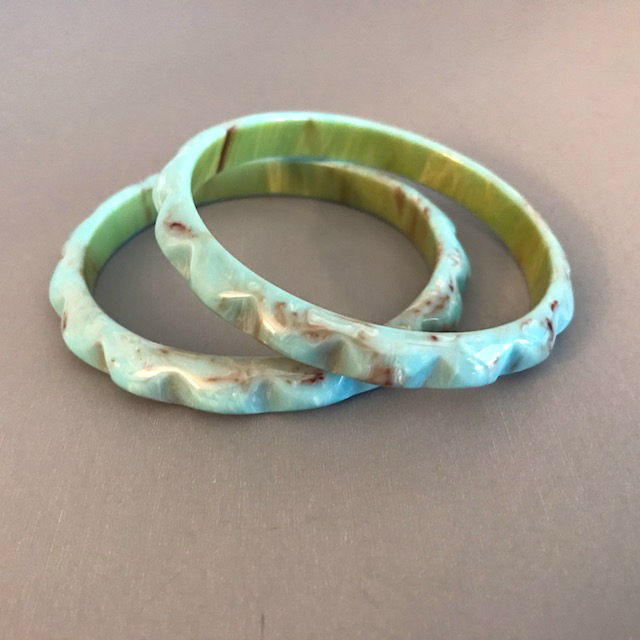 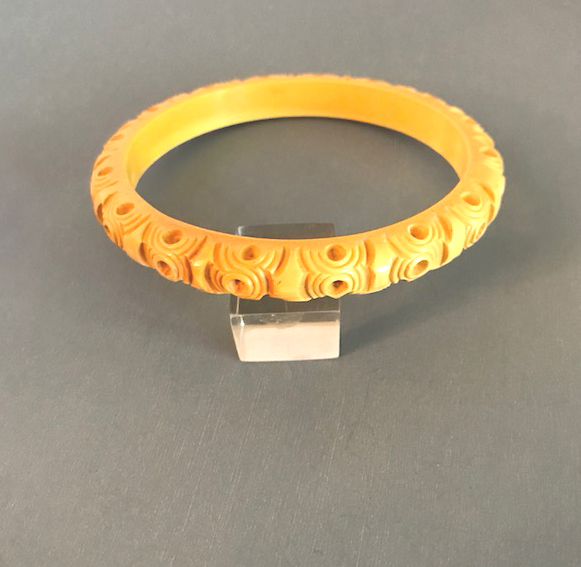 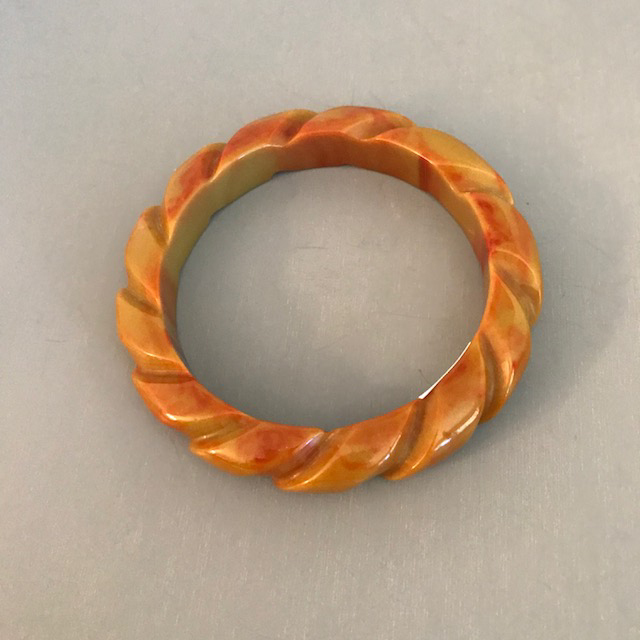 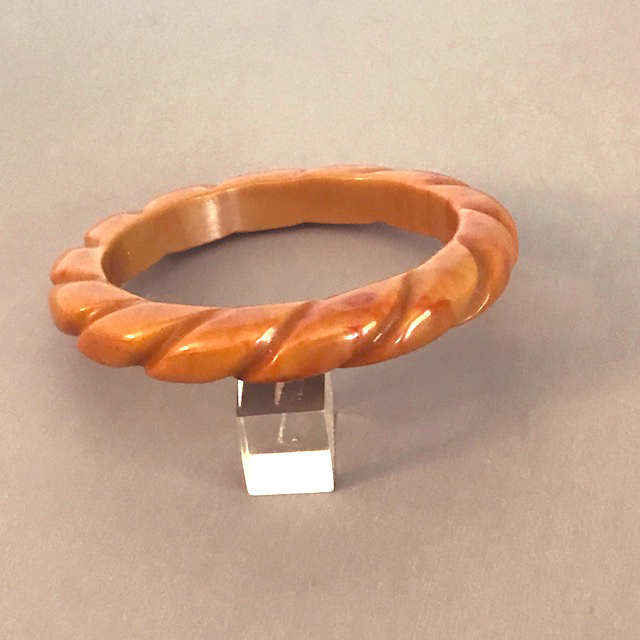 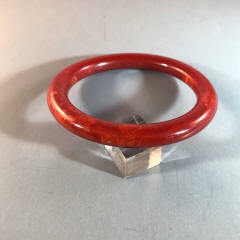 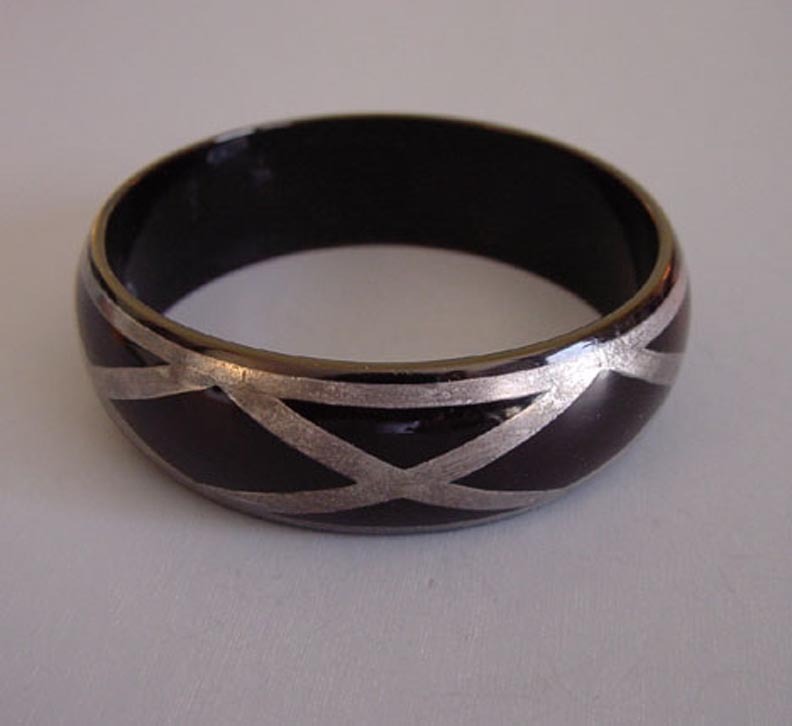 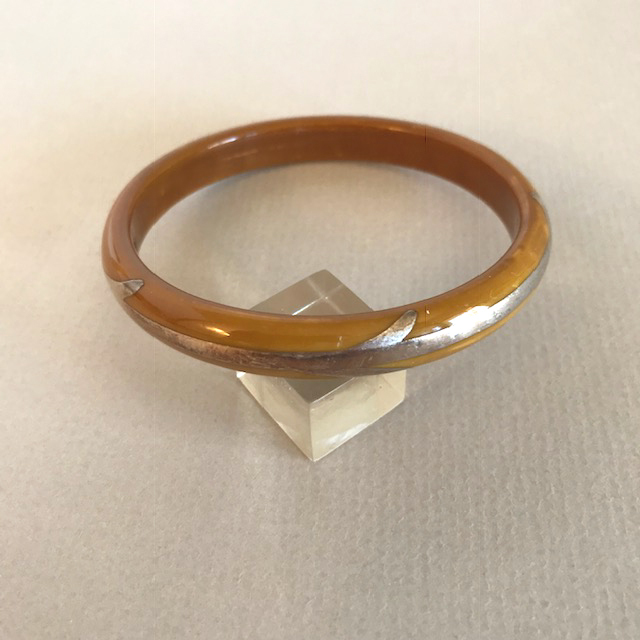 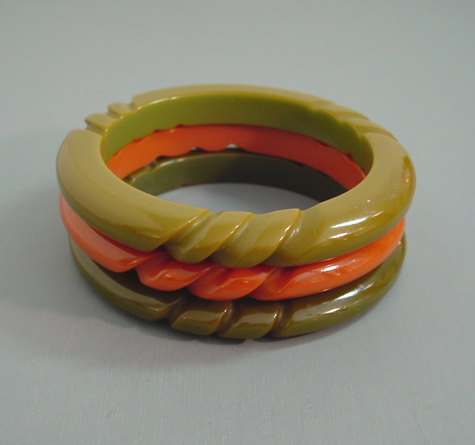 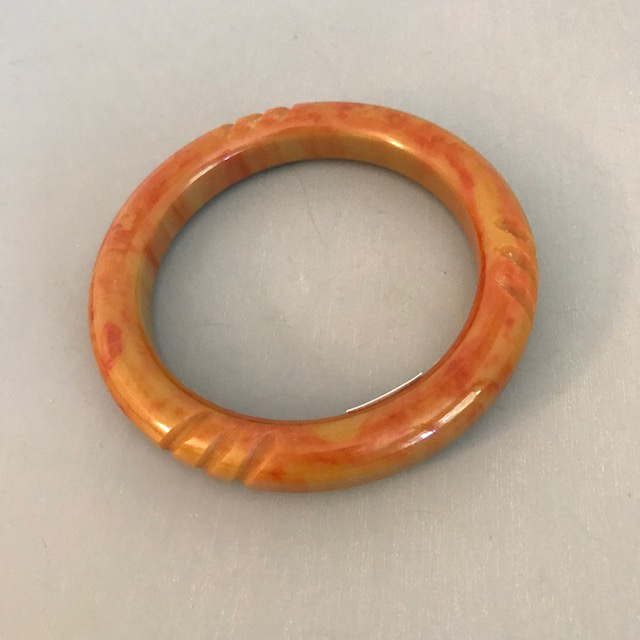 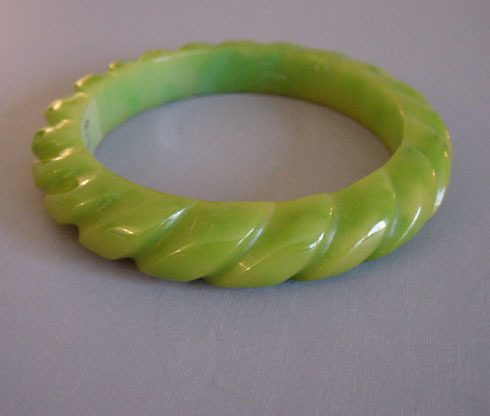 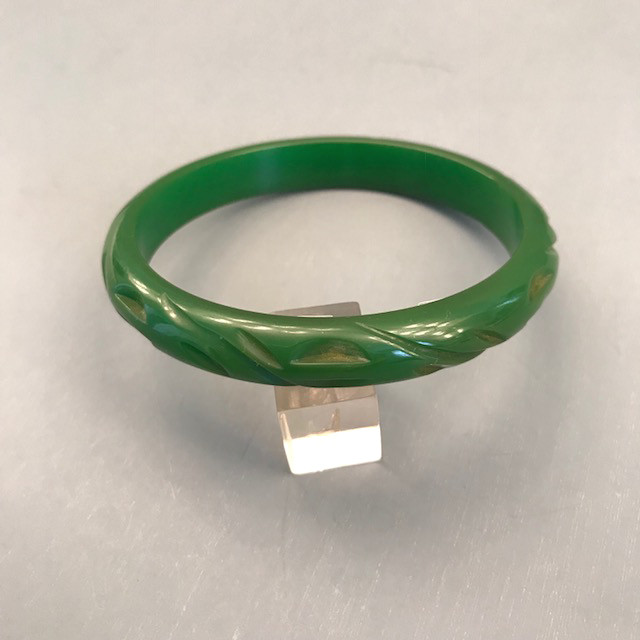 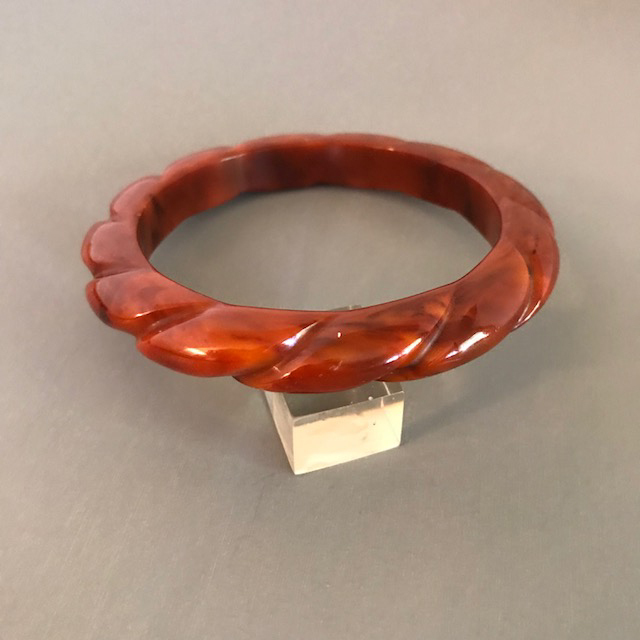 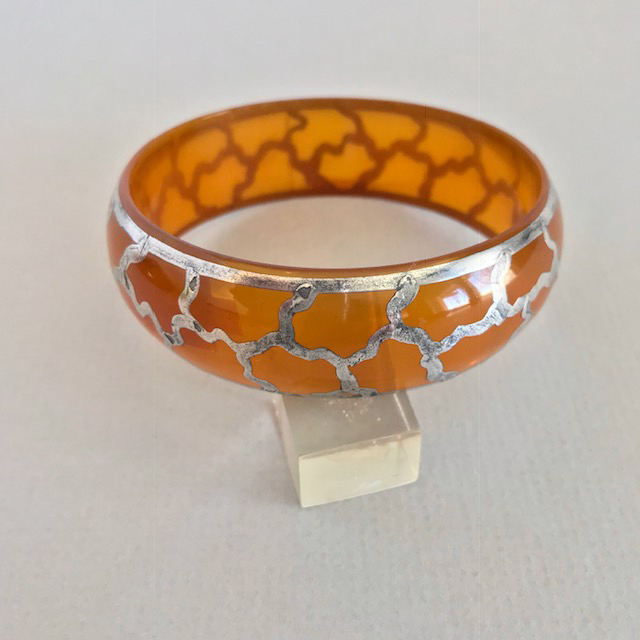 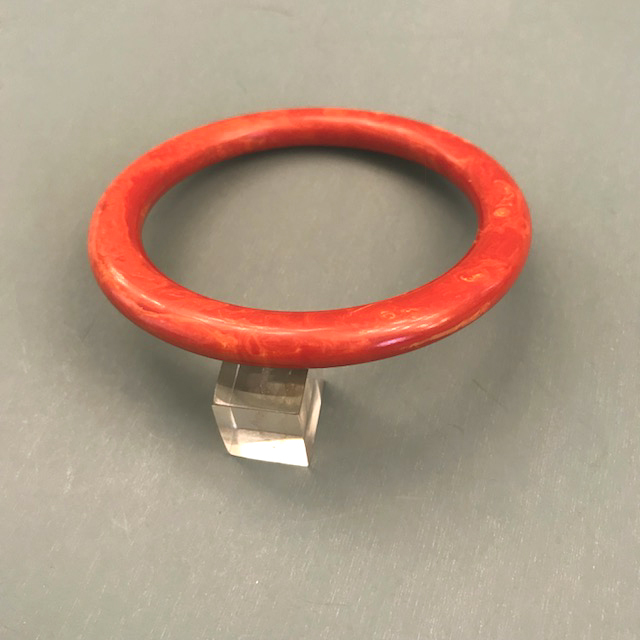 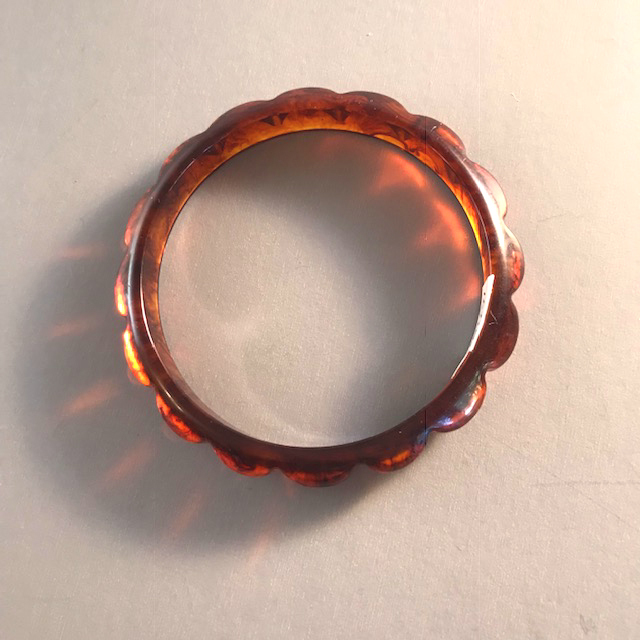 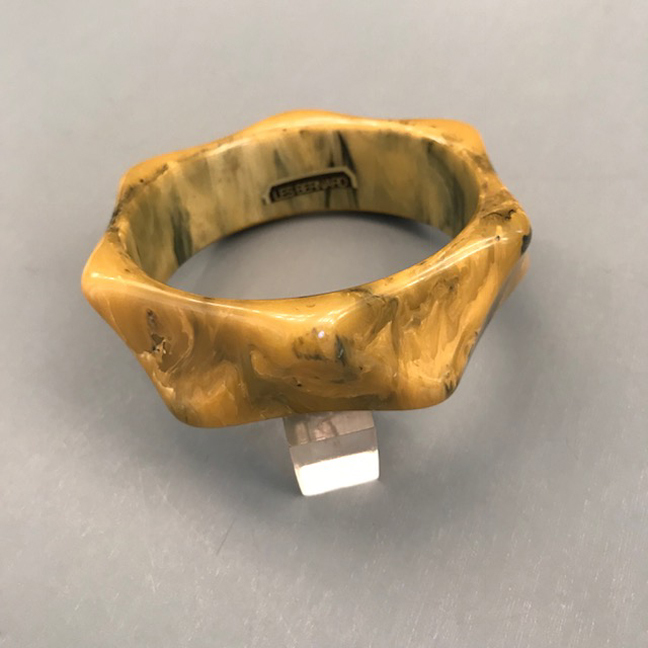 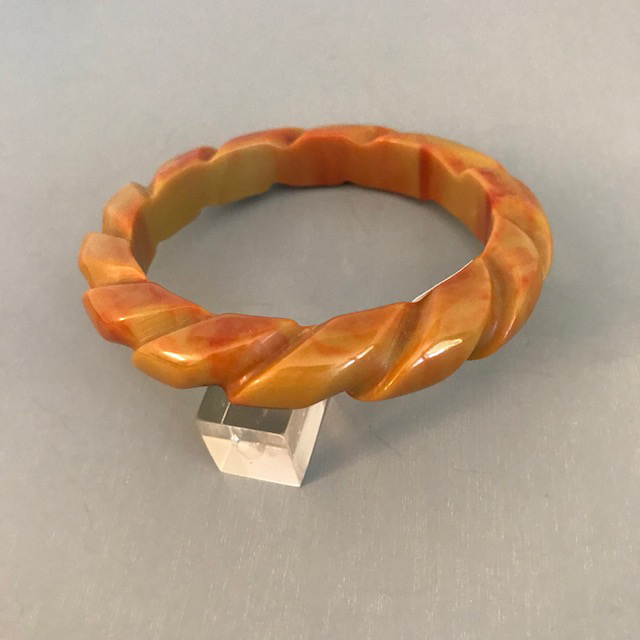 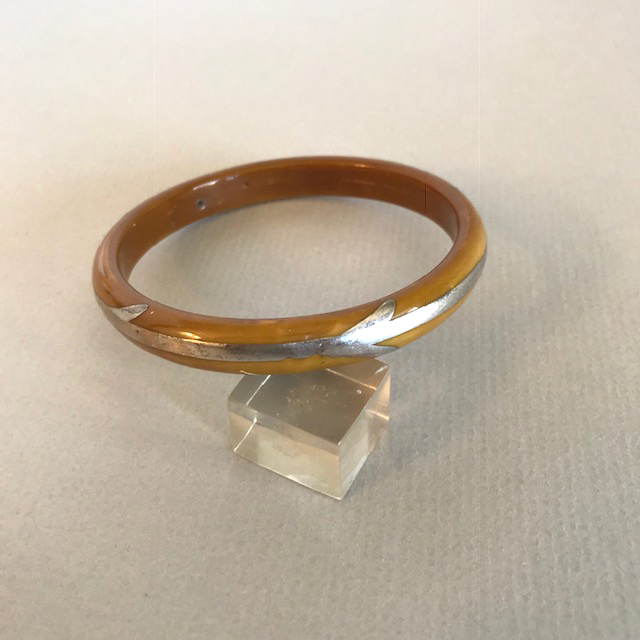 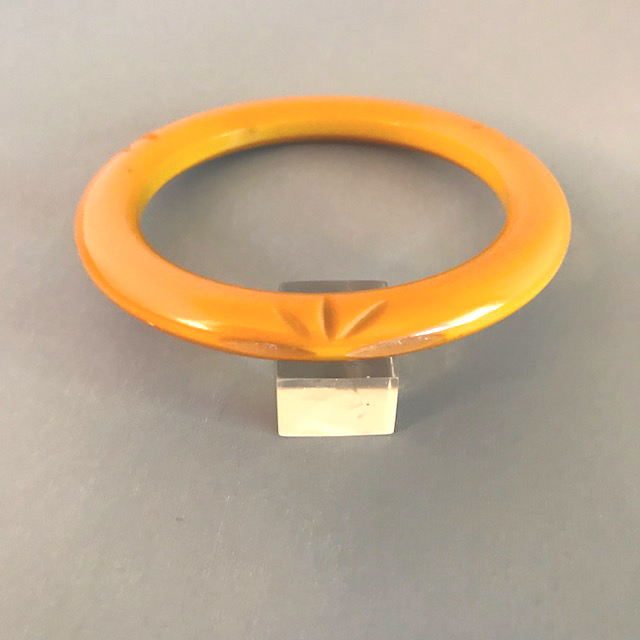 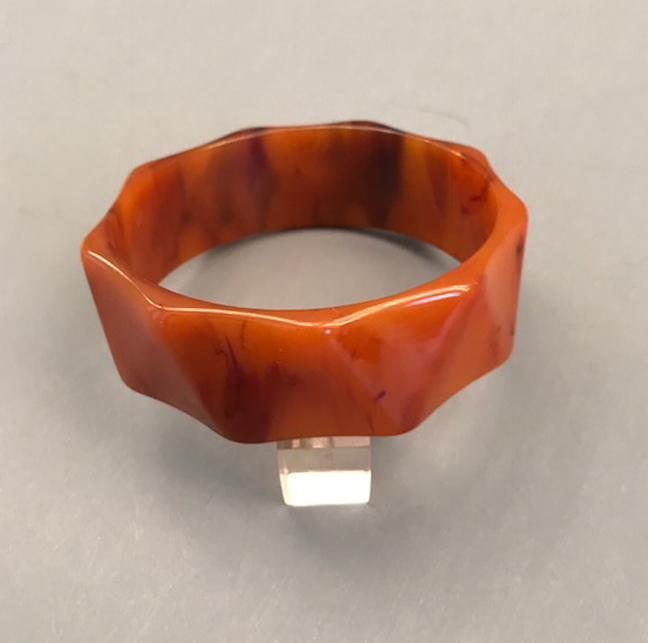 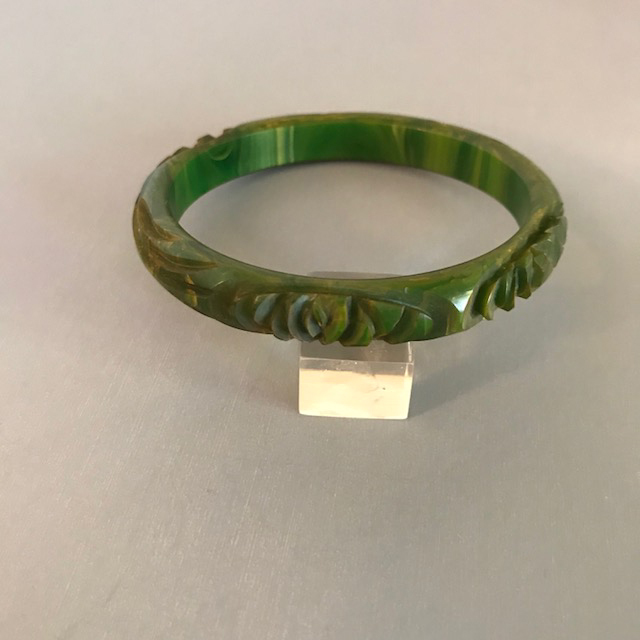 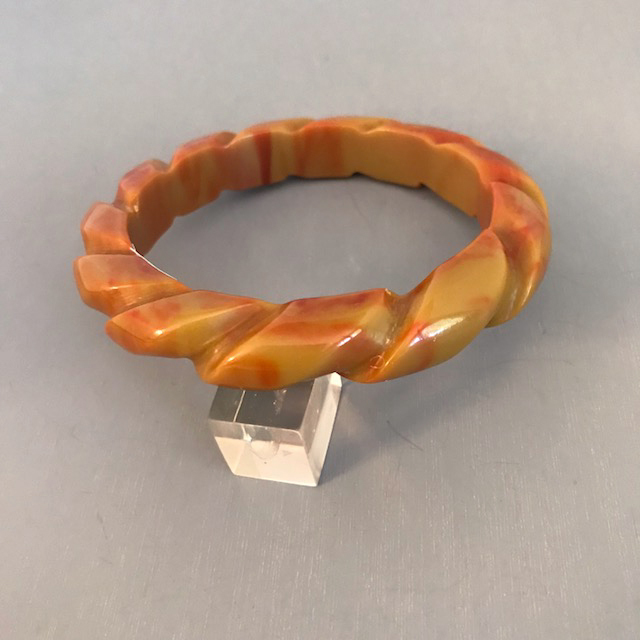 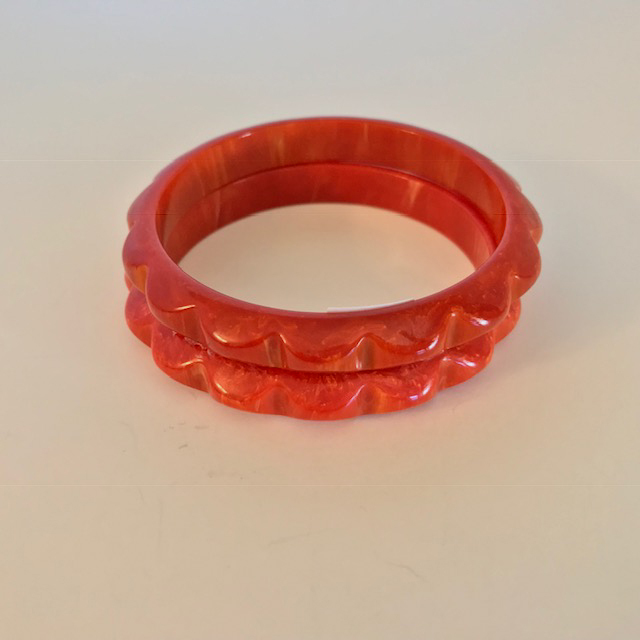 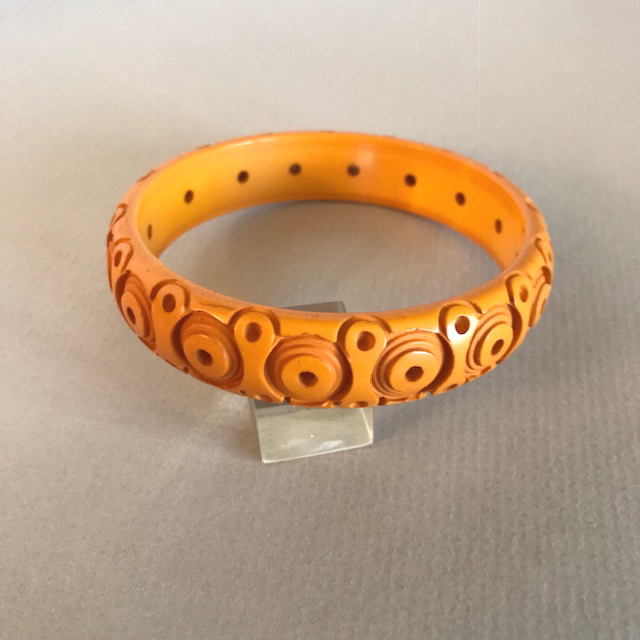 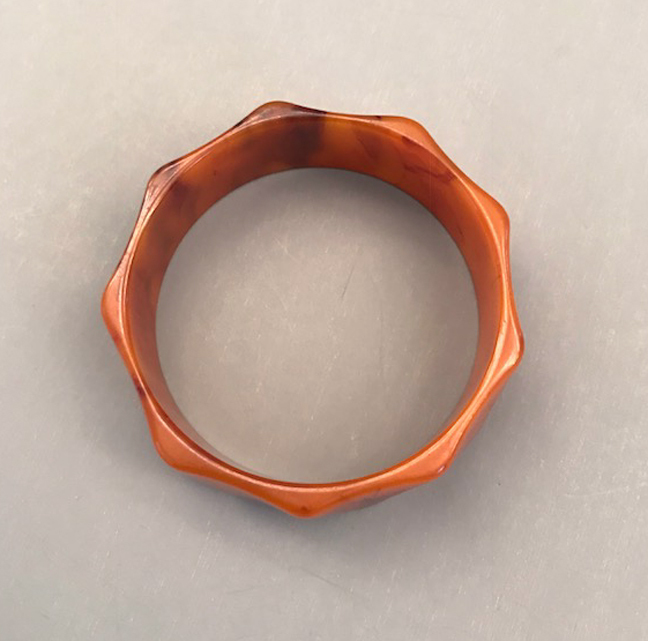 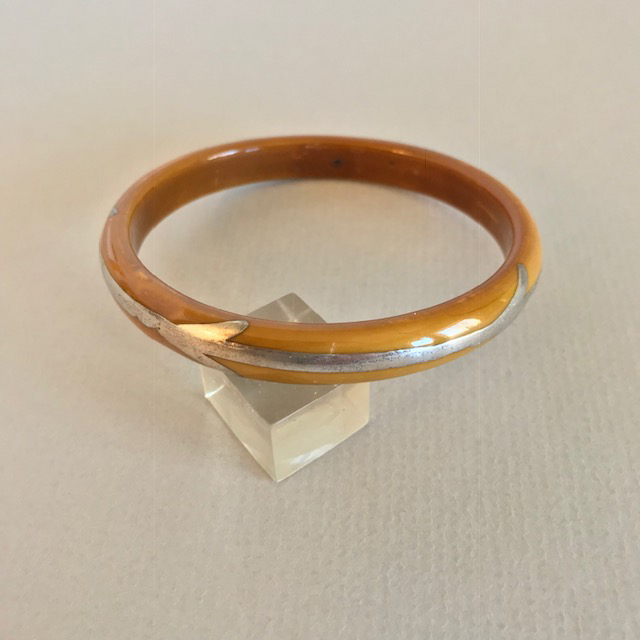 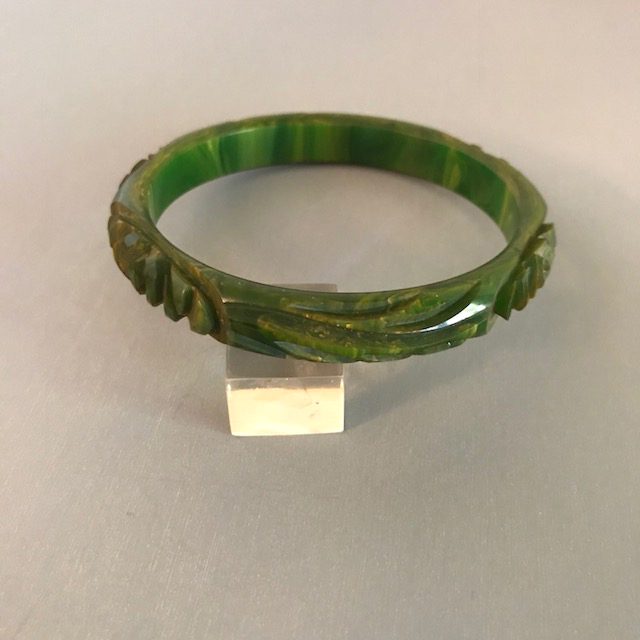 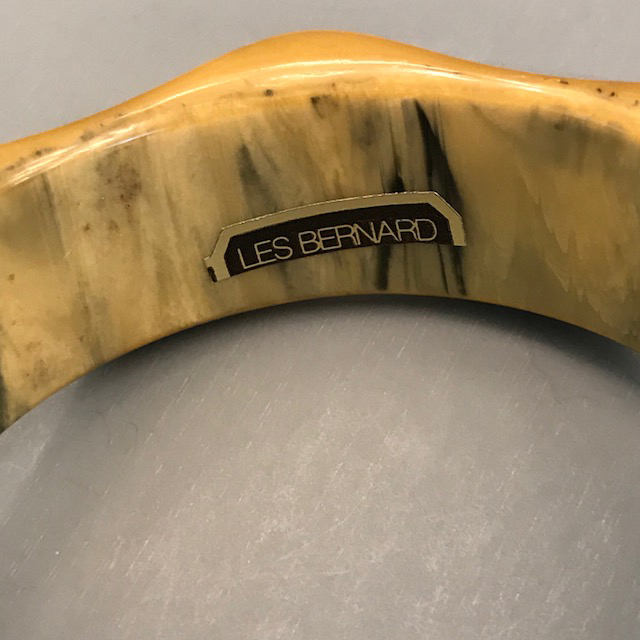 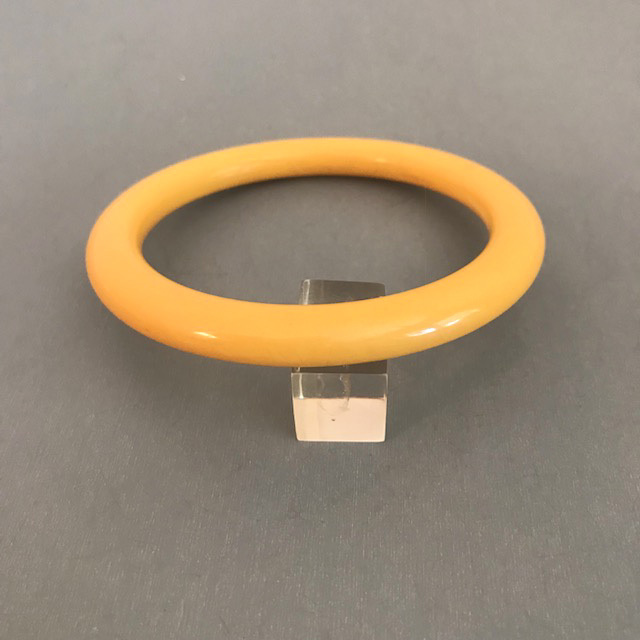 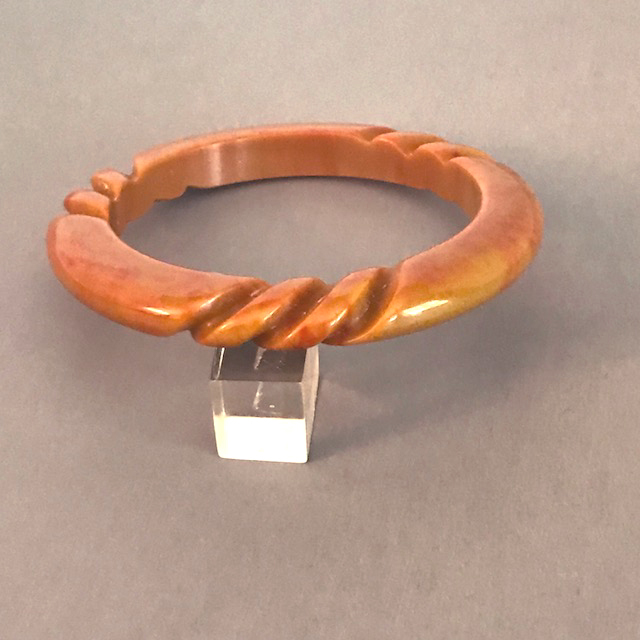 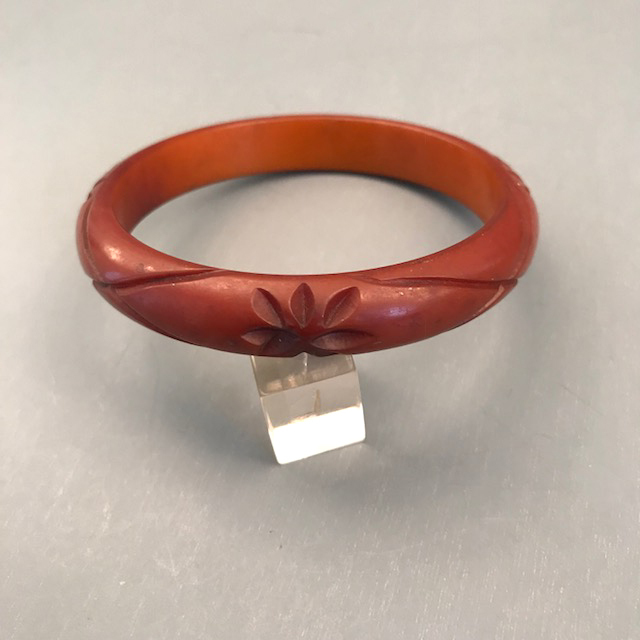 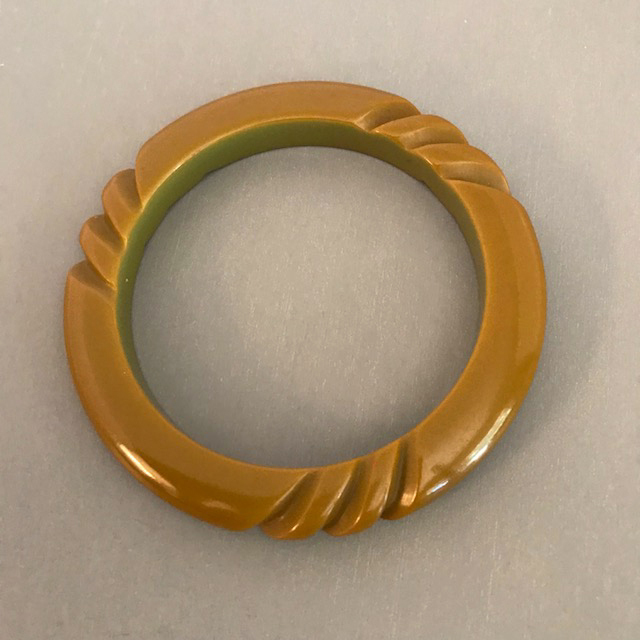 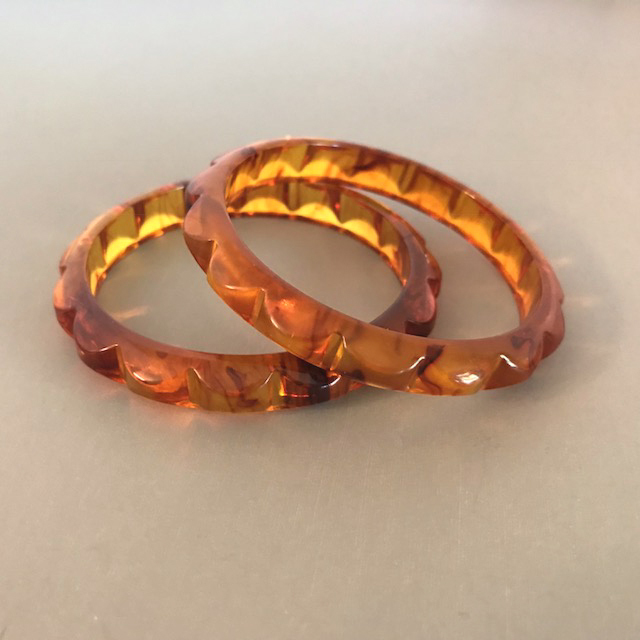 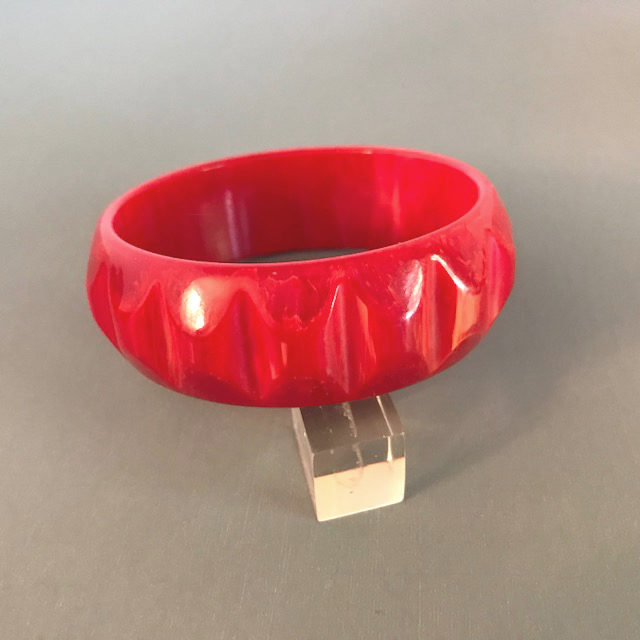 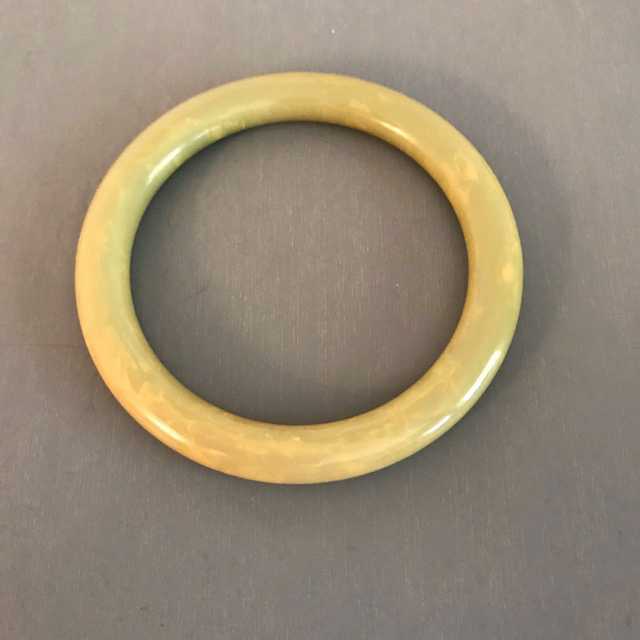 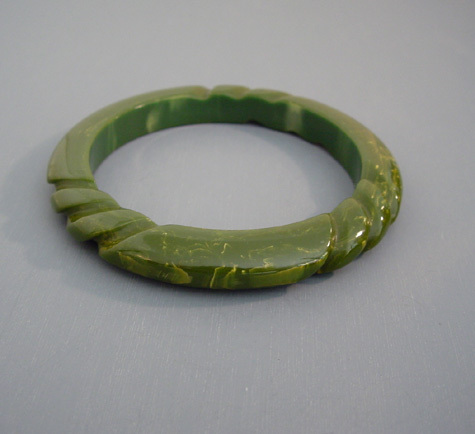 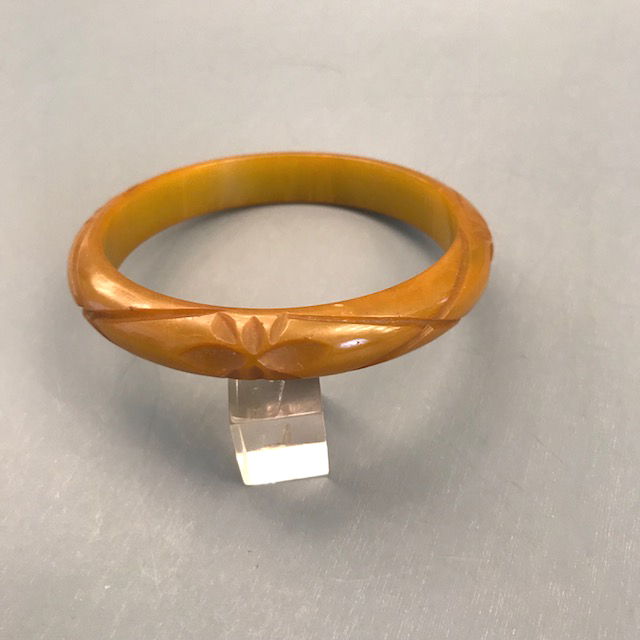 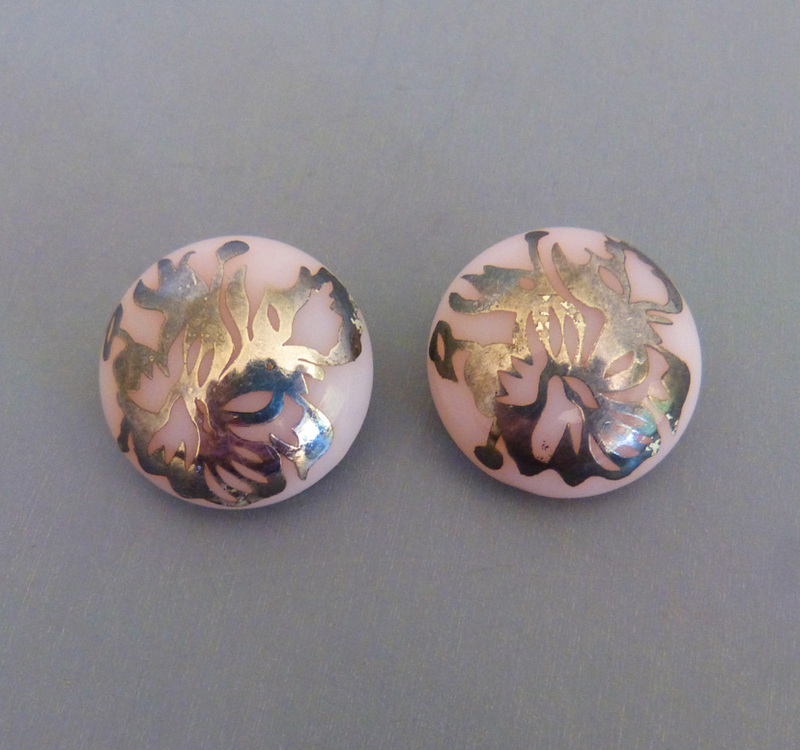 Making Bakelite jewelry was at it's zenith from the late 1920s till the start of WWII in 1942, and even after Diane Von Furstenberg and Hattie Carnegie, among others, leant their names to this wonderful jewelry. 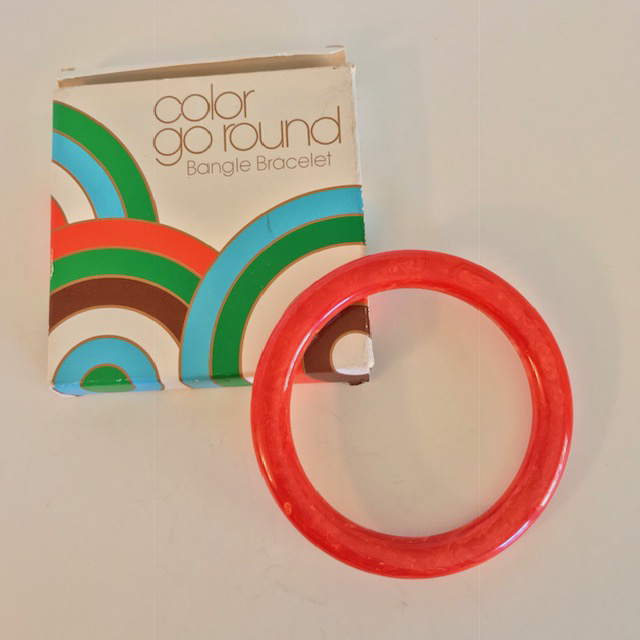 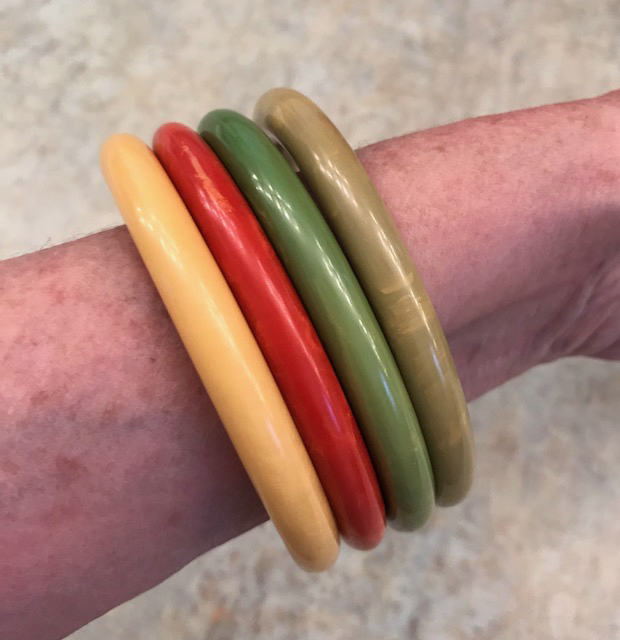 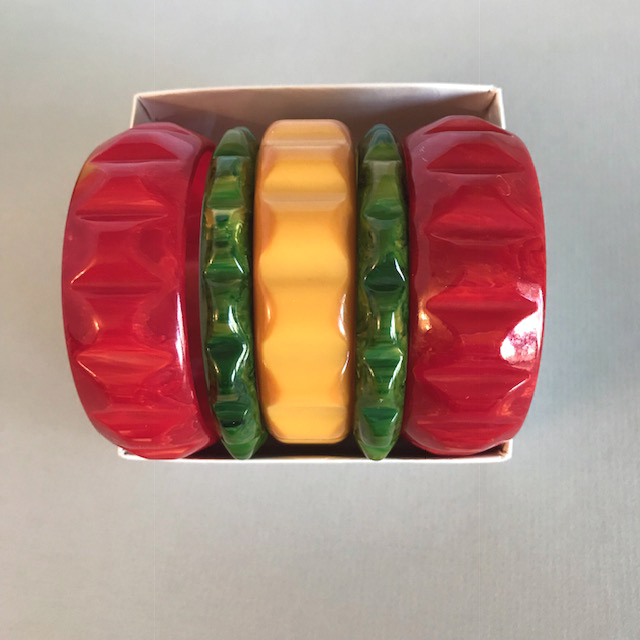 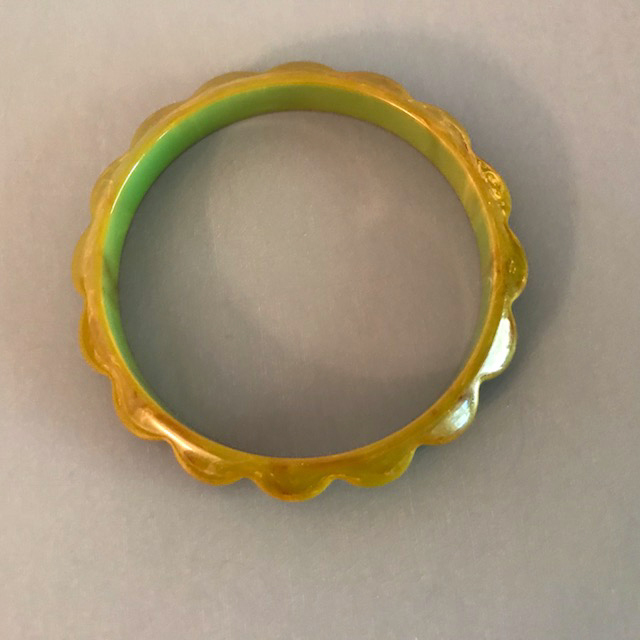 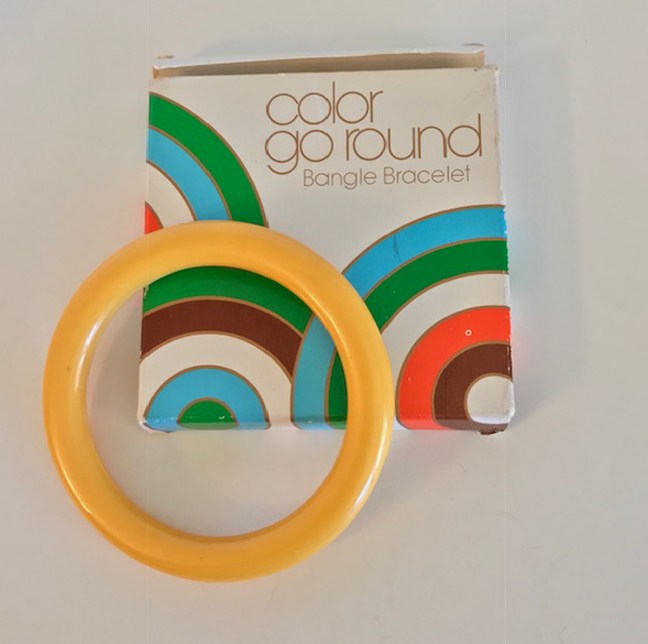 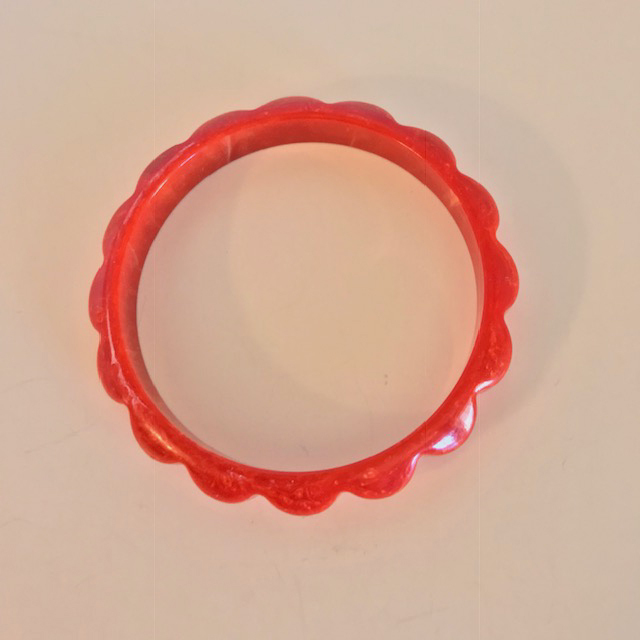 The lack of money and need for inexpensive fun during the Depression era of the 1930s gave the whimsy, colorful and cheerful look of bakelite jewelry the perfect market. 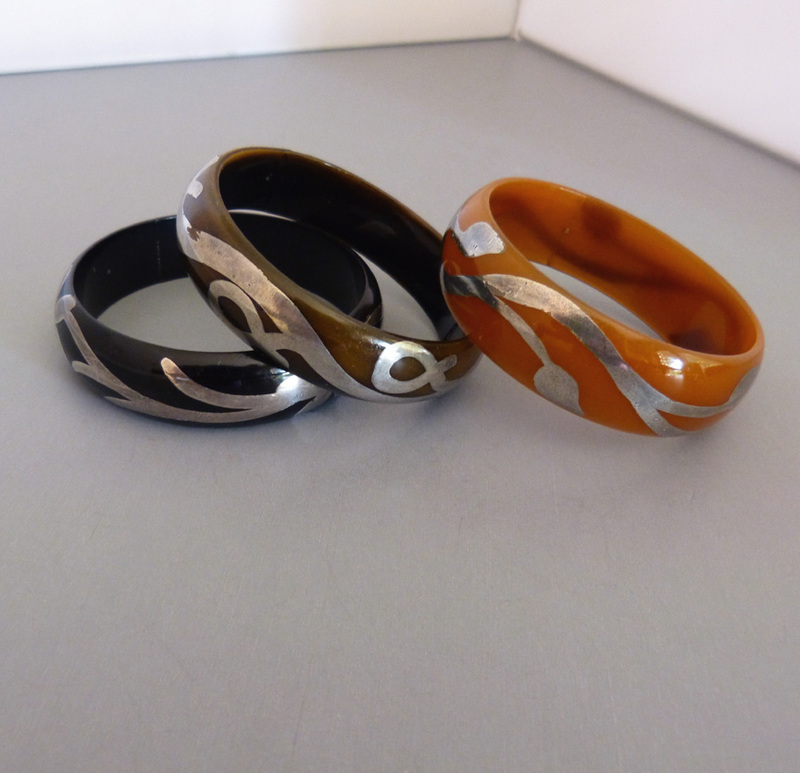 The sophisticated Deco and machine age look of some of the pieces made them fashion-forward. 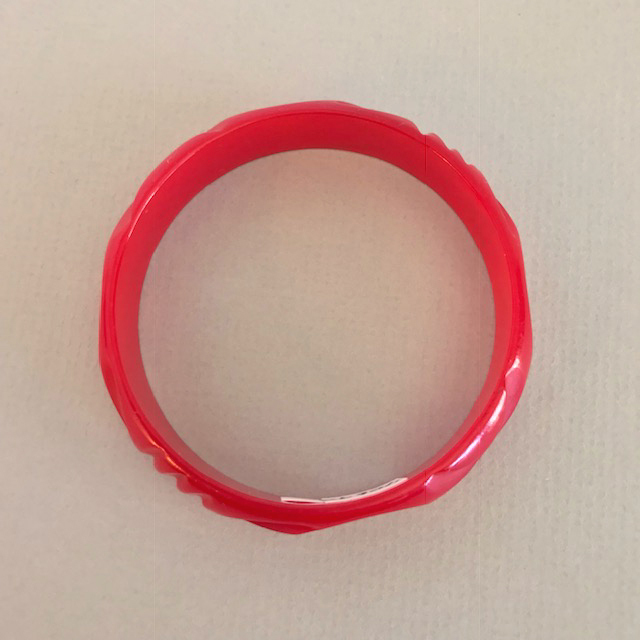 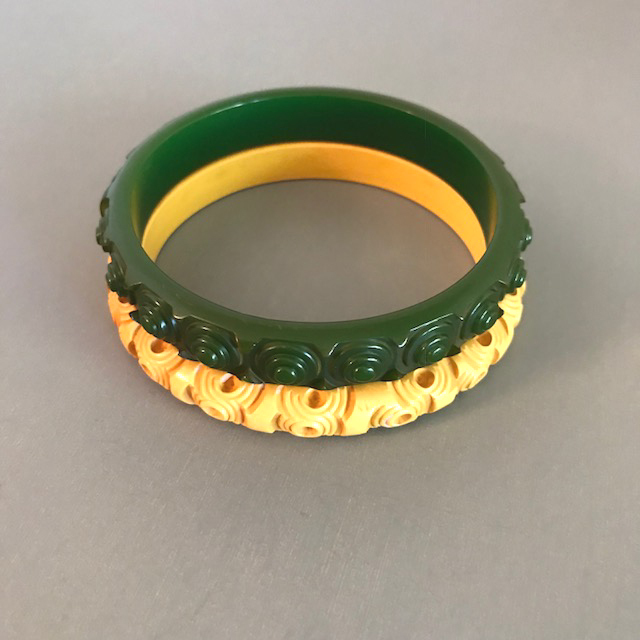 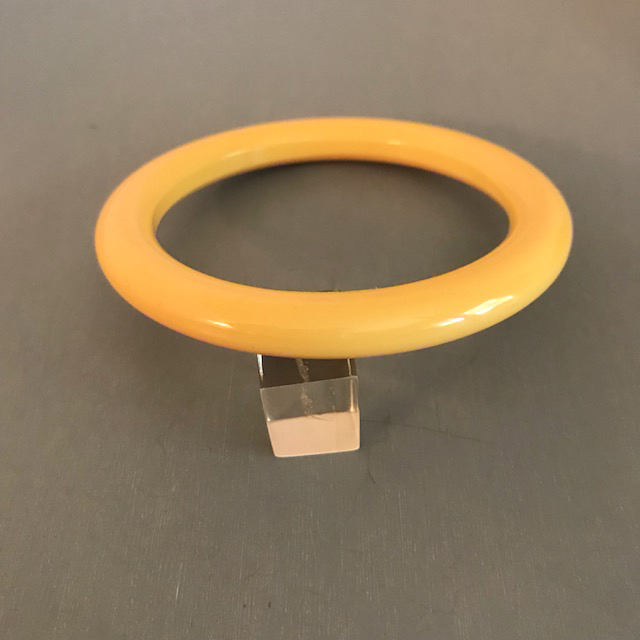 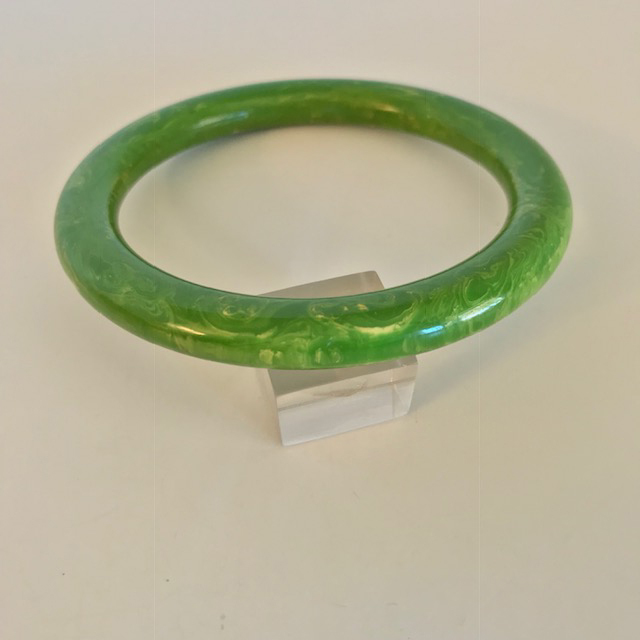 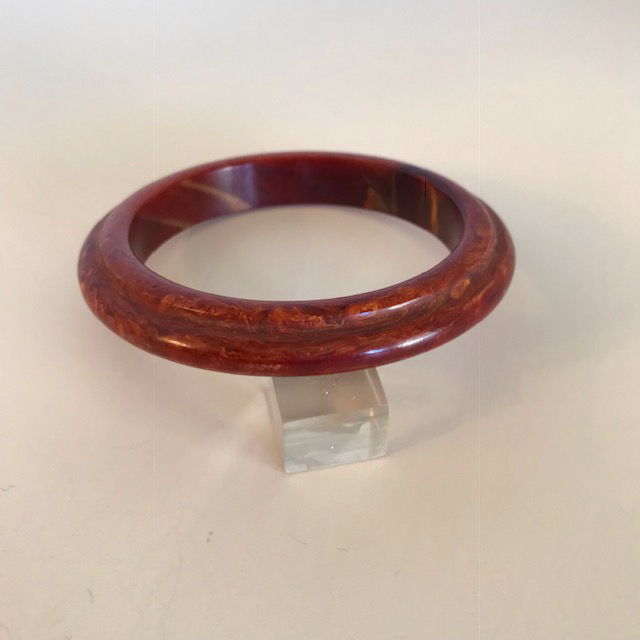 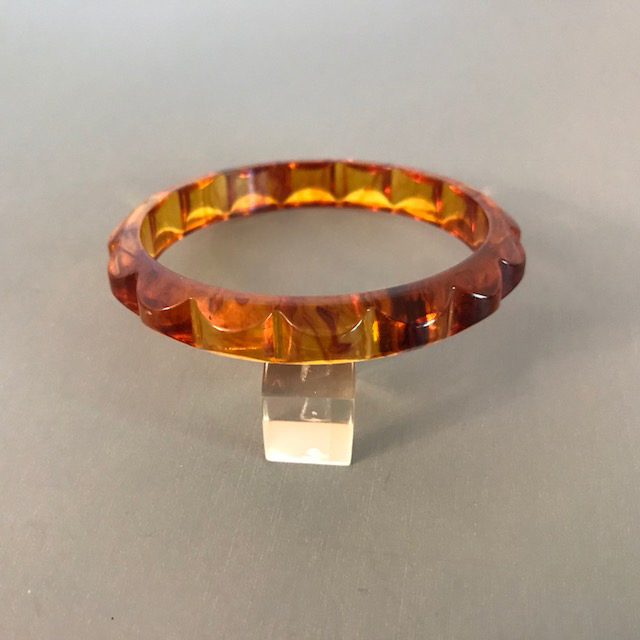 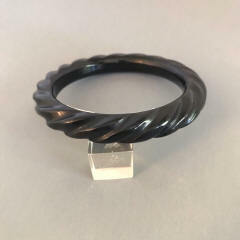 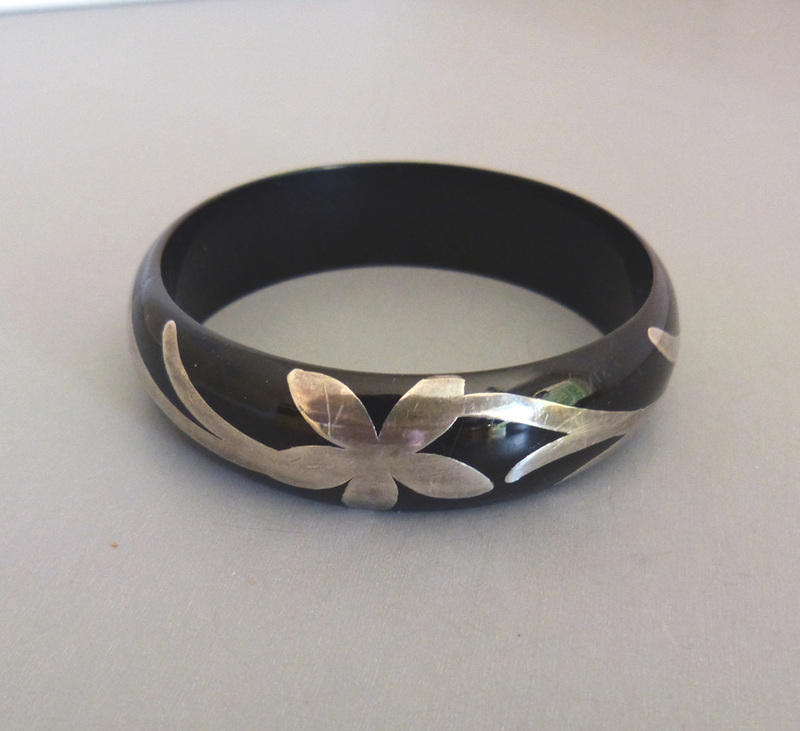 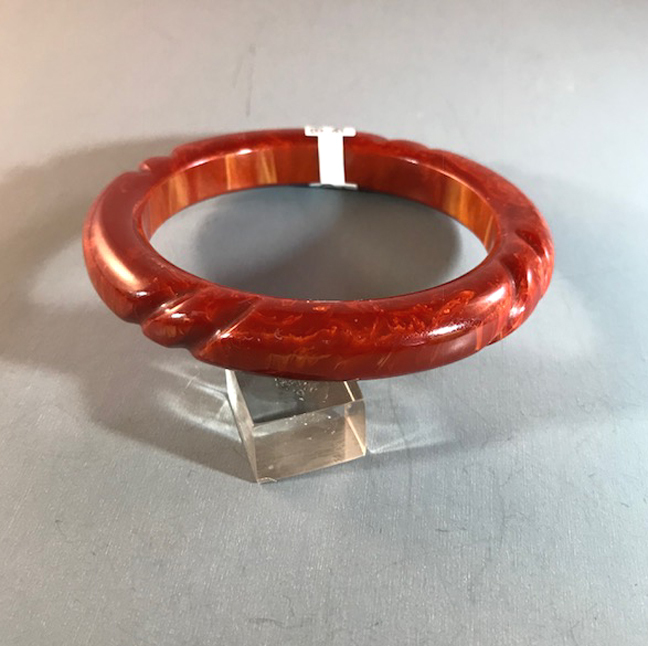 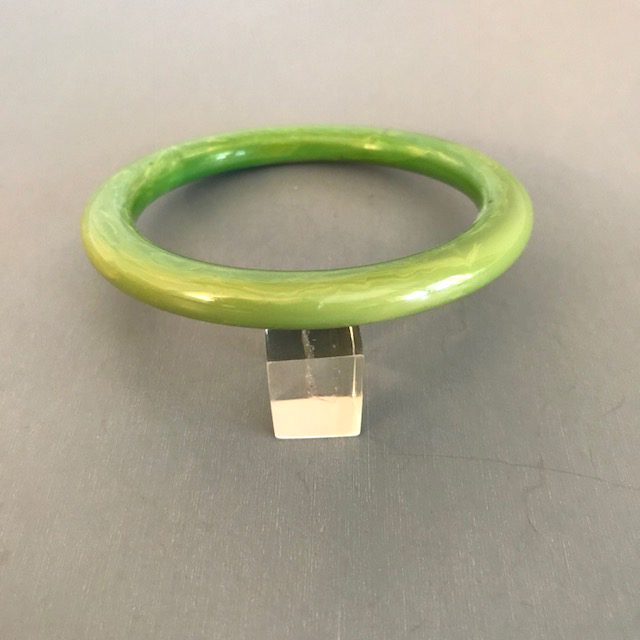 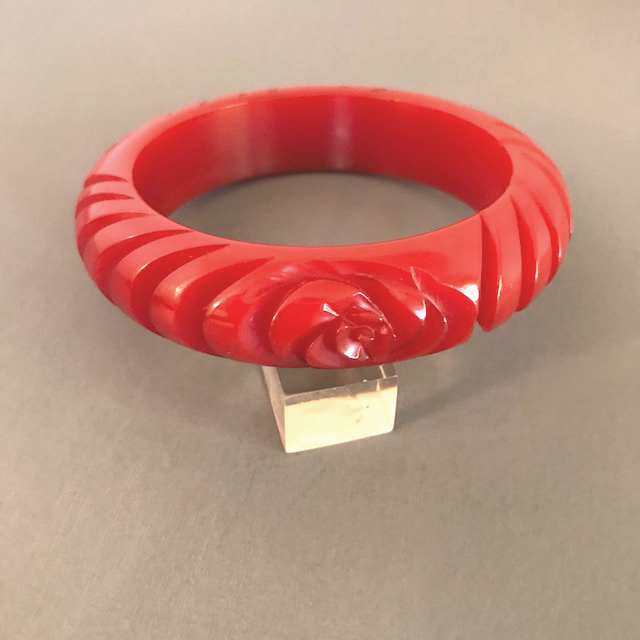 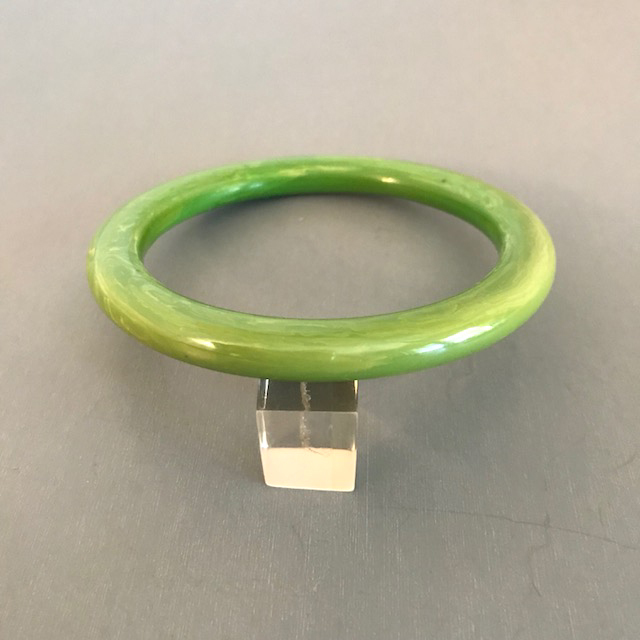 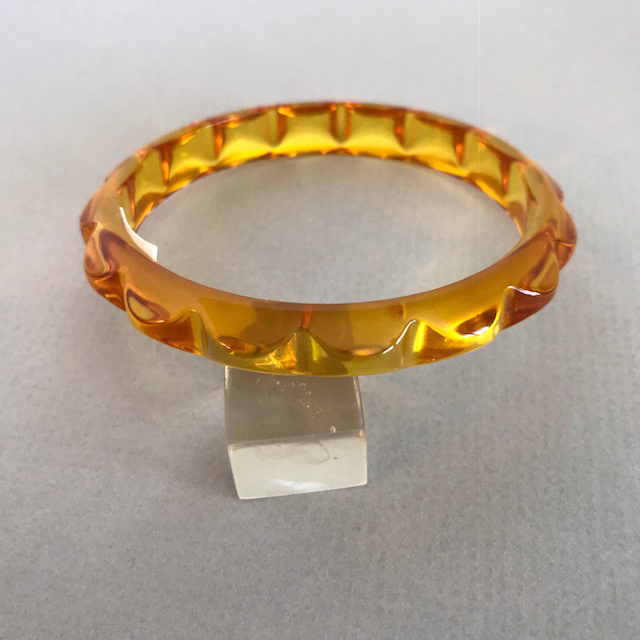 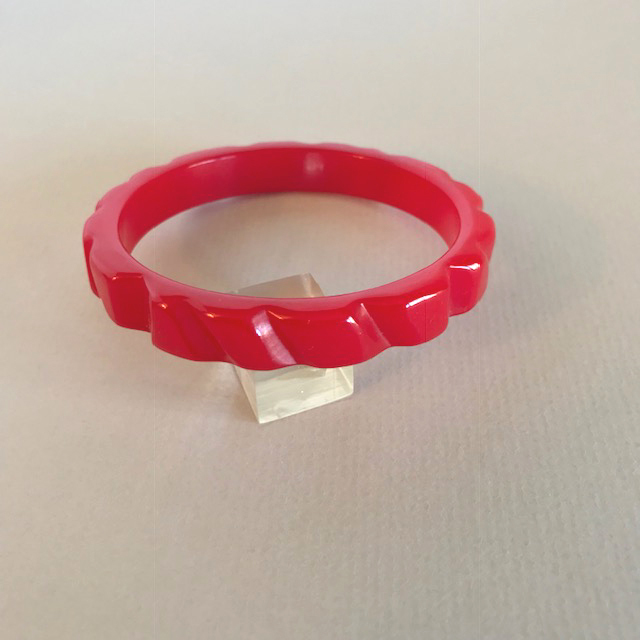 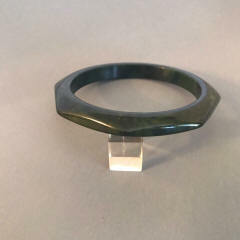 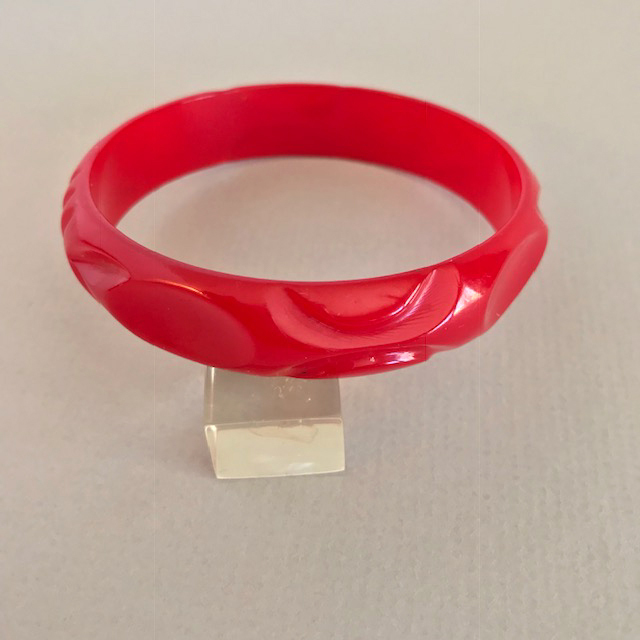 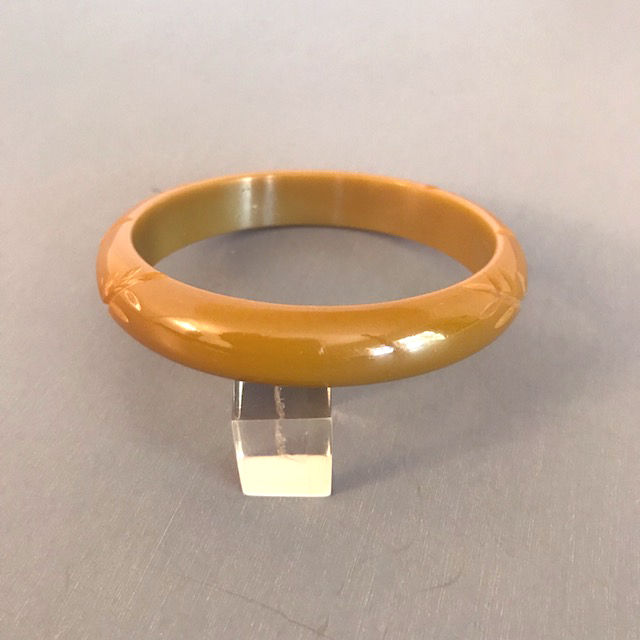 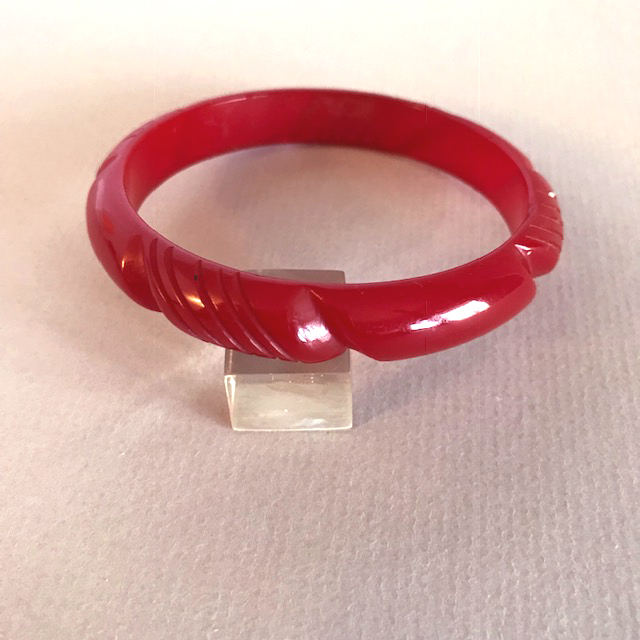 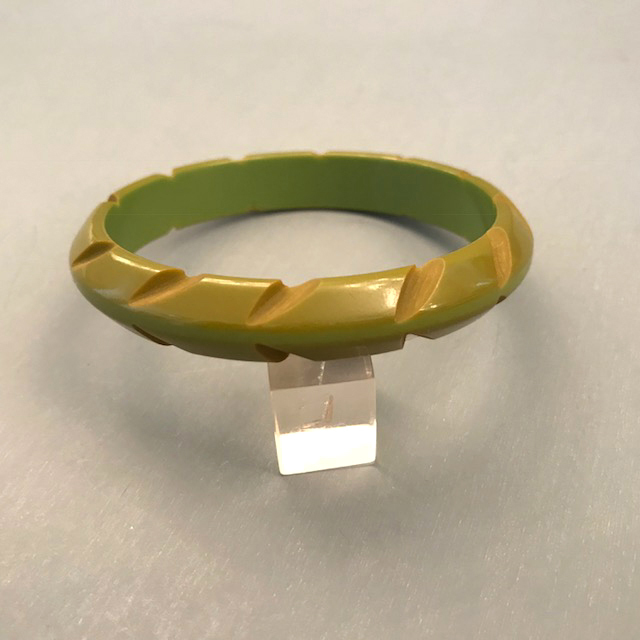 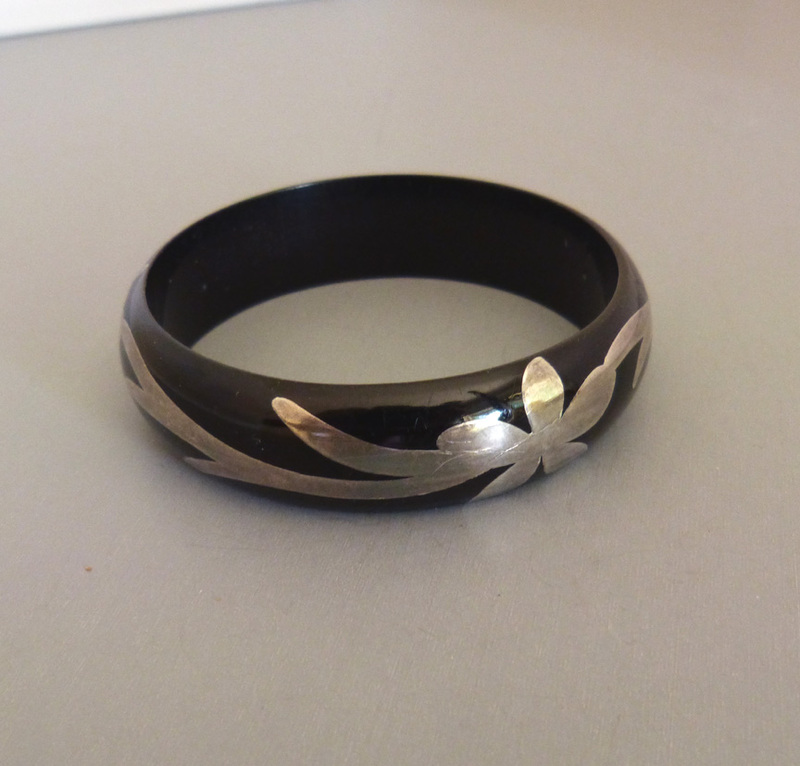 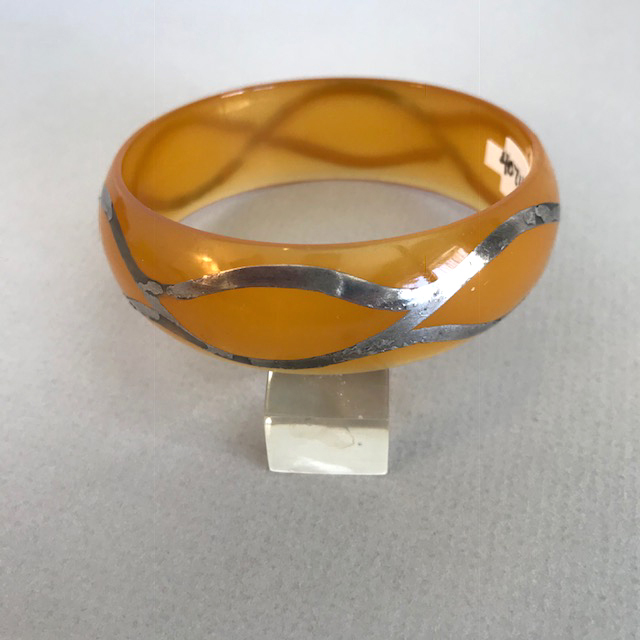 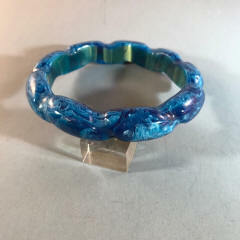 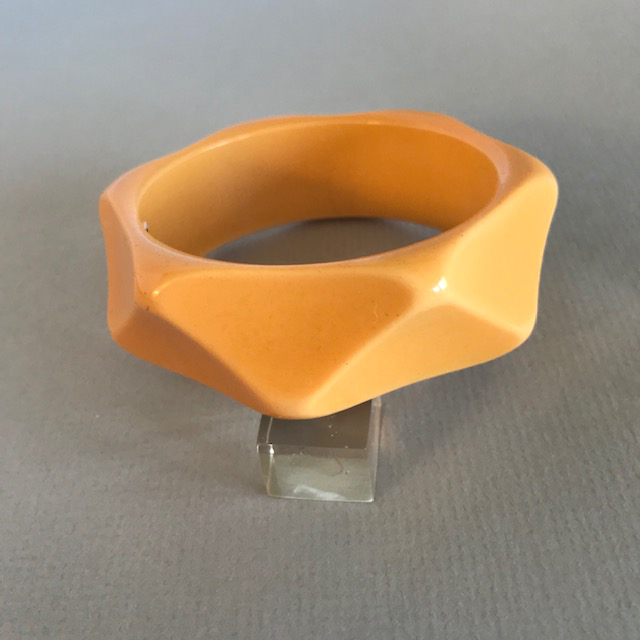 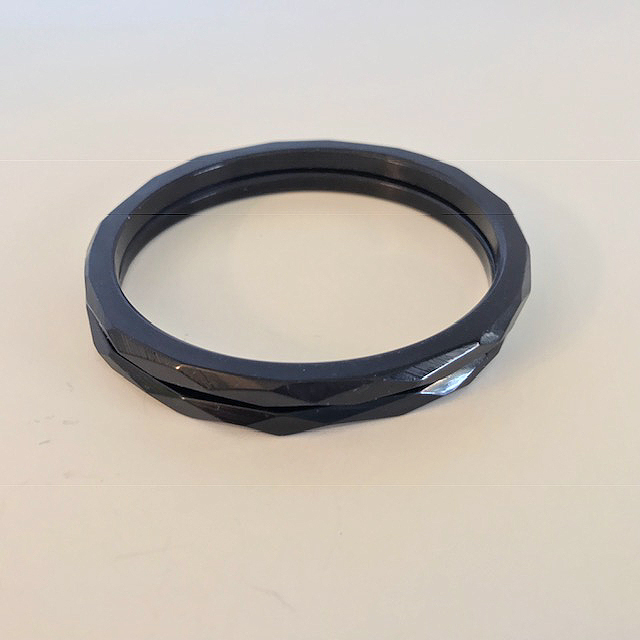 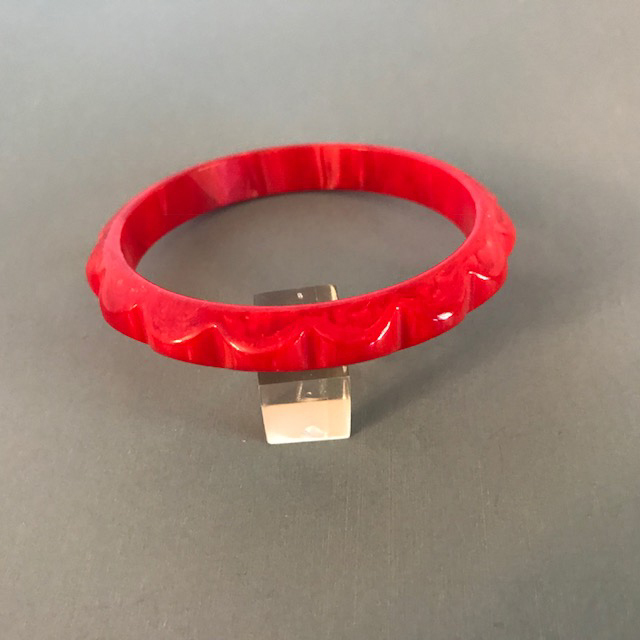 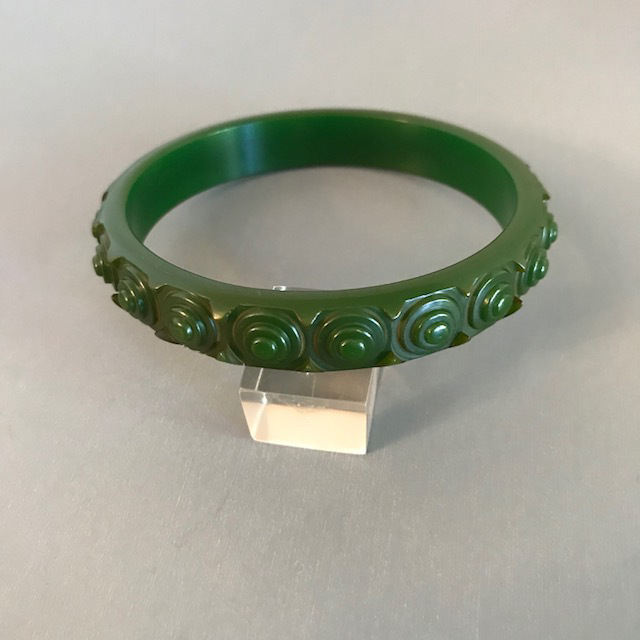 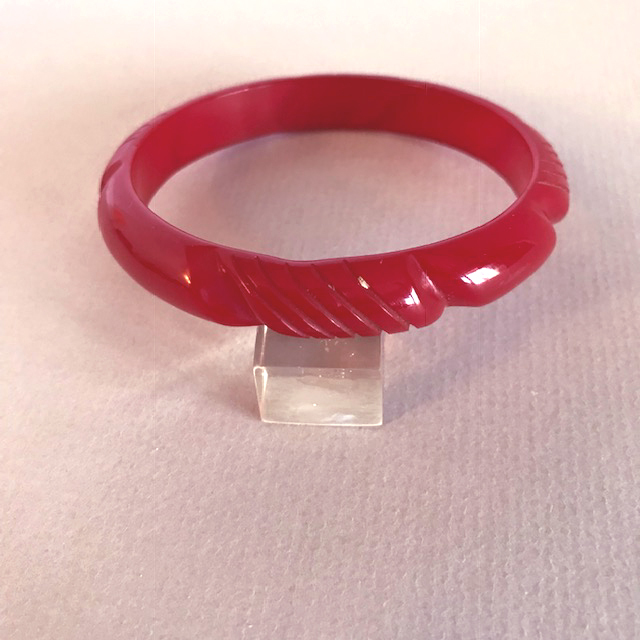 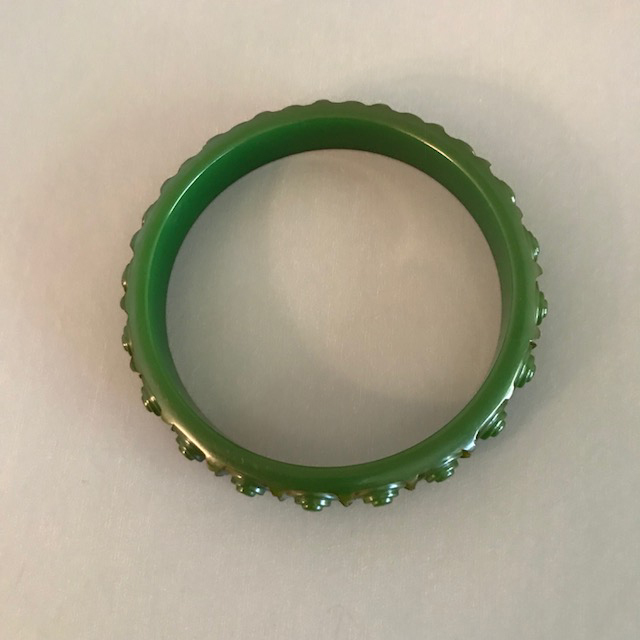 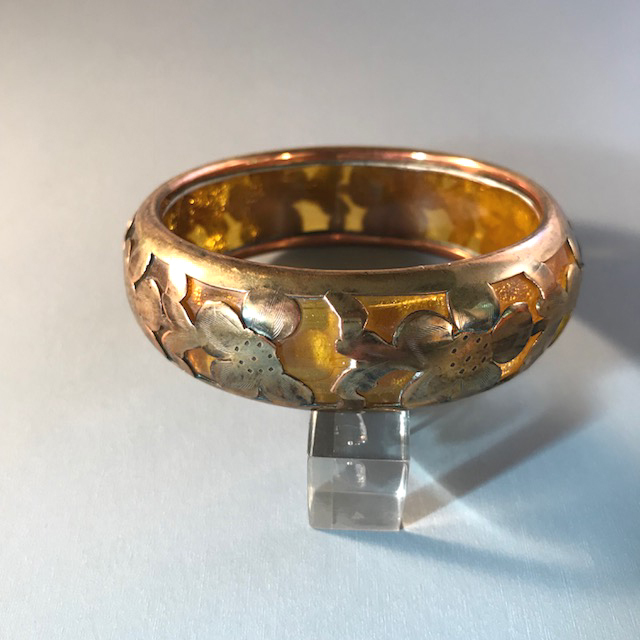 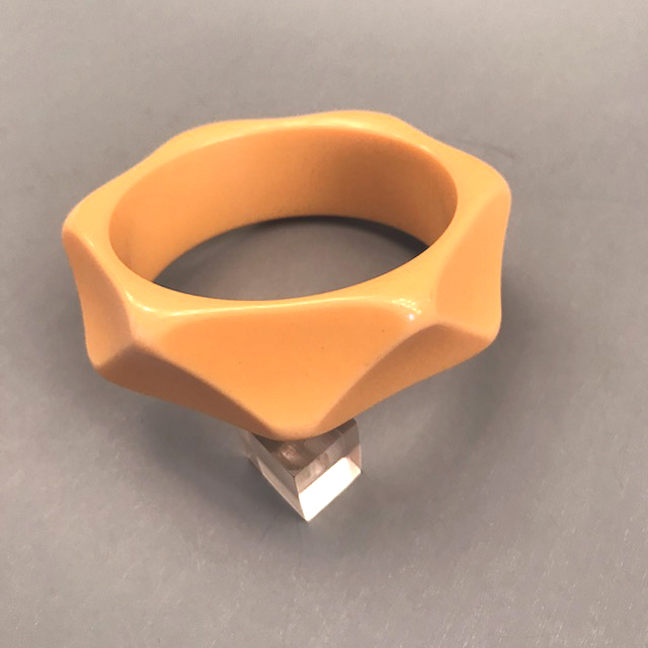 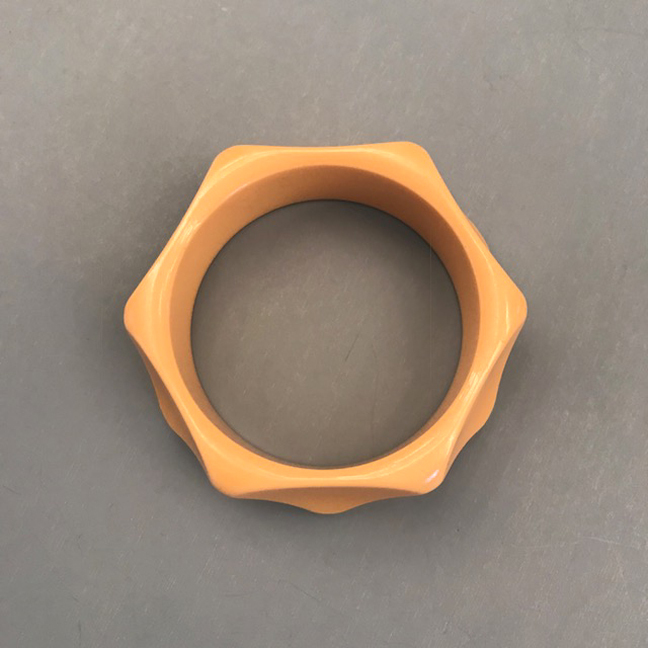 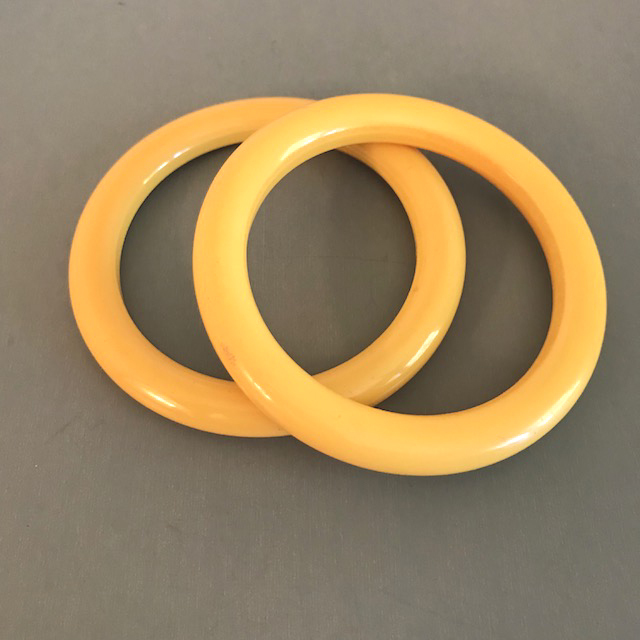 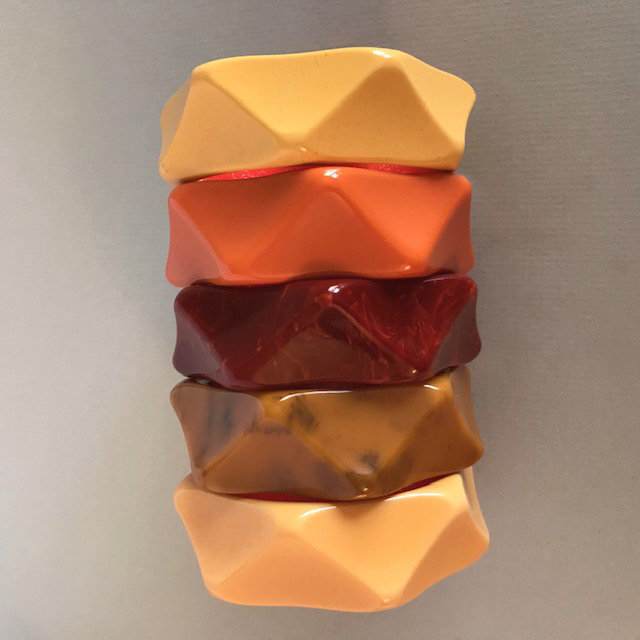 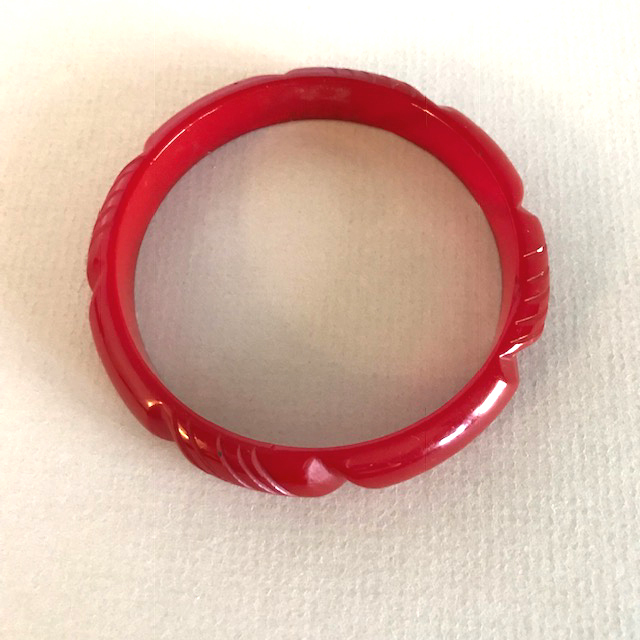 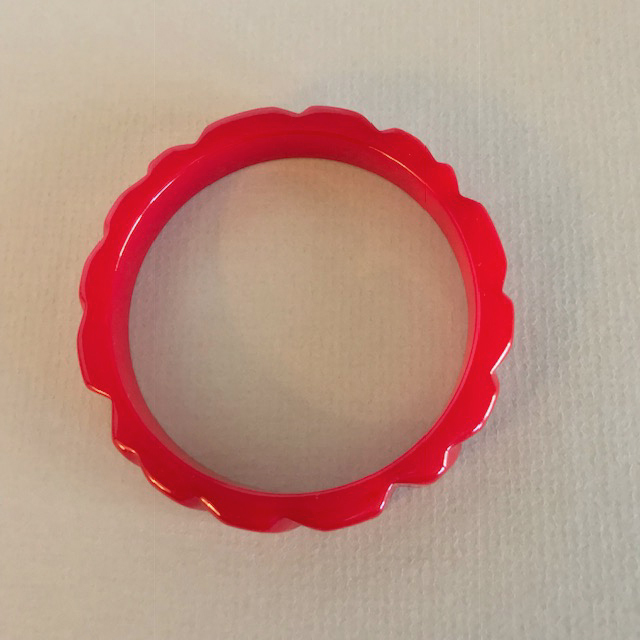 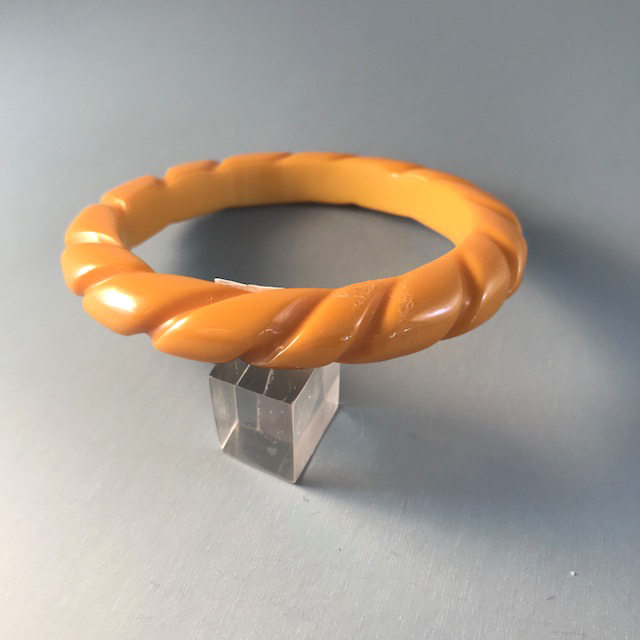 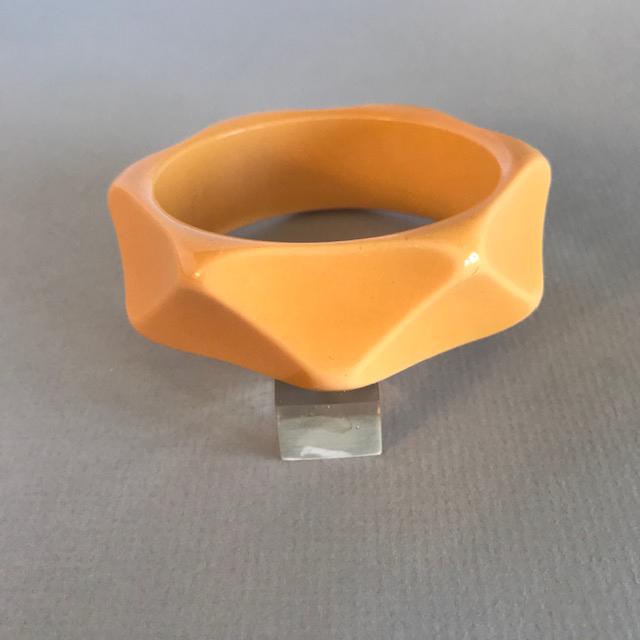 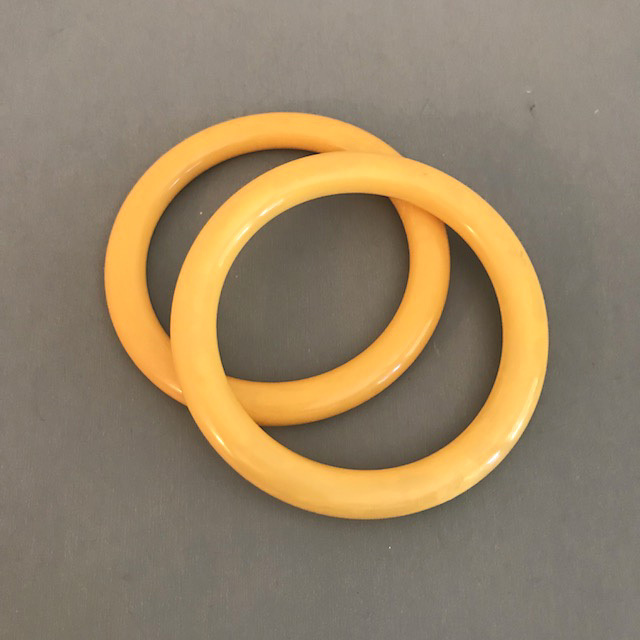 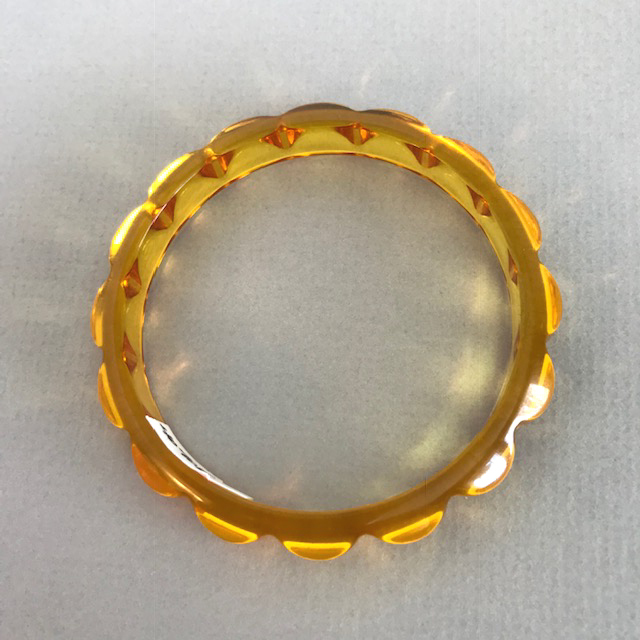 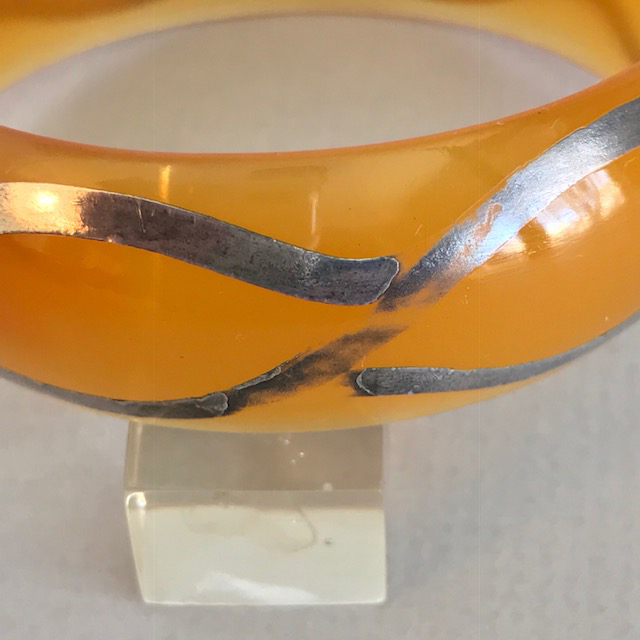 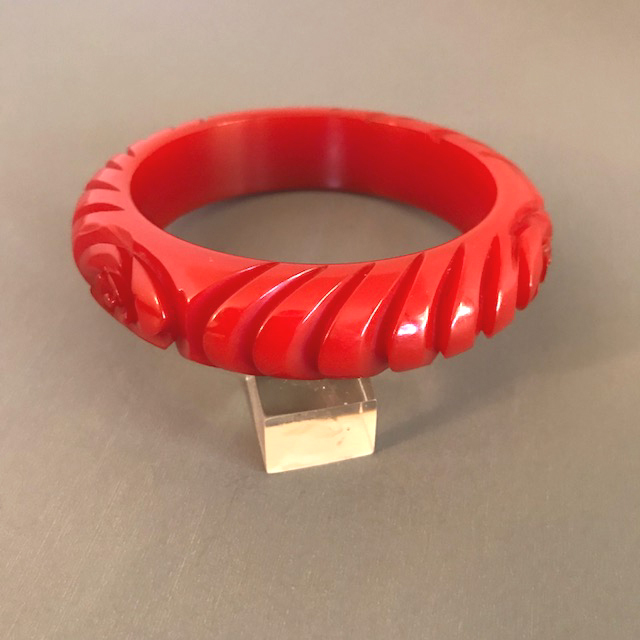 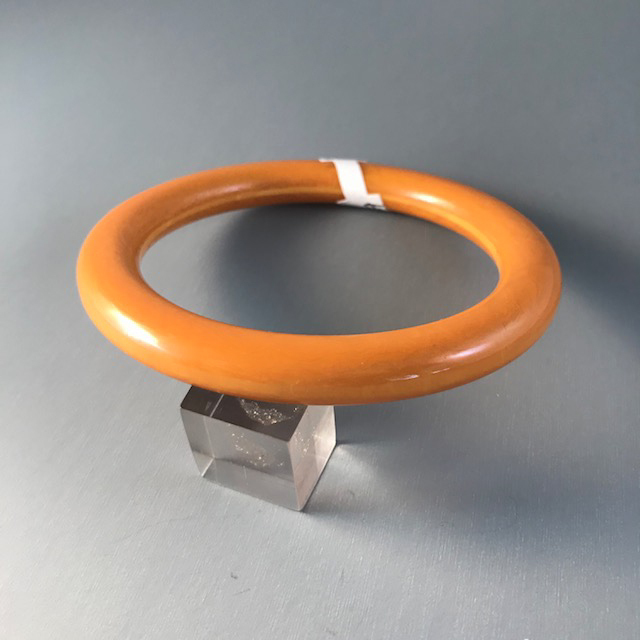 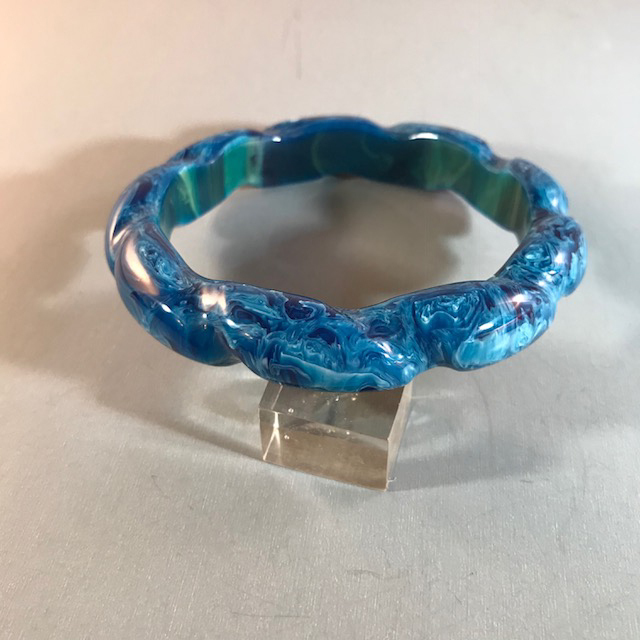 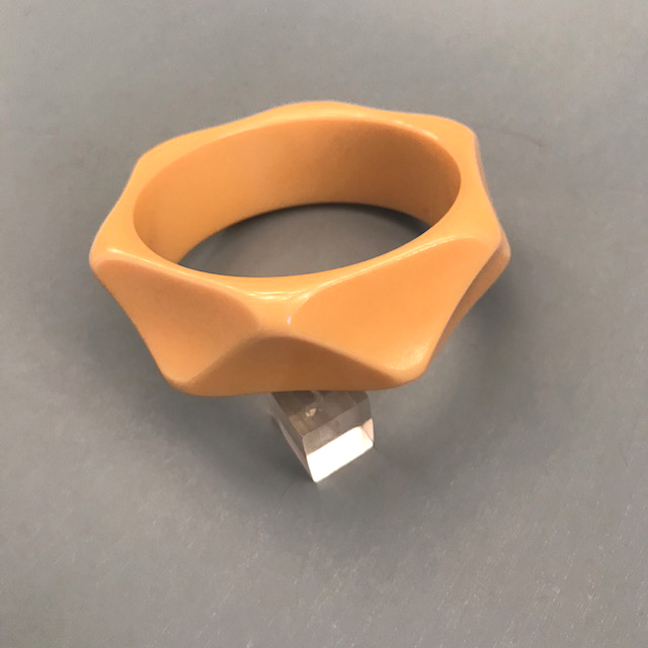 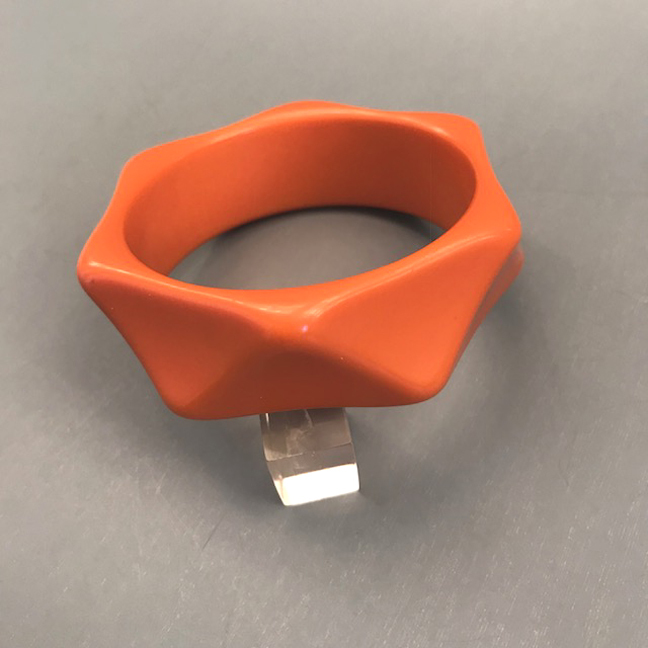 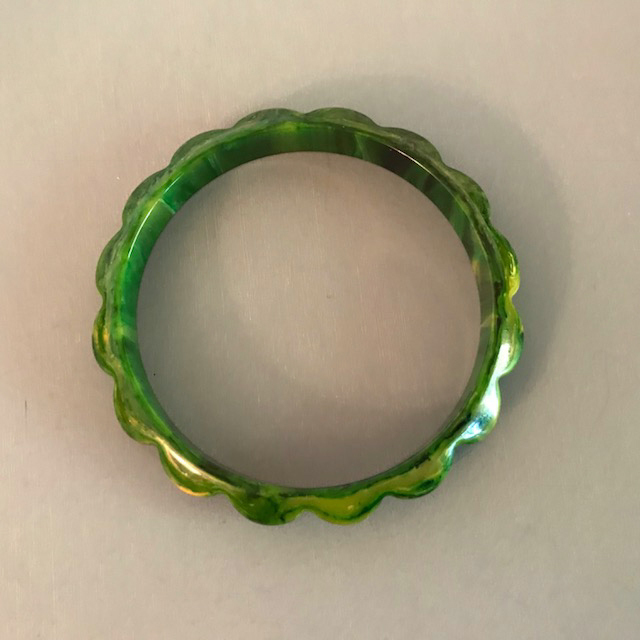 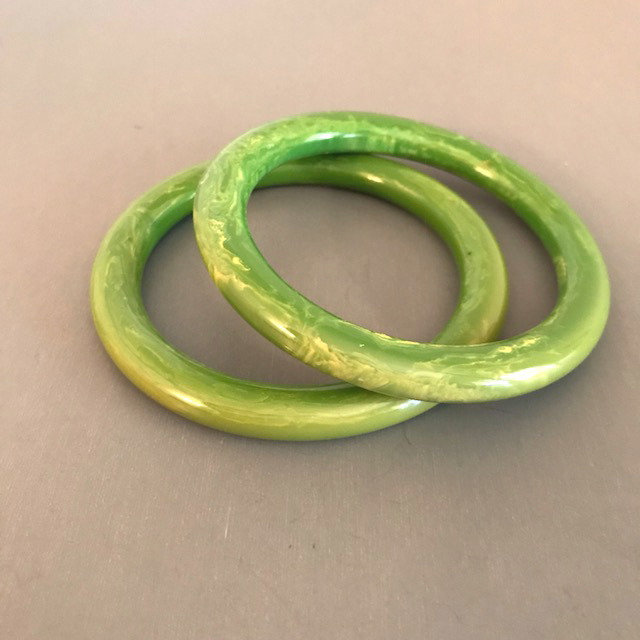 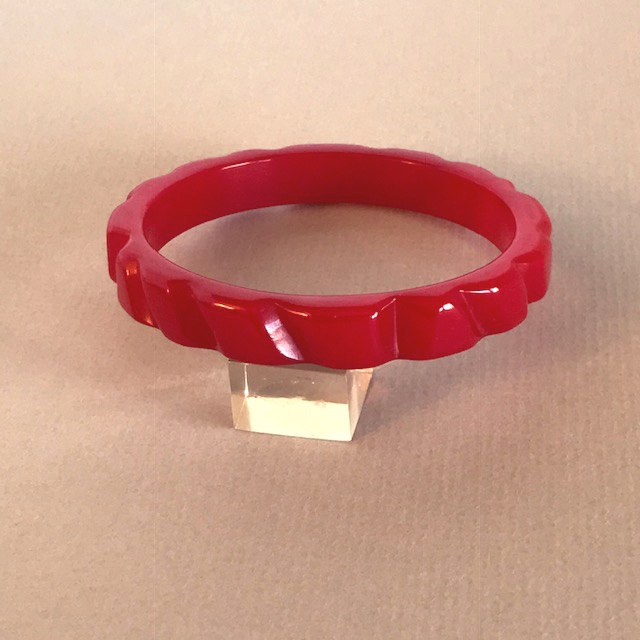 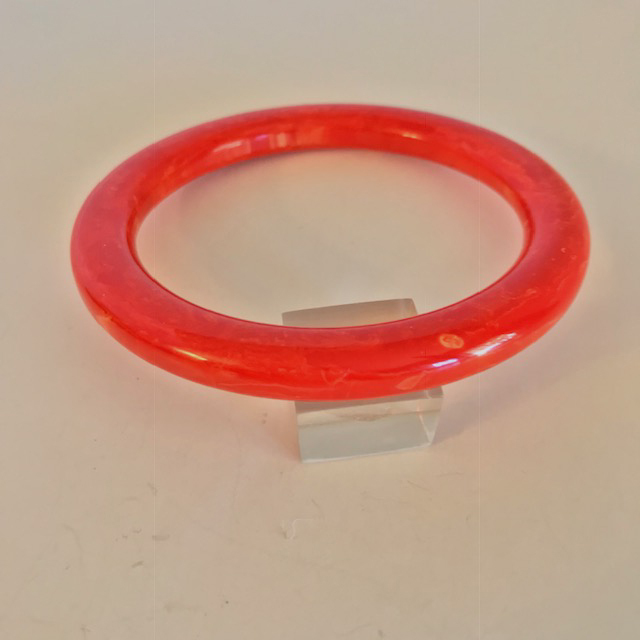 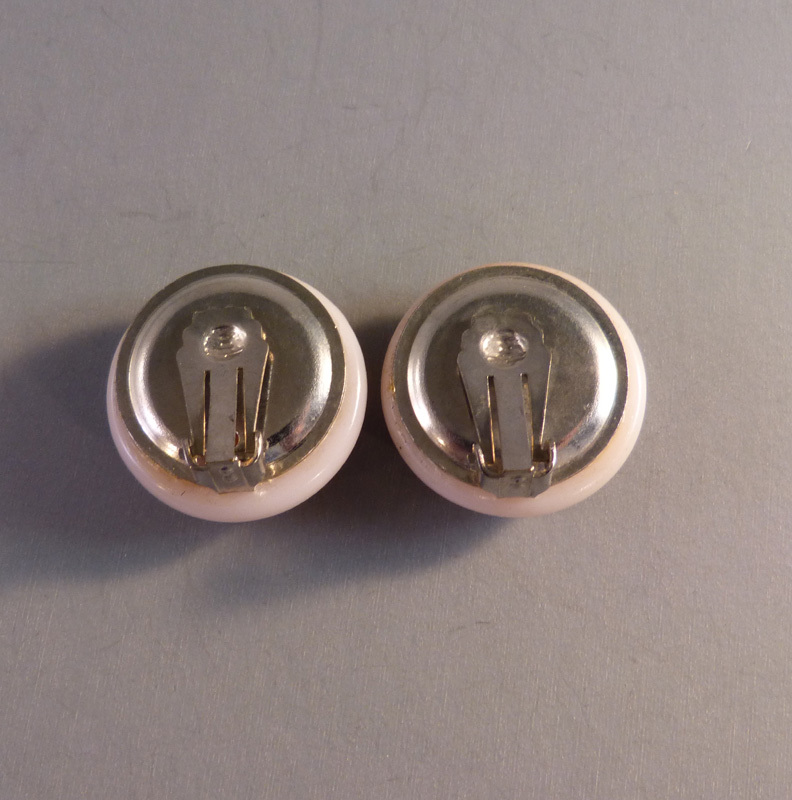 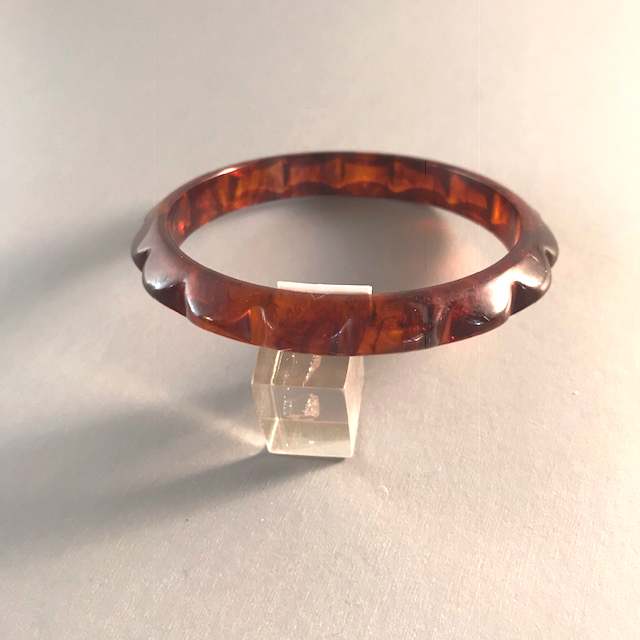 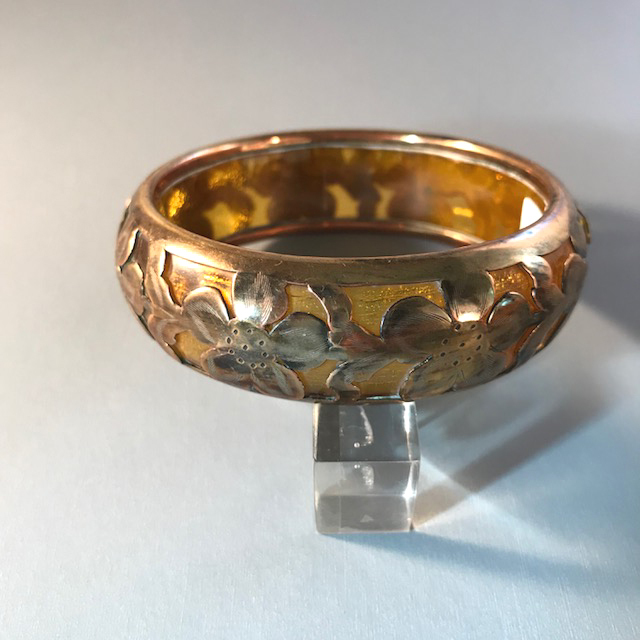 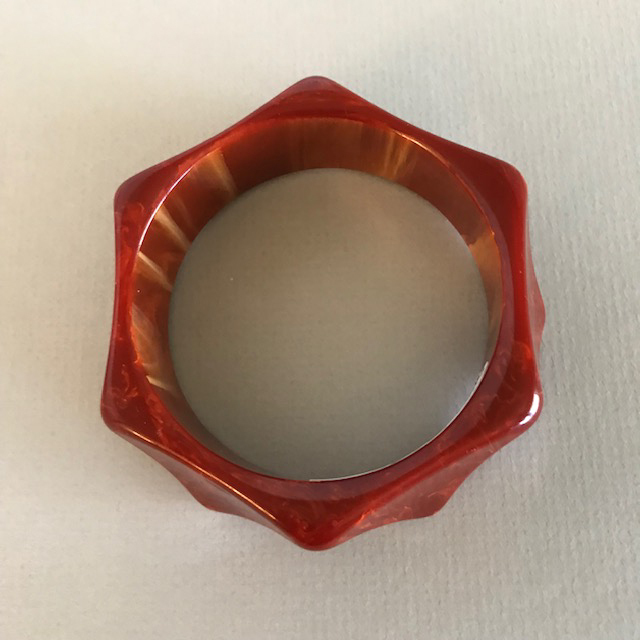 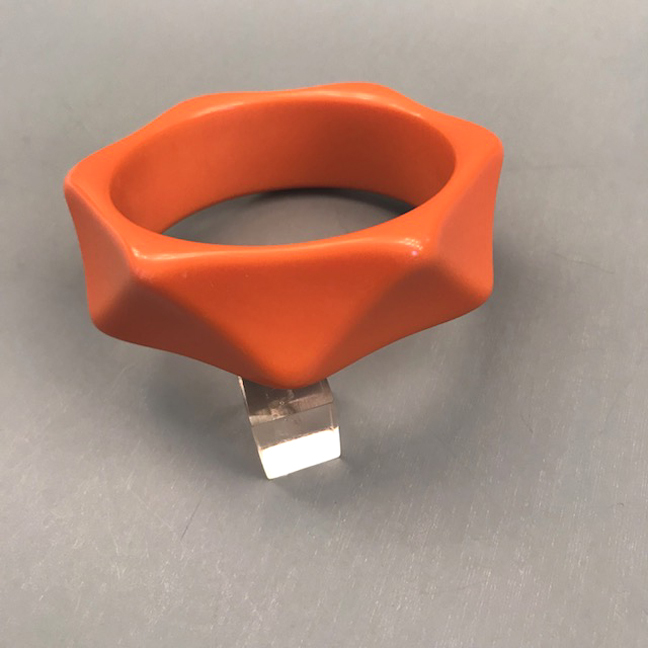 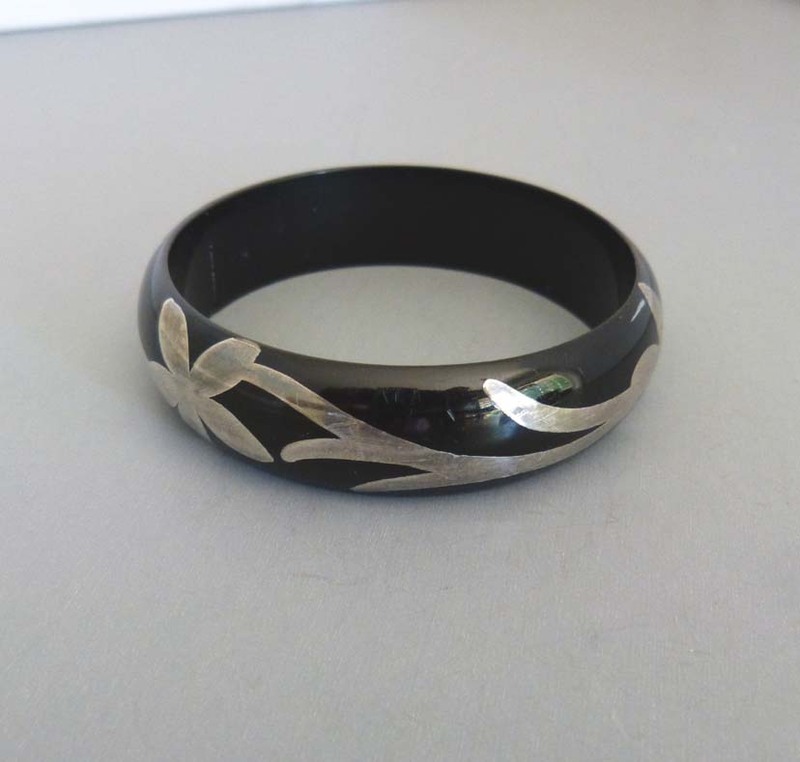 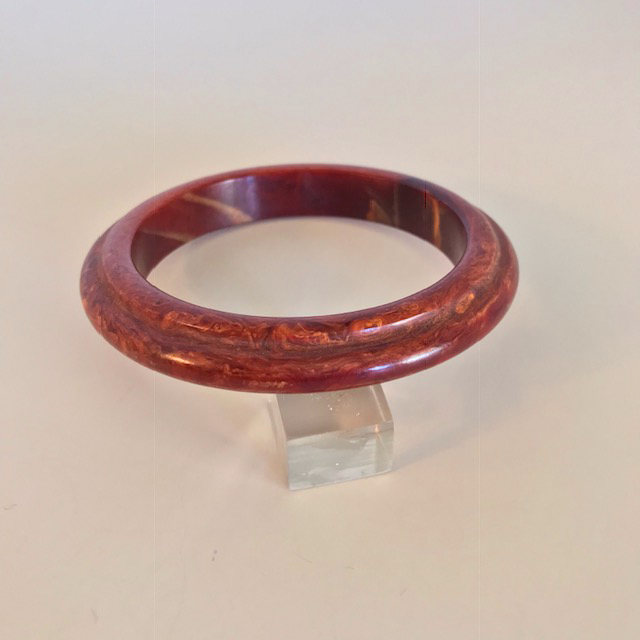 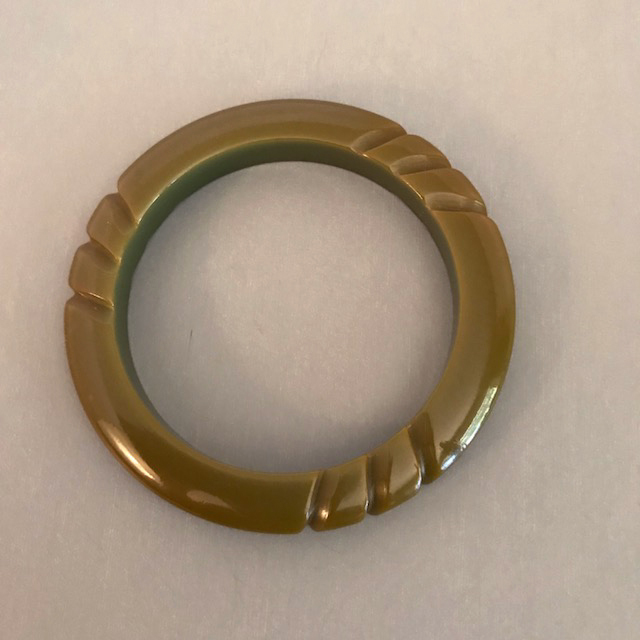 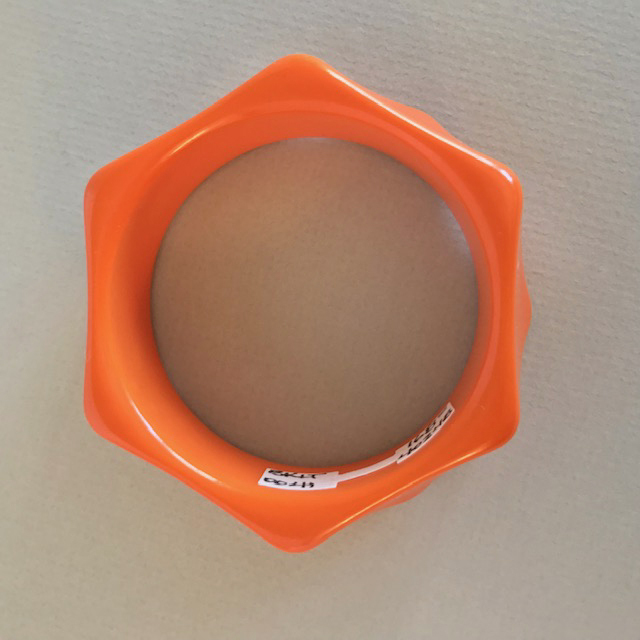 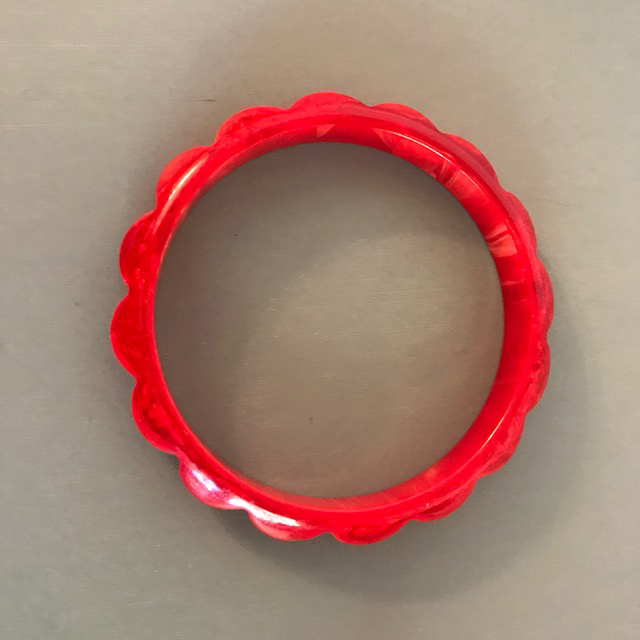 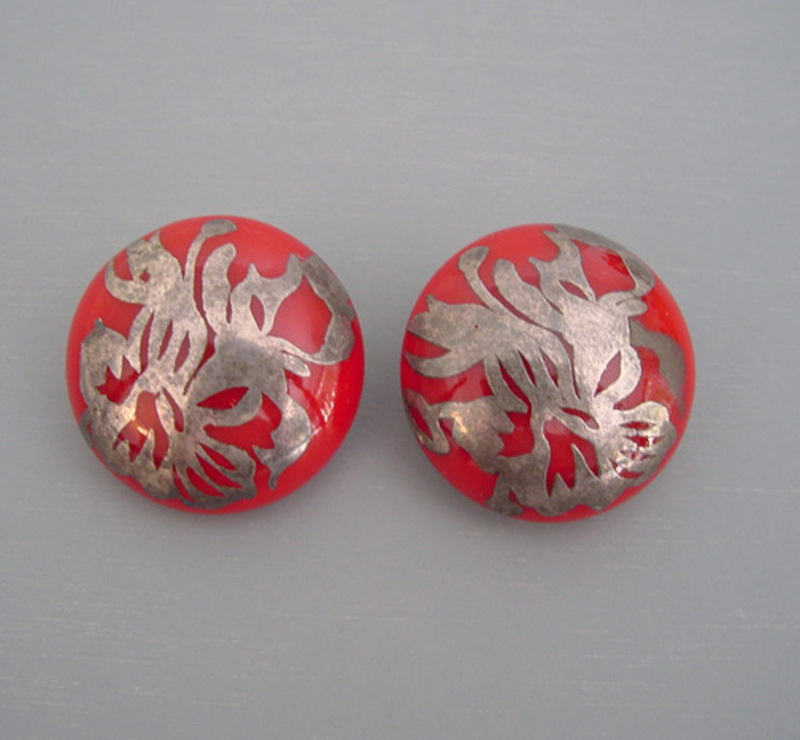 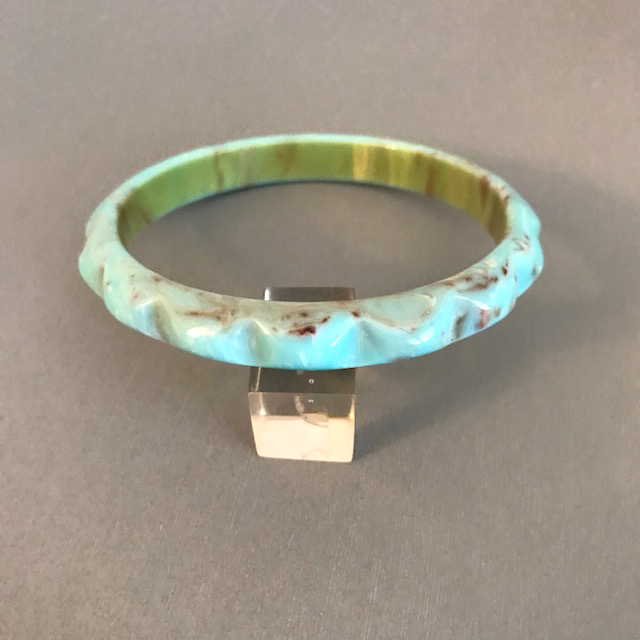 Today, not only the vintage bakelite jewelry is collected, but also the work of contemporary Bakelite artisans who are fashioning different styles of jewelry using old stock and bakelite pieces and parts. 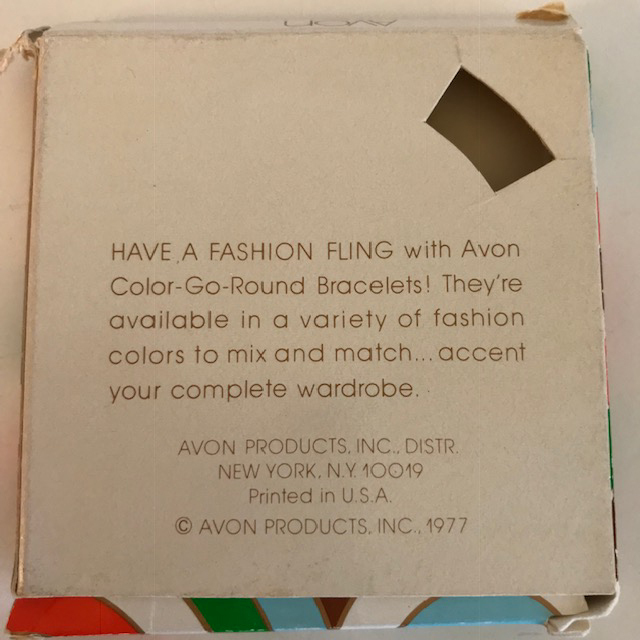 Sadly, it is also being faked, like so many things these days, so buy from a reputable dealer. 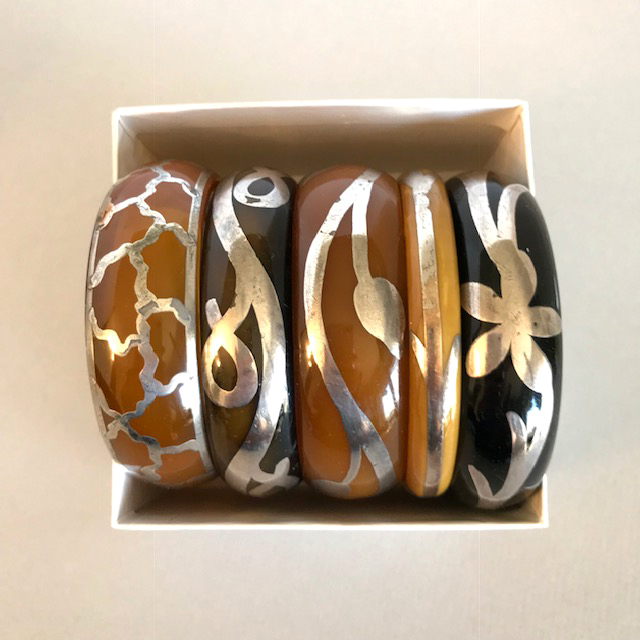 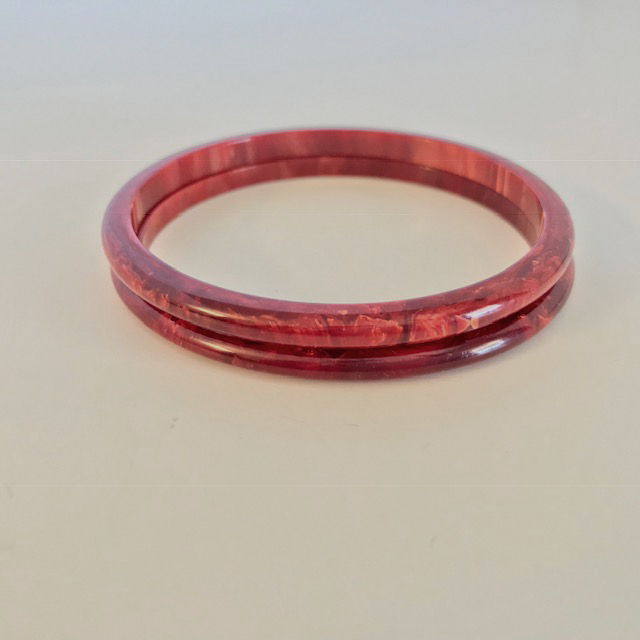 It is such fun to wear, and mixing and matching stacks of bangles is just part of the personalization of your own collection. 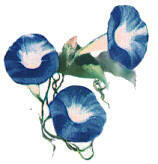 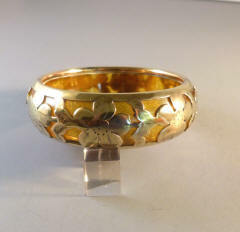 We have a wonderful selection on our web site and enjoy both buying and selling it. 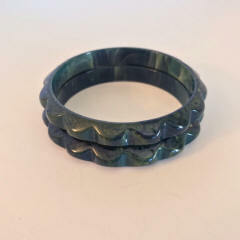 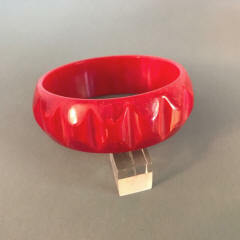 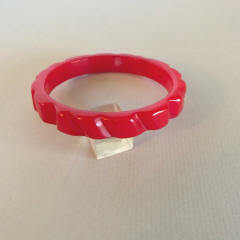 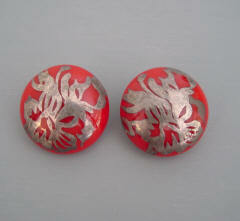 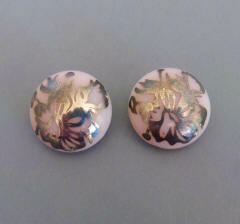 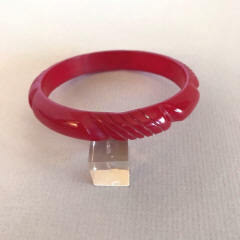 See our bakelite feature in Jewel Chat. 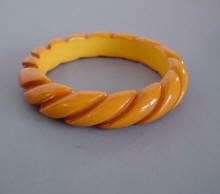 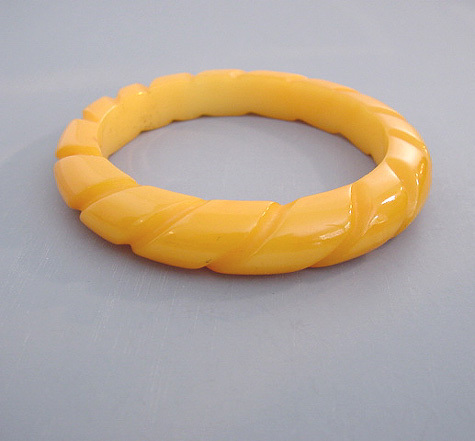 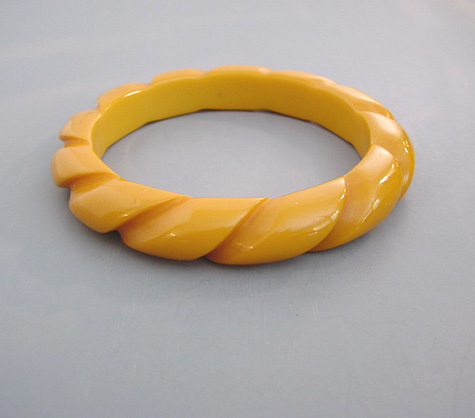 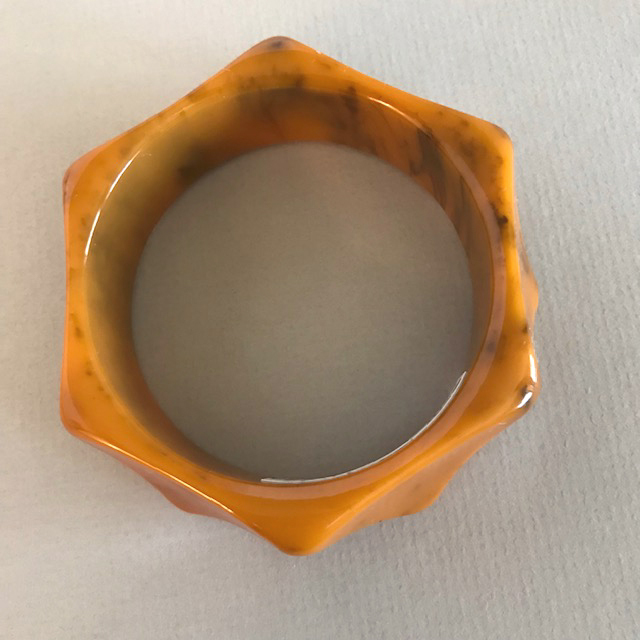 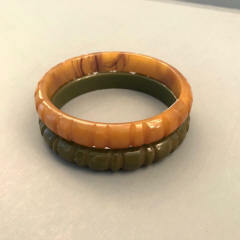 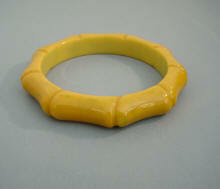 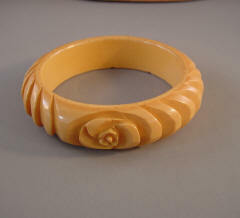 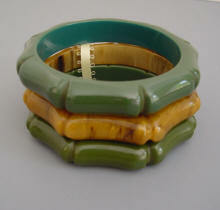 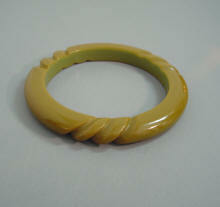 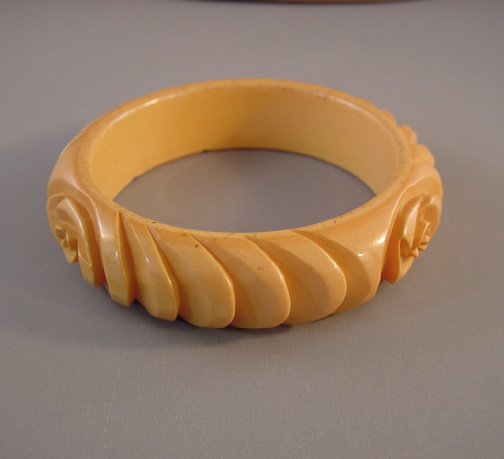 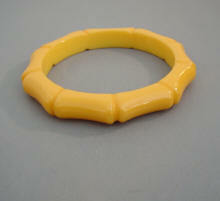 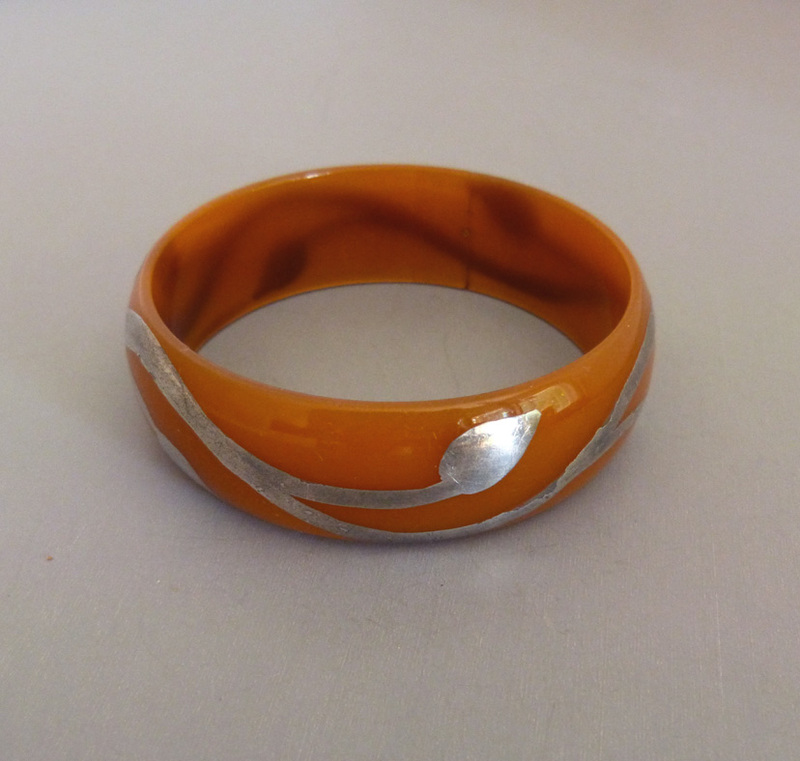 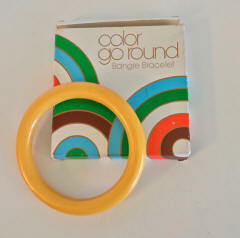 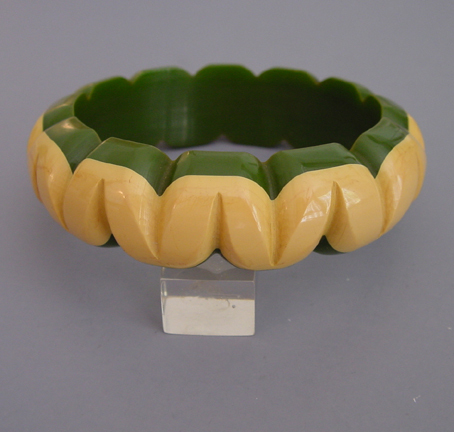 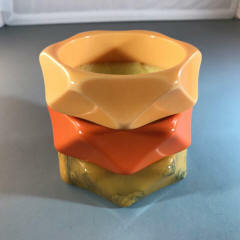 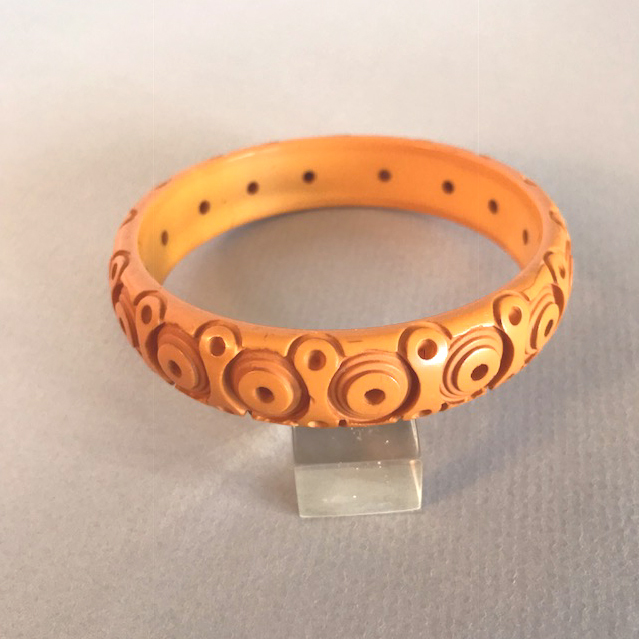 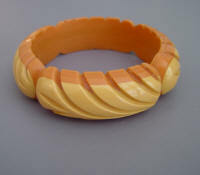 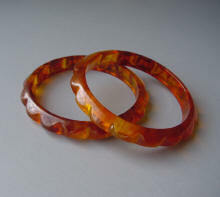 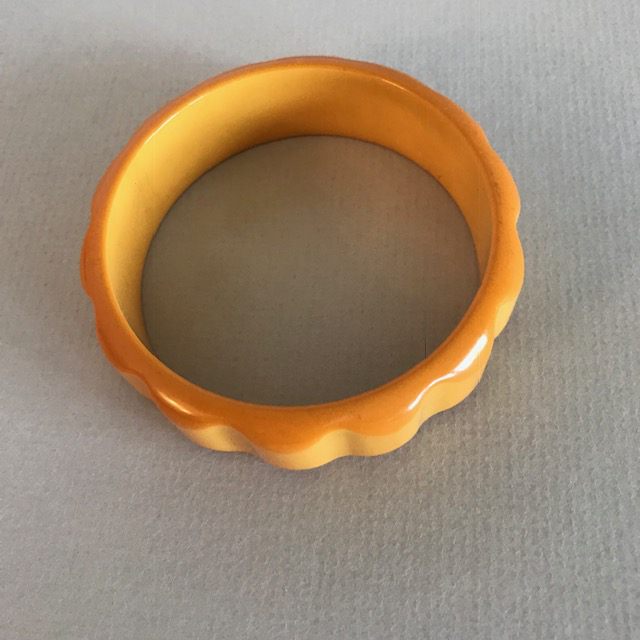 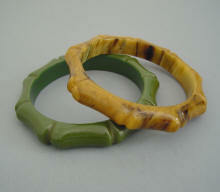 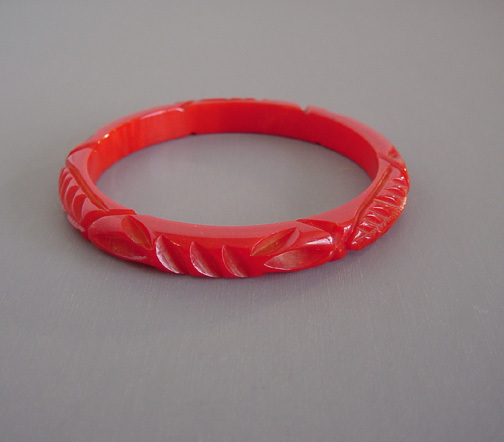 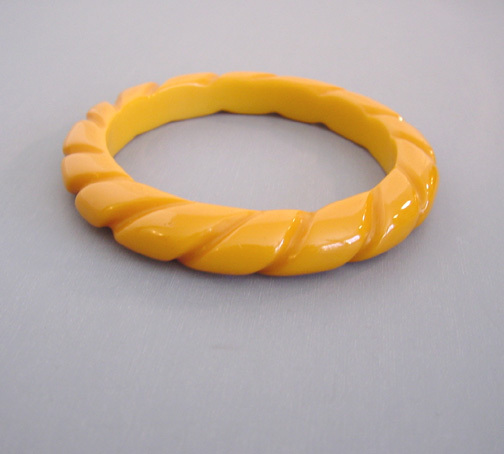 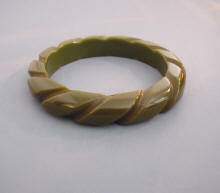 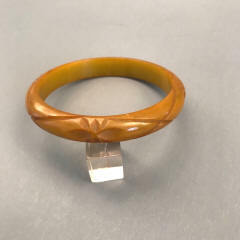 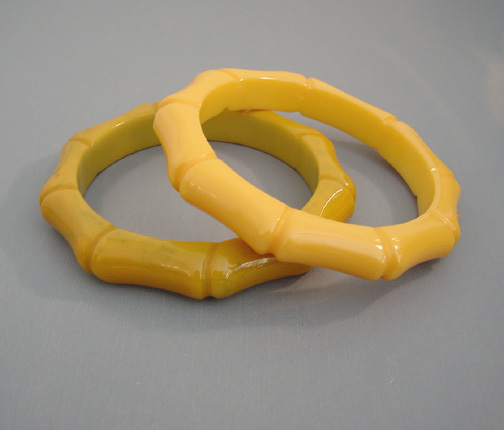 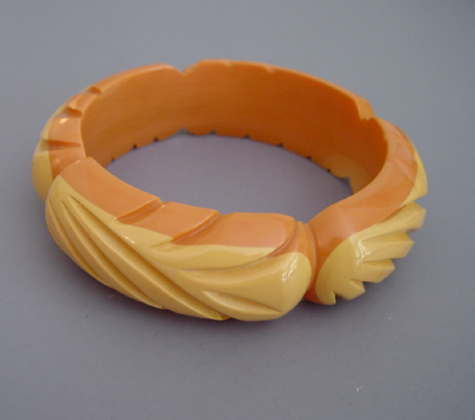 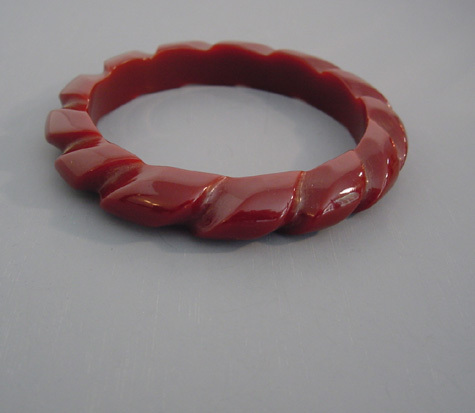 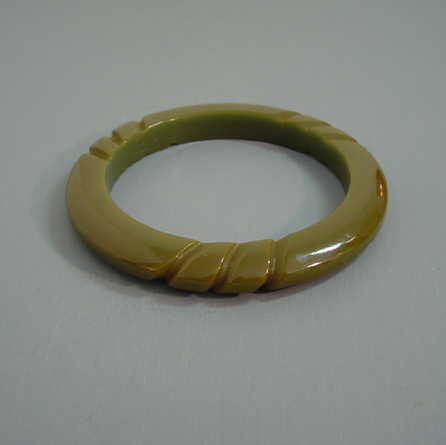 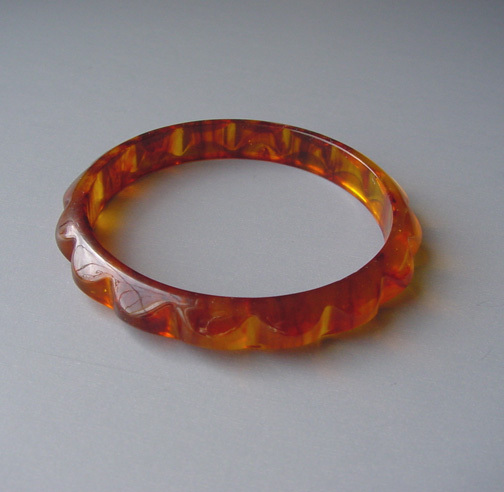 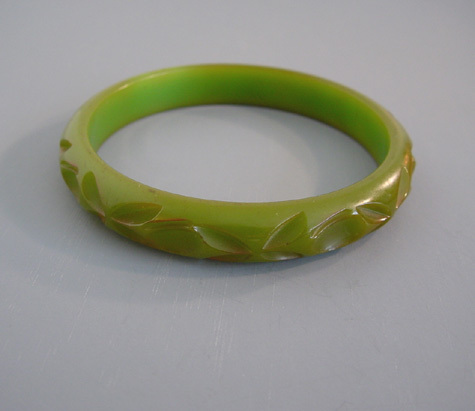 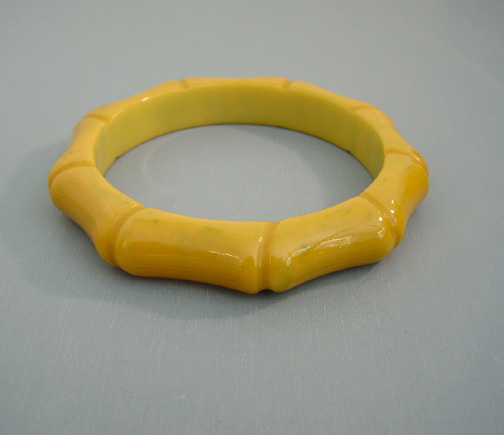 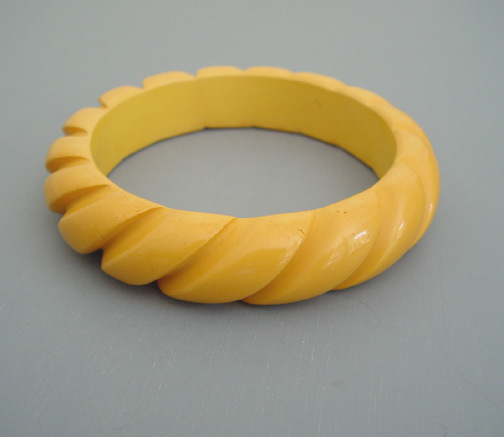 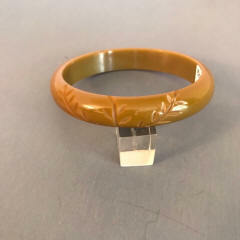 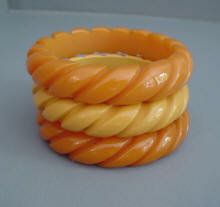 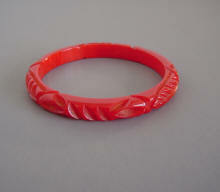 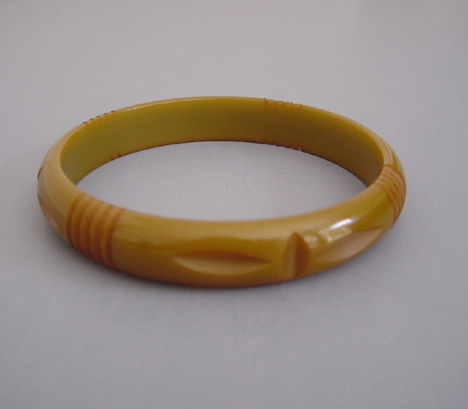 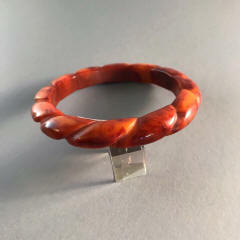 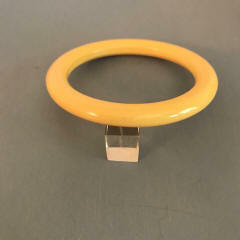 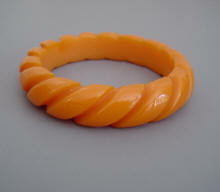 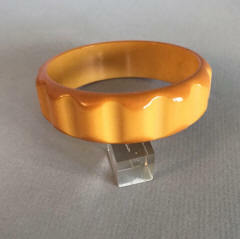 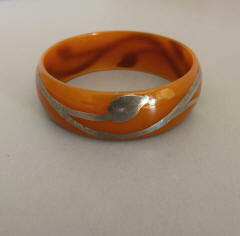 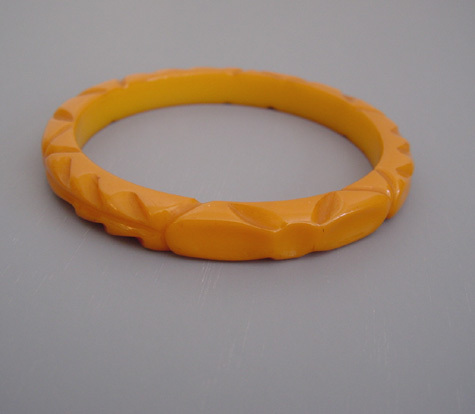 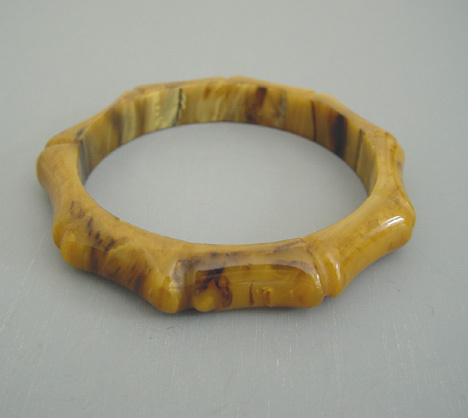 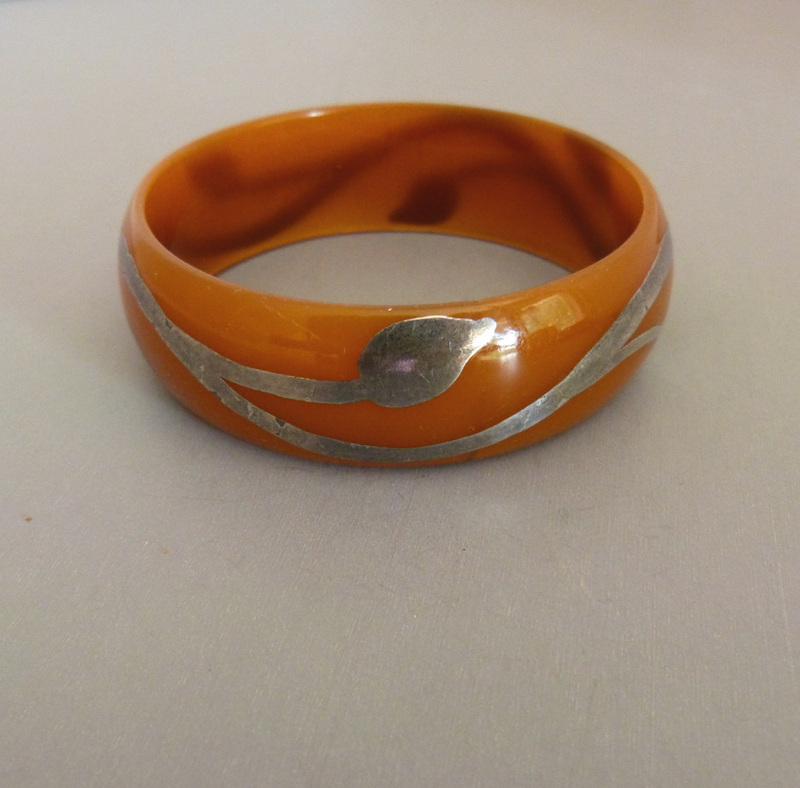 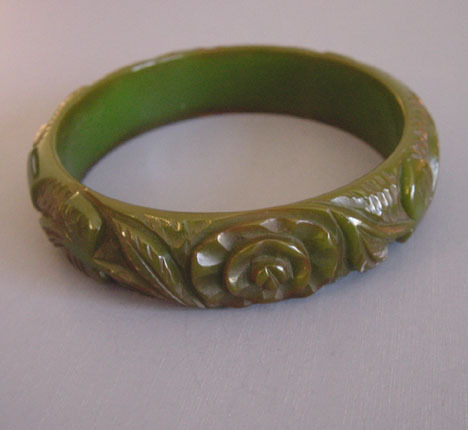 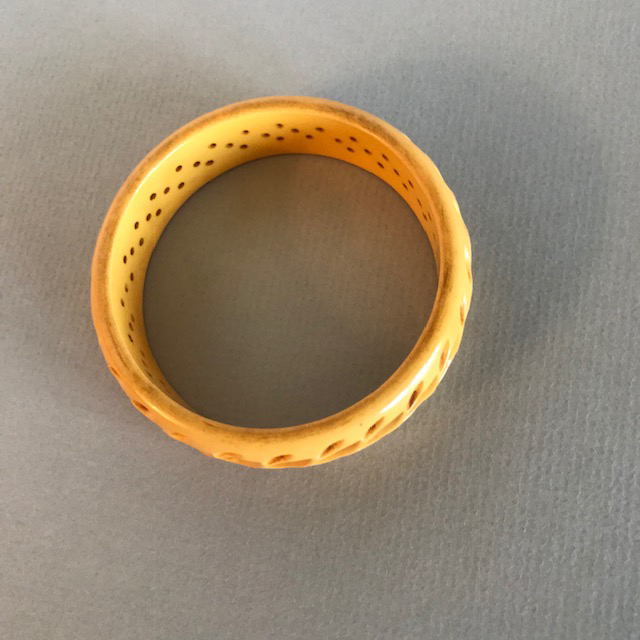 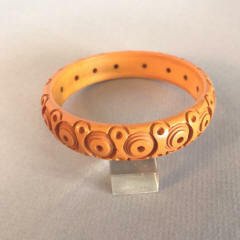 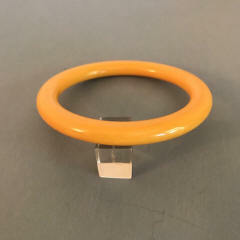 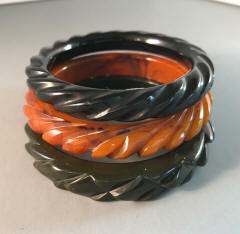 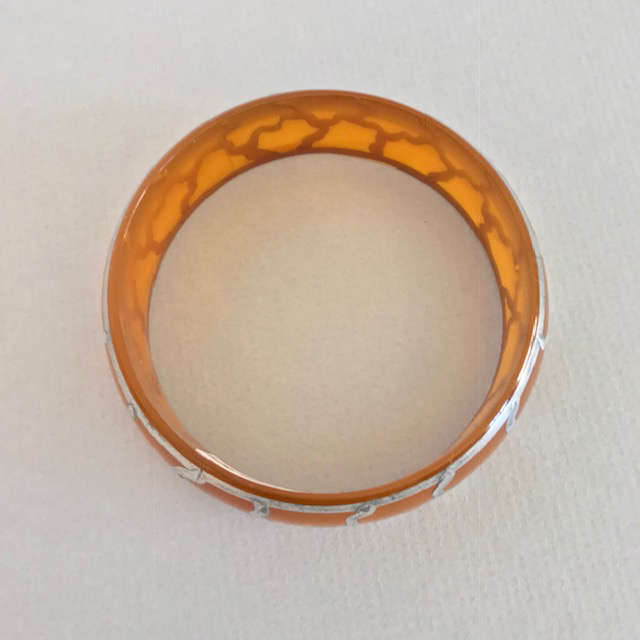 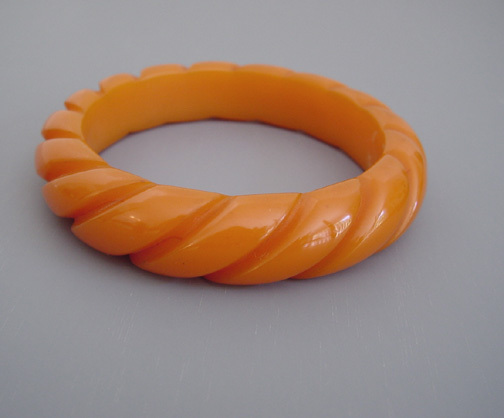 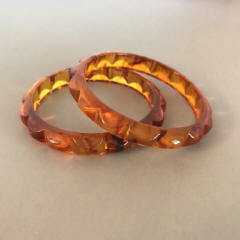 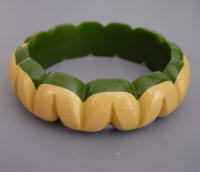 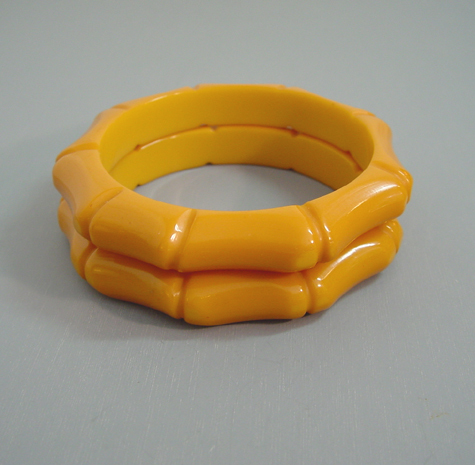 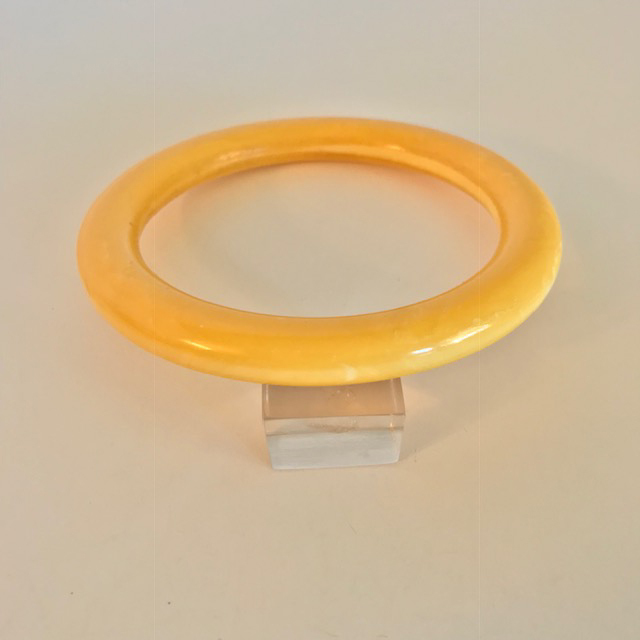 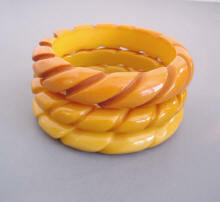 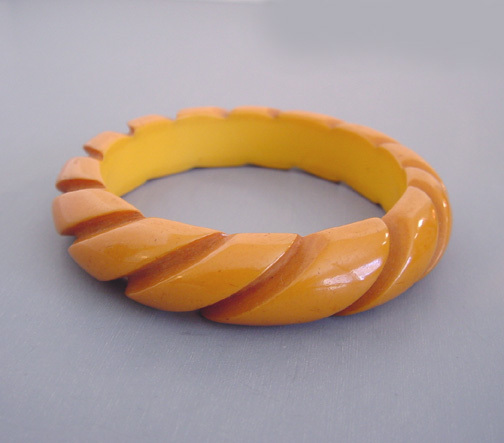 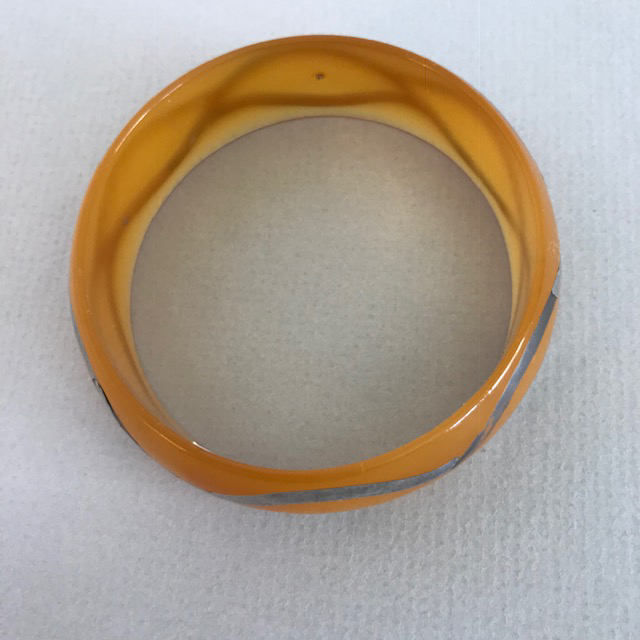 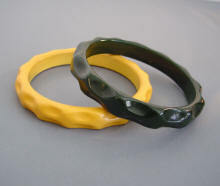 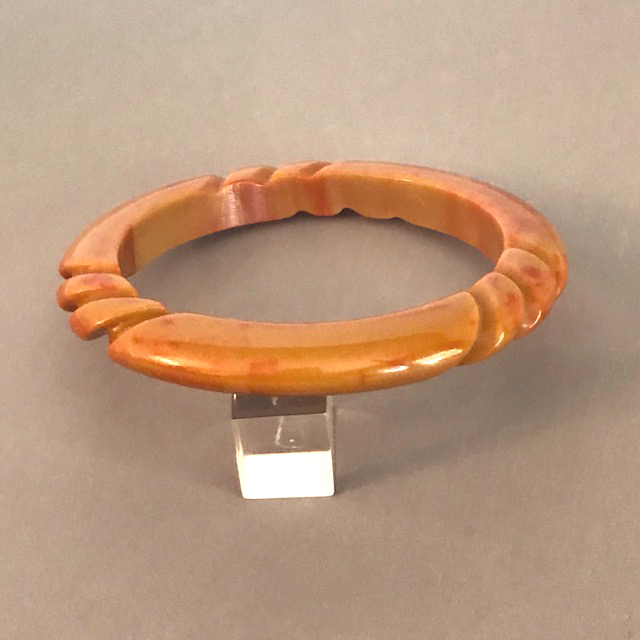 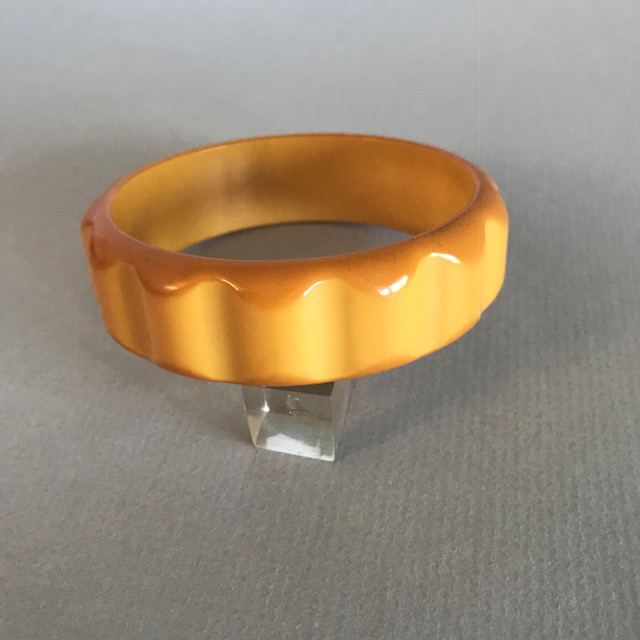 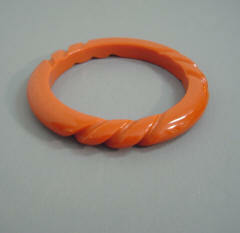 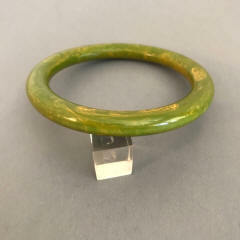 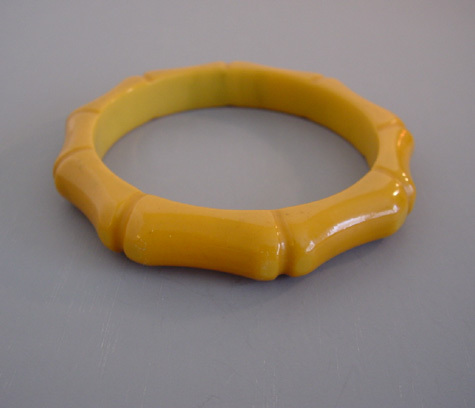 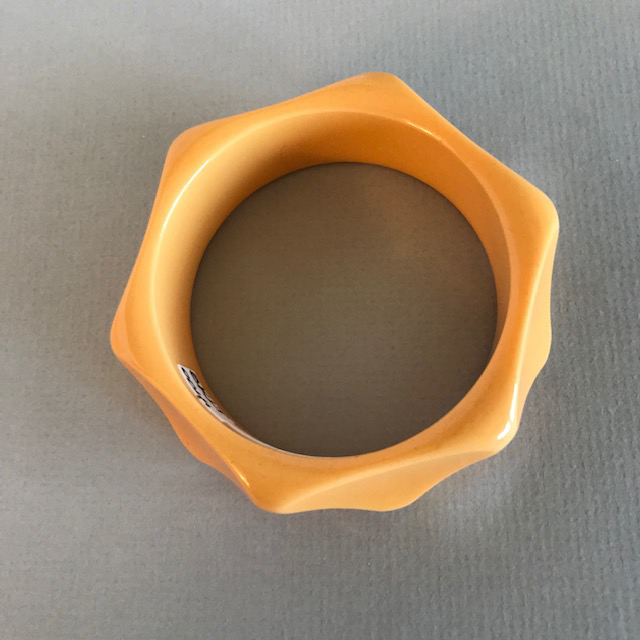 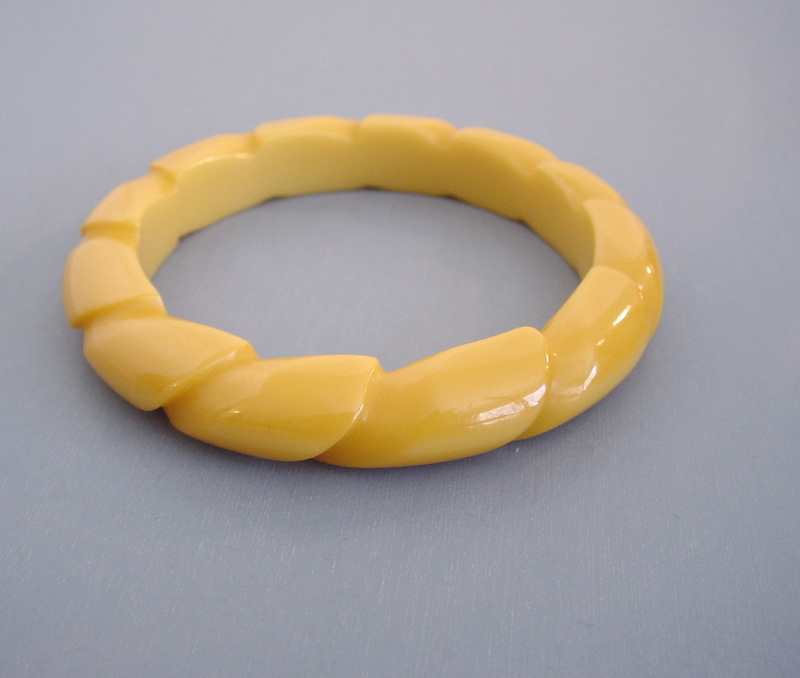 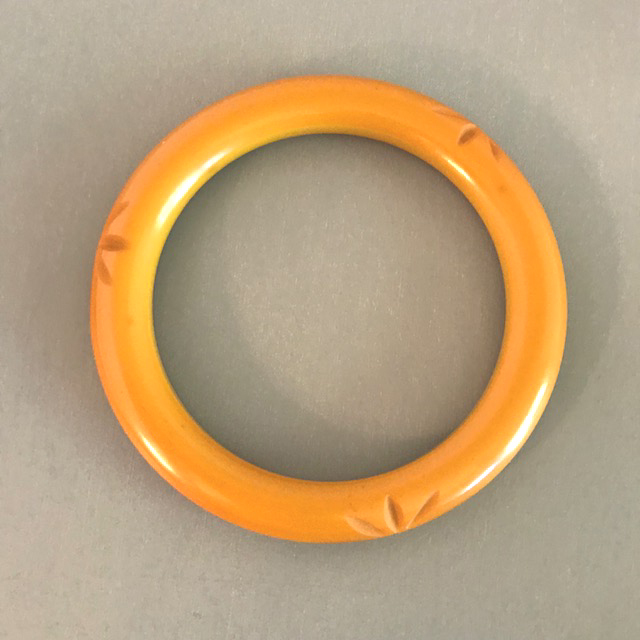 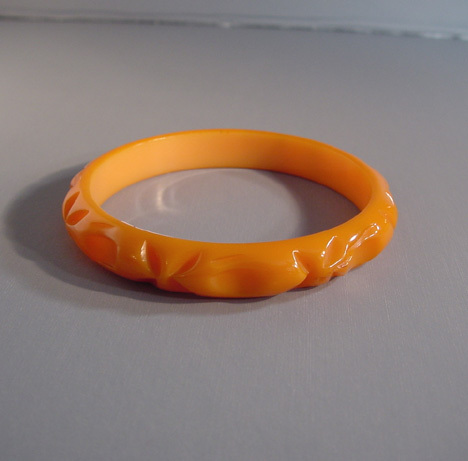 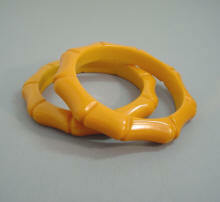 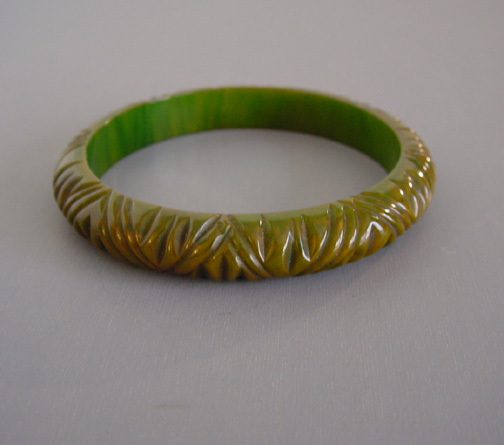 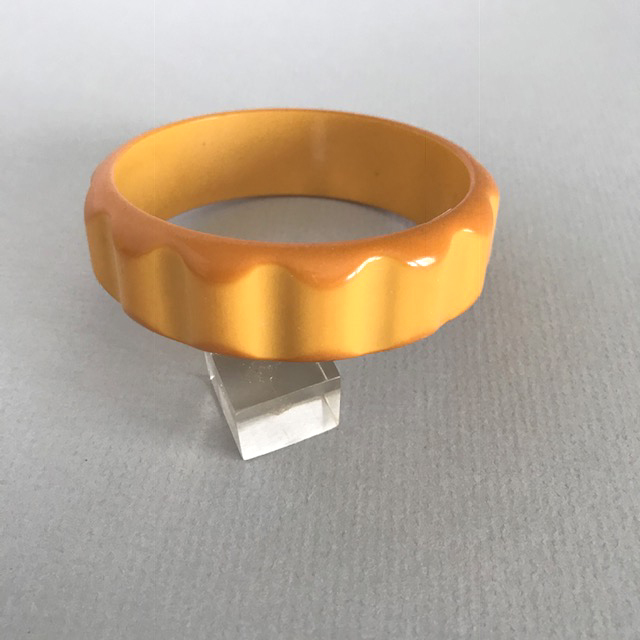 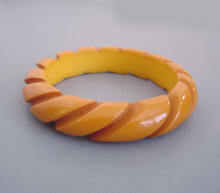 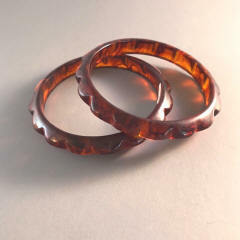 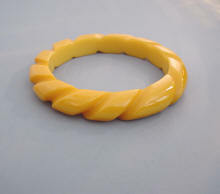 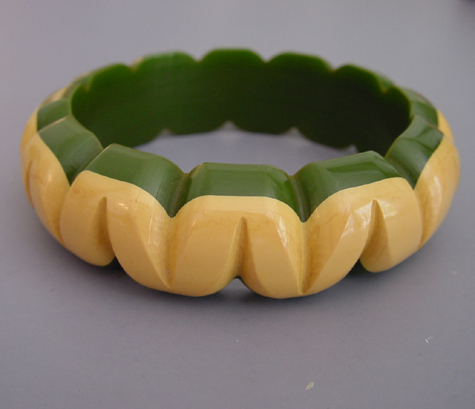 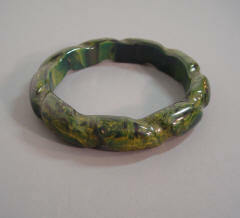 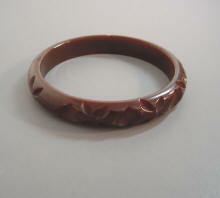 BAKELITE butterscotch carved and tumbled bangle, 2-1/2" by 1/3" by 1/4". 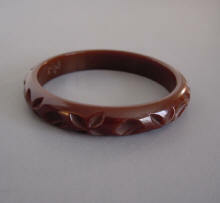 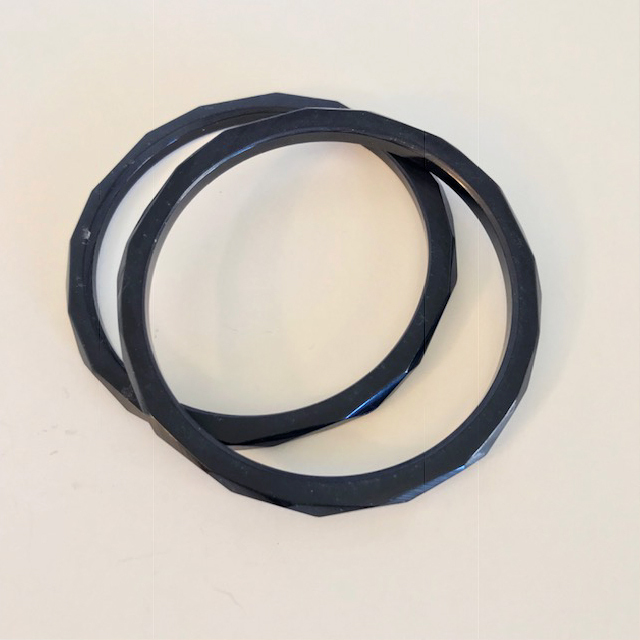 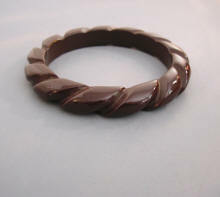 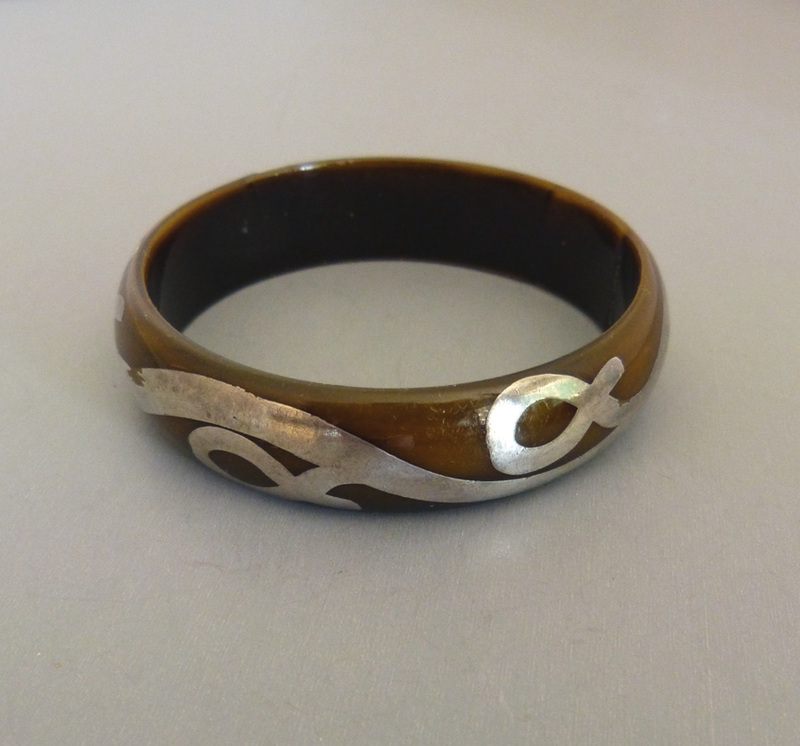 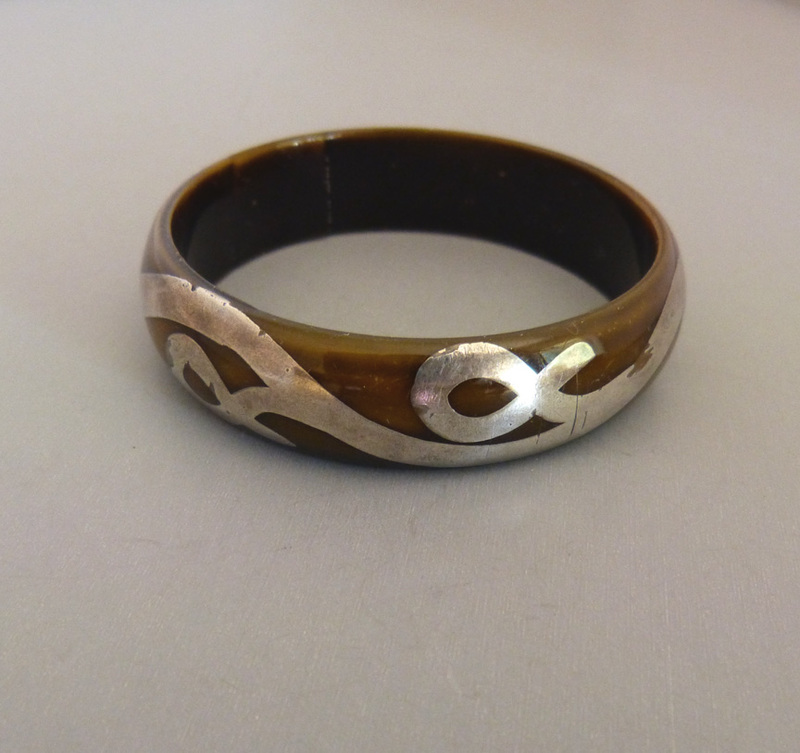 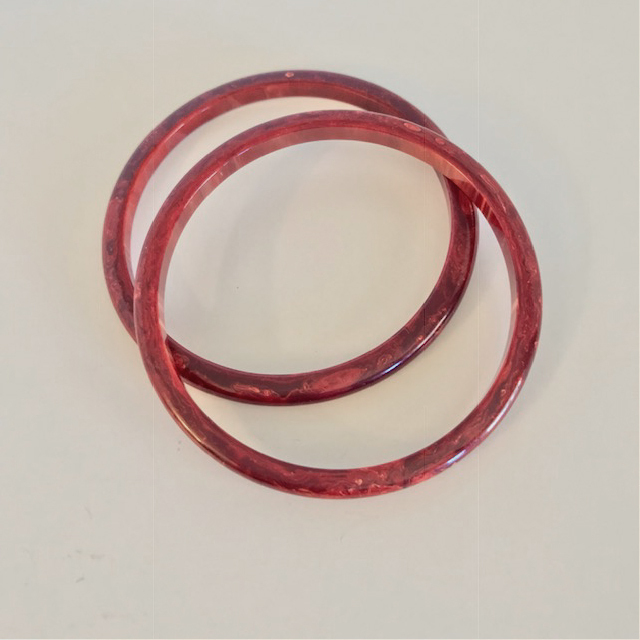 #B34910 BAKELITE SPACER STACK BAKELITE brown spacer bangle with carving, 2-1/2" by 1/2" by 1/3". 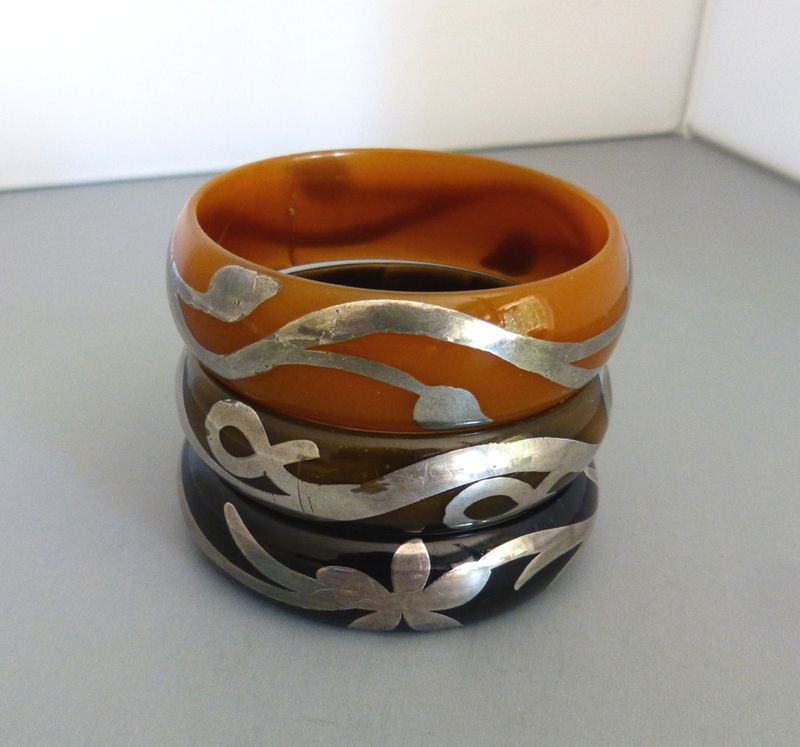 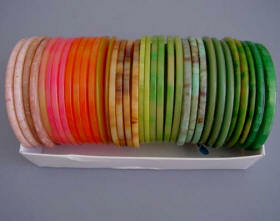 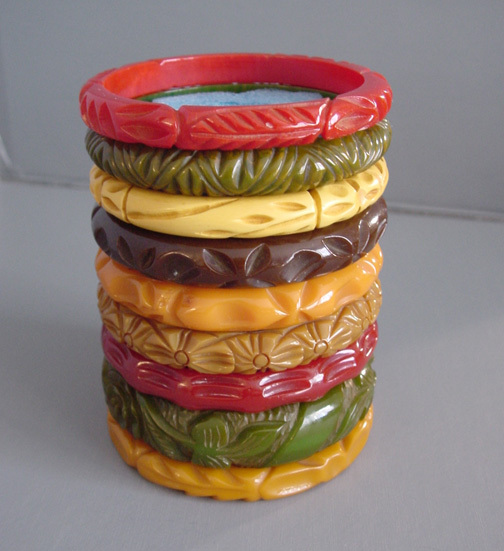 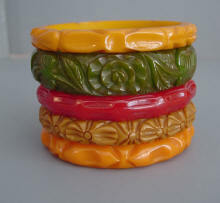 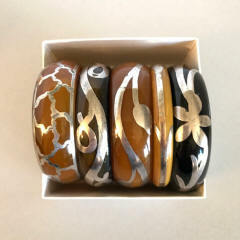 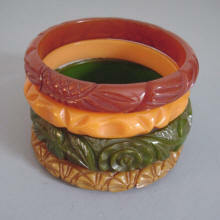 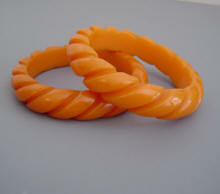 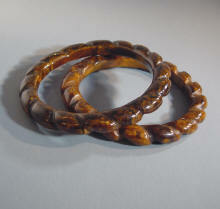 #B63695 BAKELITE stack of narrow but well carved bangles.